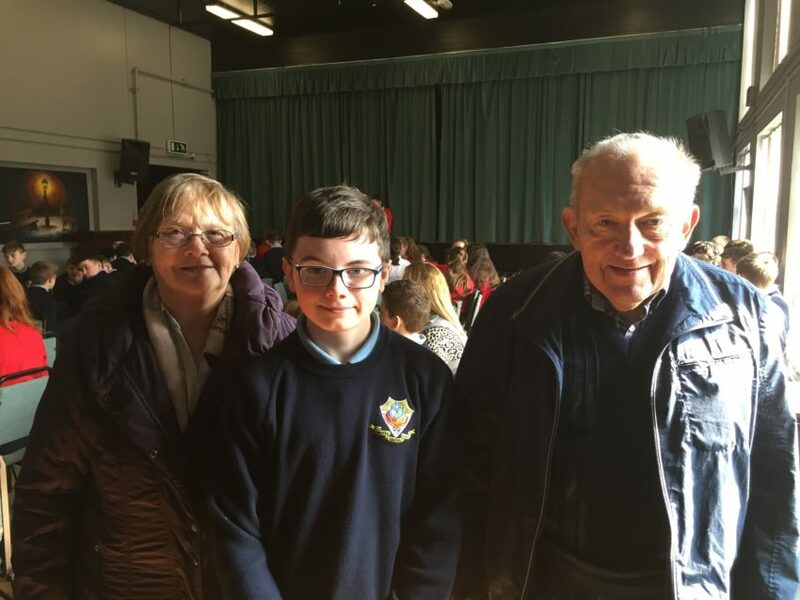 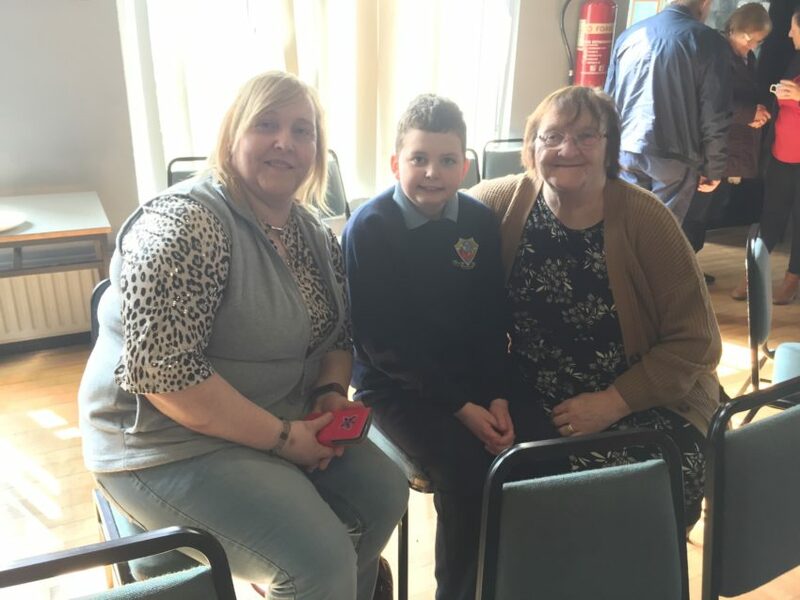 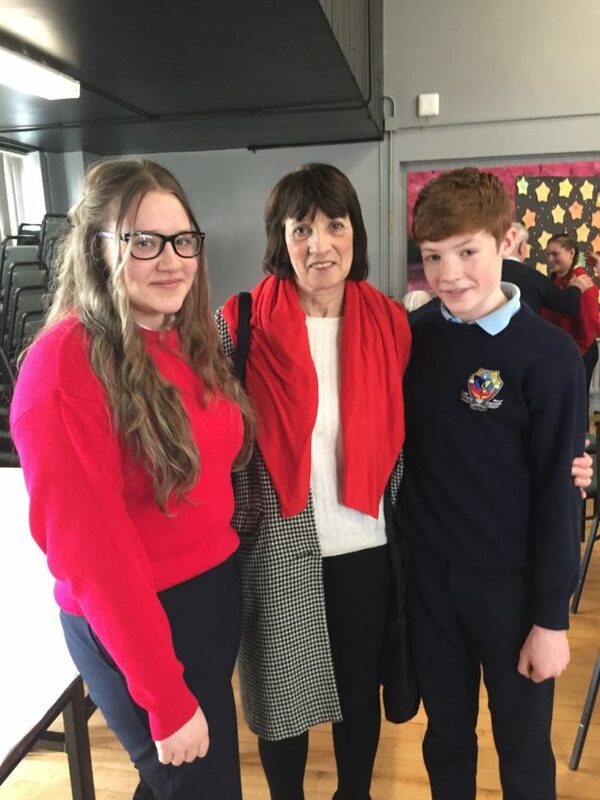 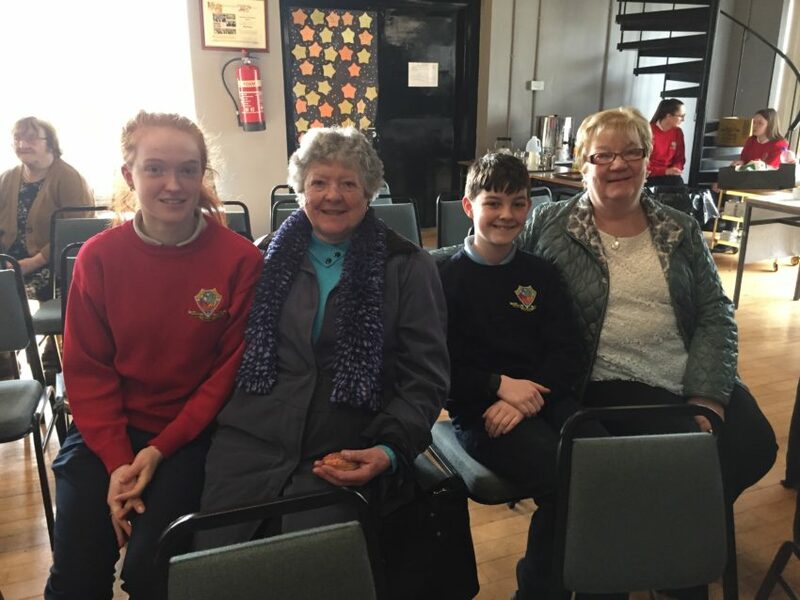 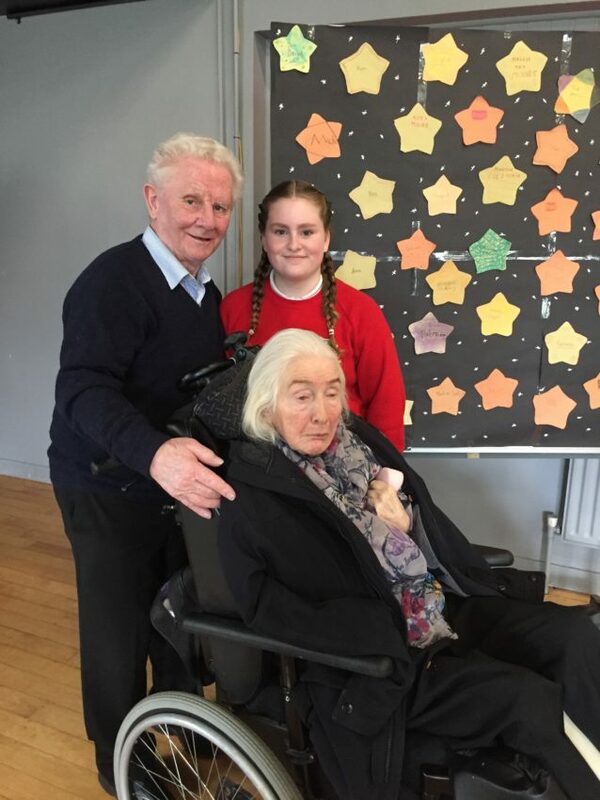 A lovely day of celebration was organized by Transition Year students for our First Year students and their Grandparents. 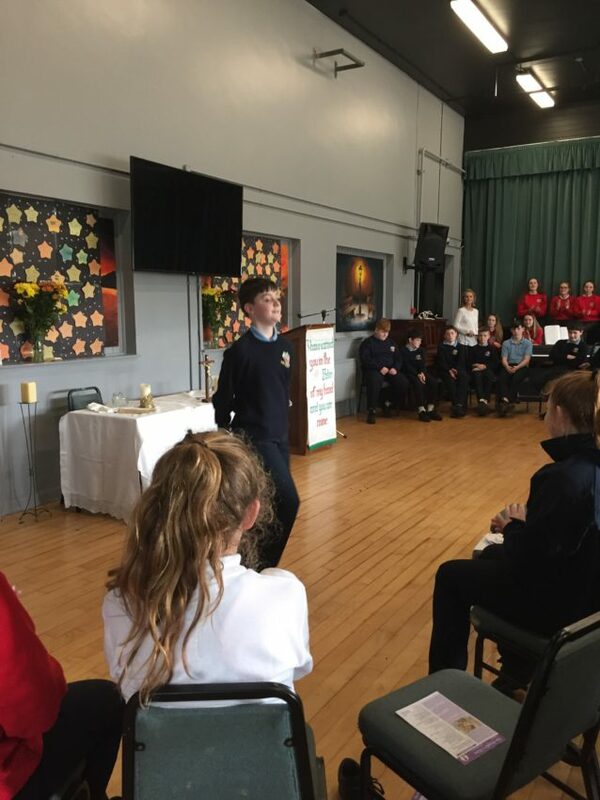 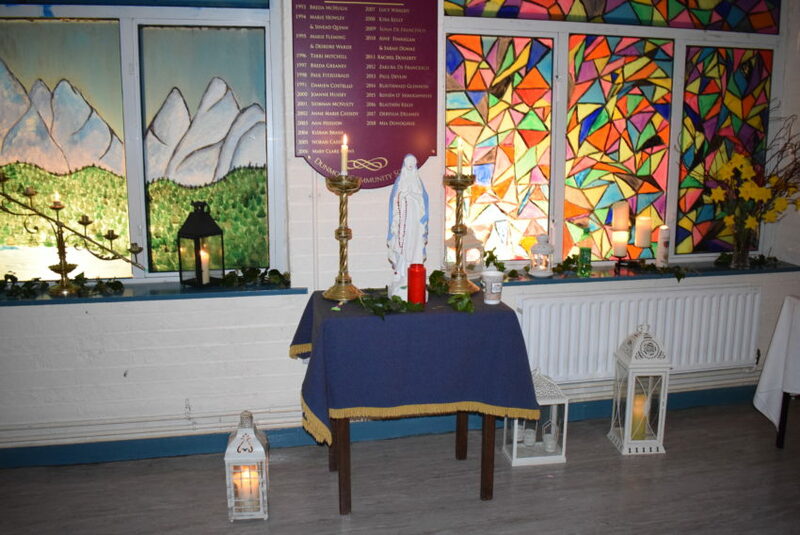 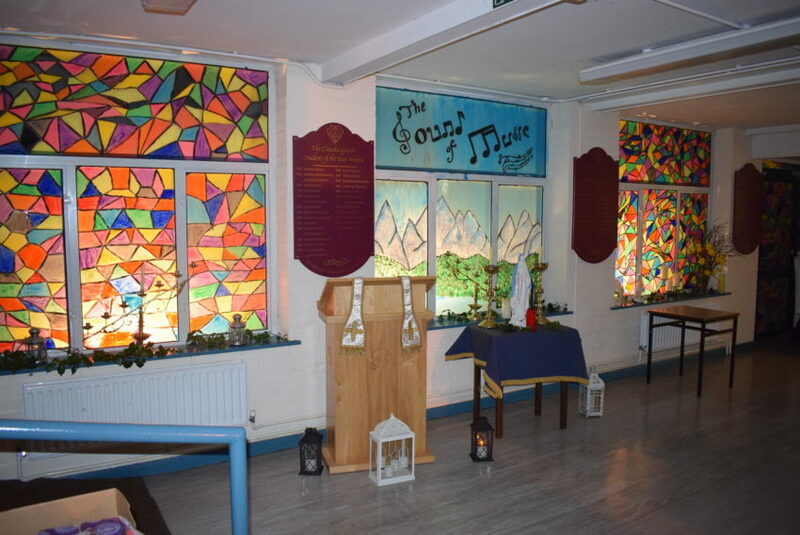 Fr Fergal Cunnane celebrated a lovely Mass and all the First Years were very proud to participate in the Liturgy. 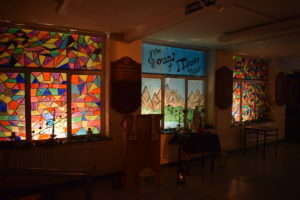 They displayed photographs and a collage remembering all their grandparents . 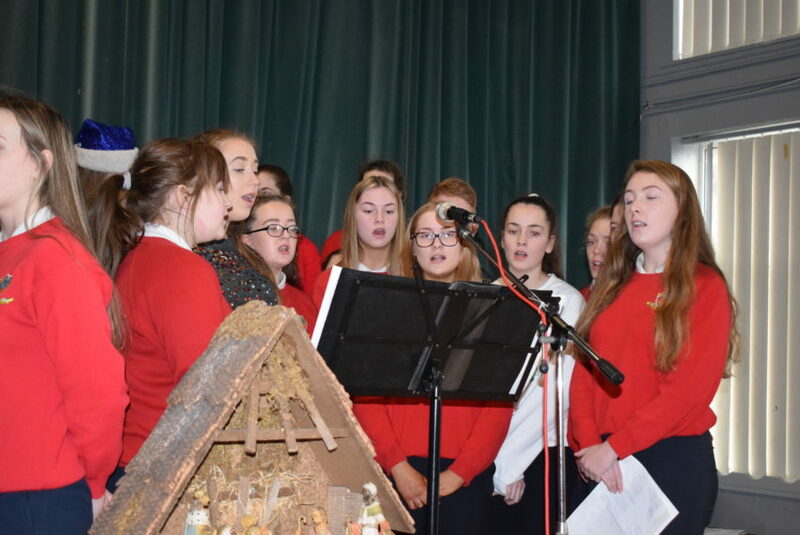 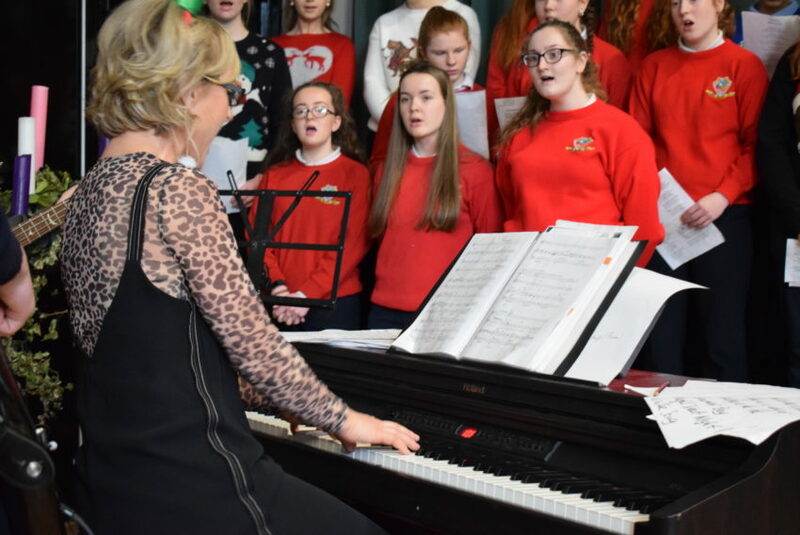 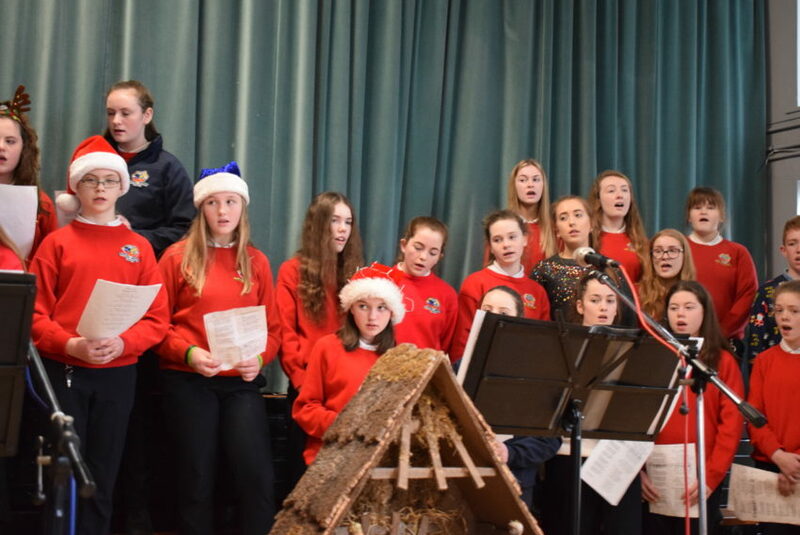 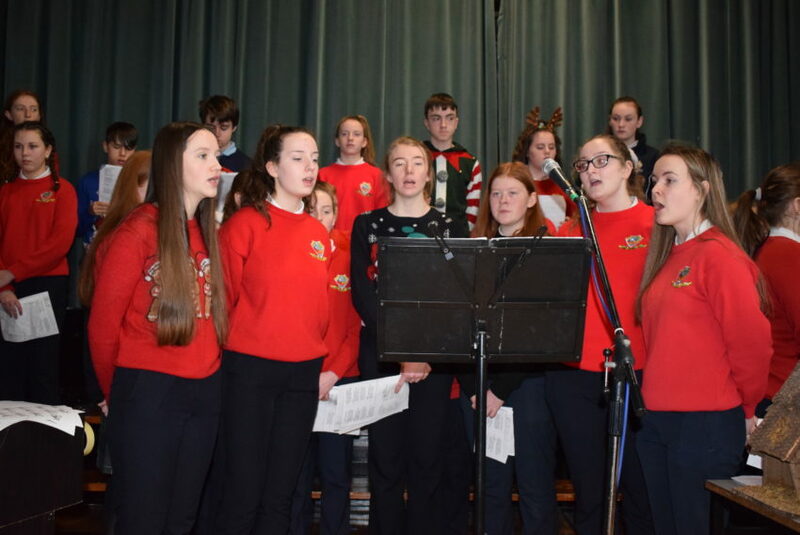 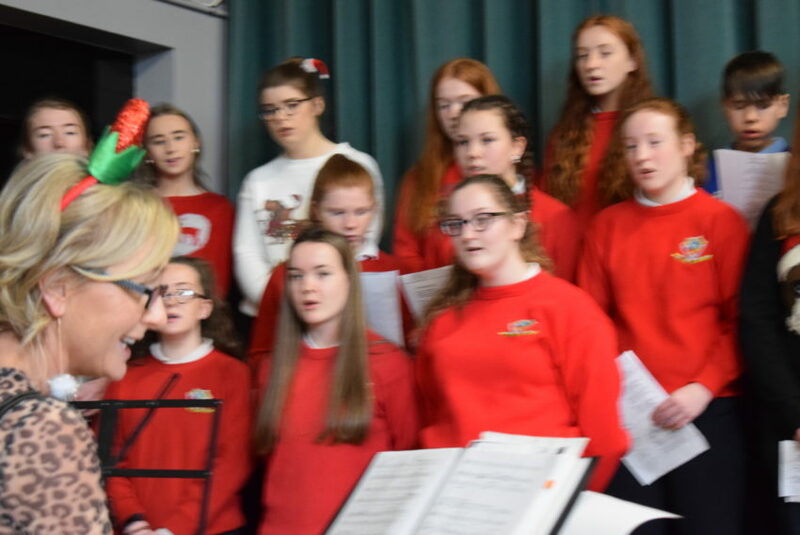 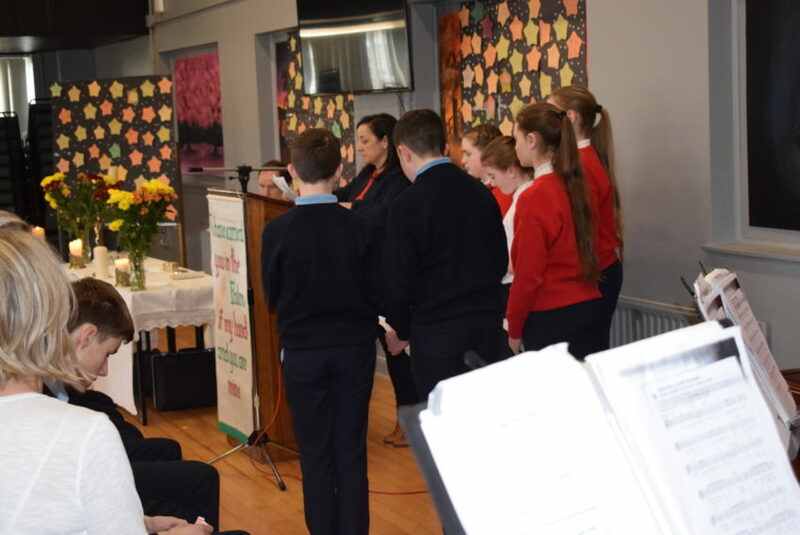 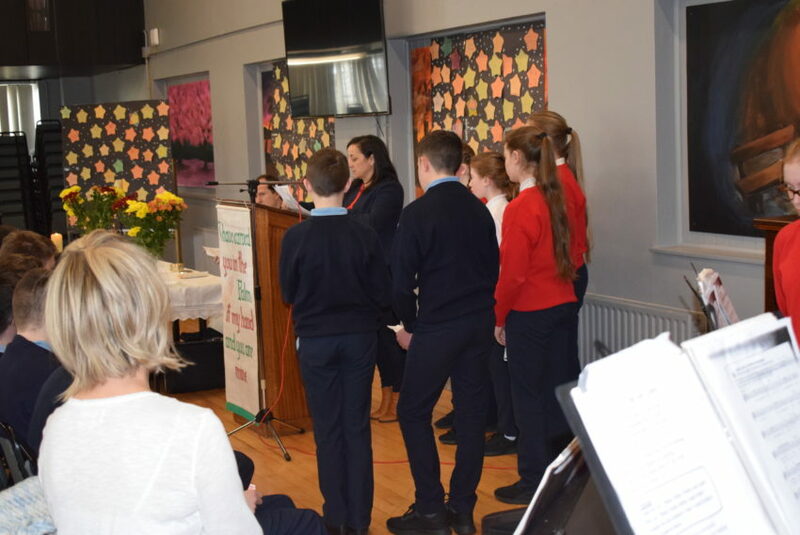 Ms Annette Walsh and her choir added to the occasion with their lovely hymns and songs. 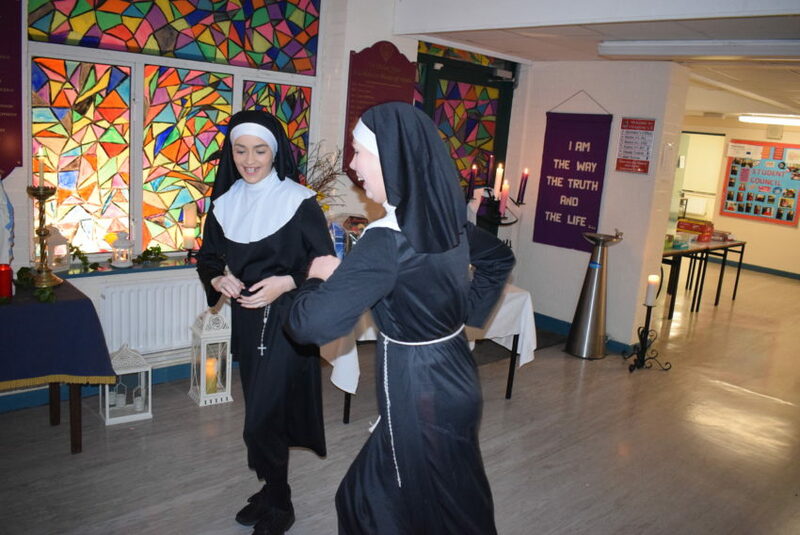 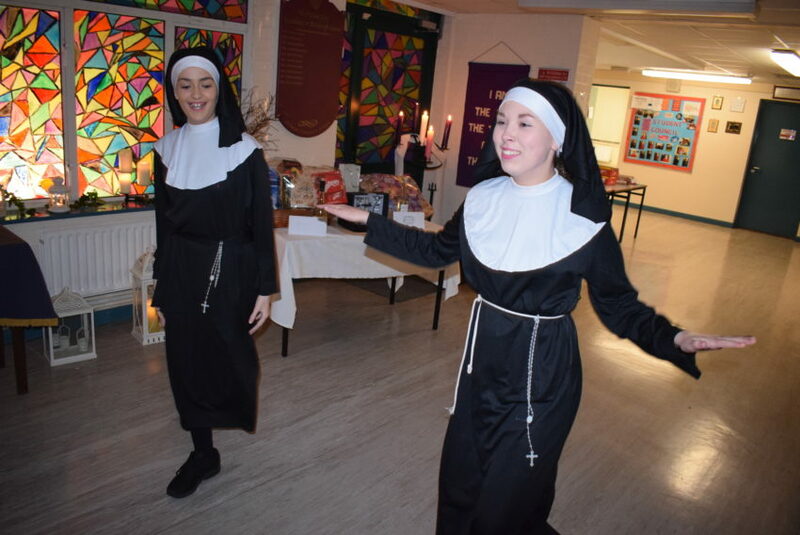 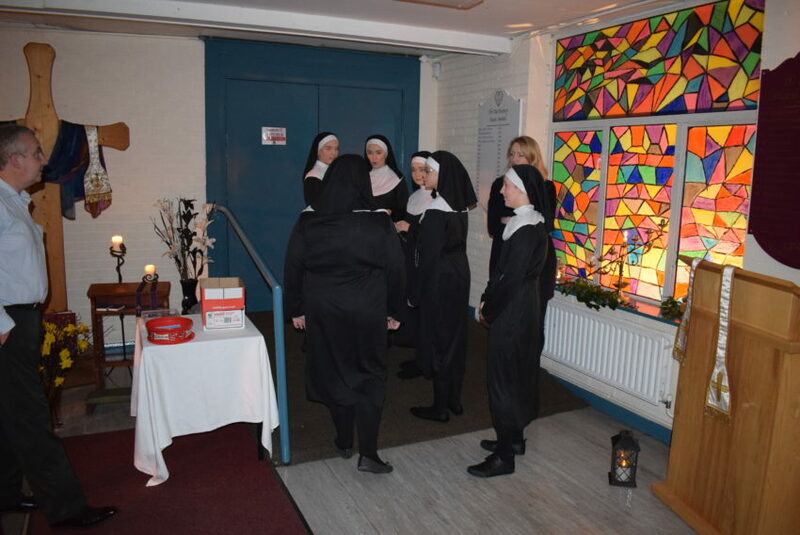 There was great entertainment with music , song and dance following refreshments. 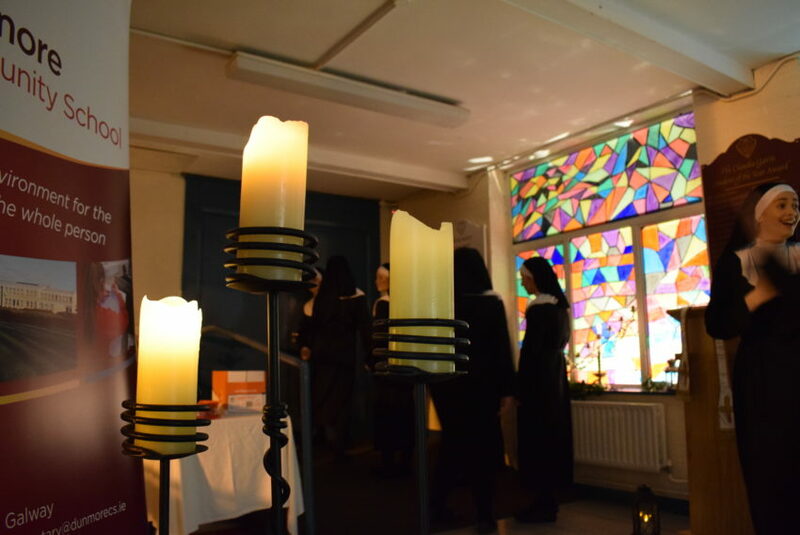 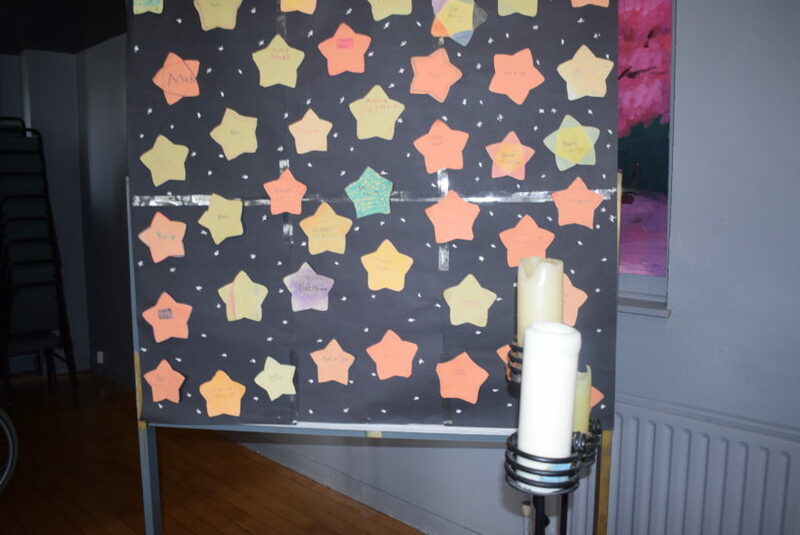 All enjoyed a lovely day and it is hoped there will be many more occasions to celebrate the school and parish links. 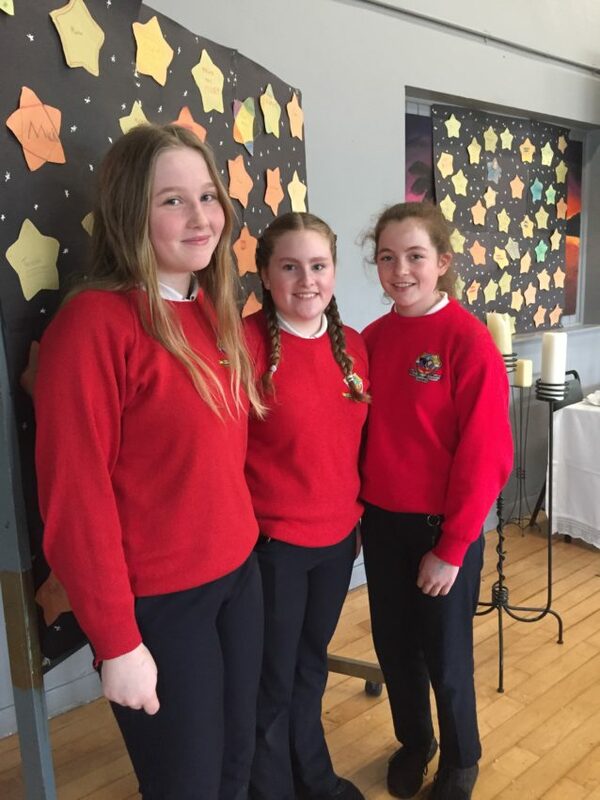 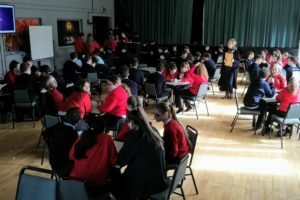 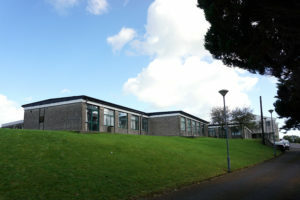 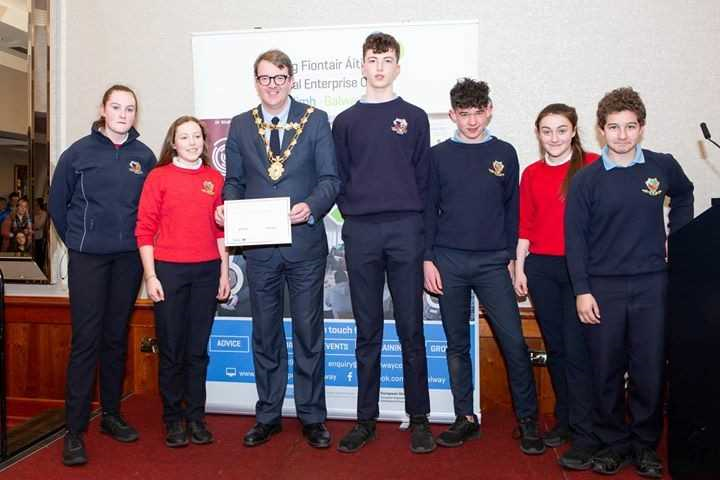 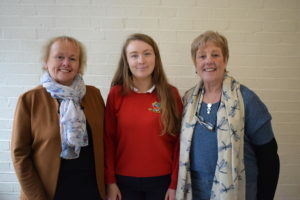 This year Dunmore Community School entered four teams into the Galway Final of the Enterprise Competition. 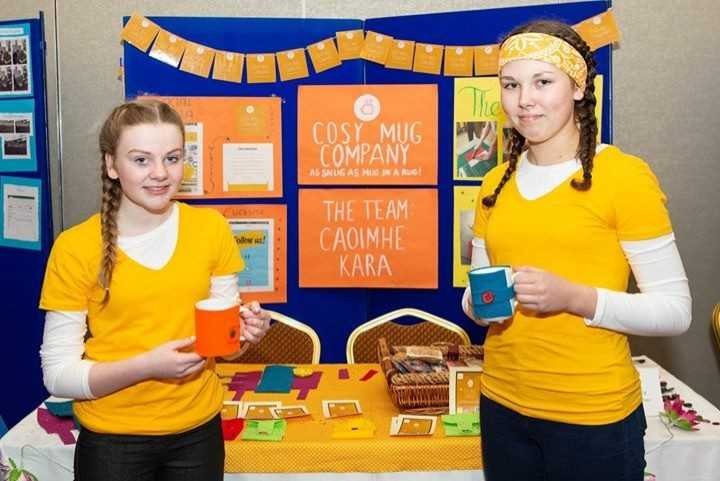 Team 1: Cosy Mug Company designed mug cosies to keep that cup of tea, coffee or hot chocolate piping hot! 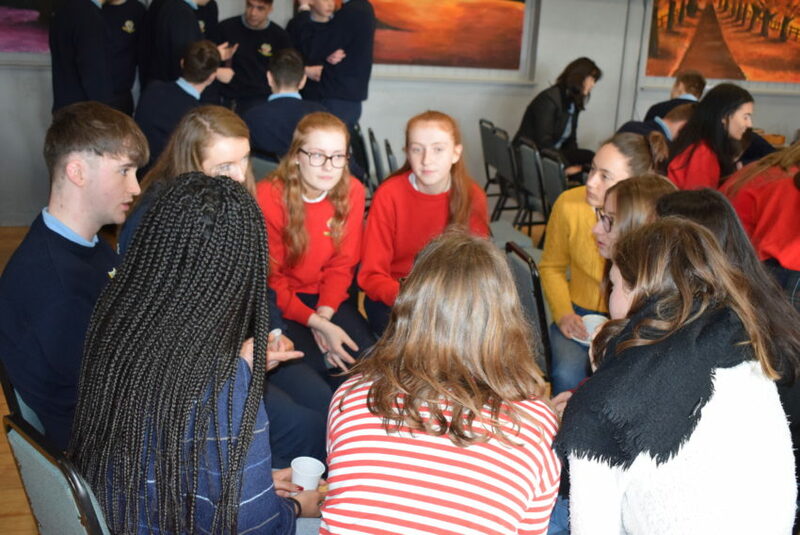 Team 3: Halo Health Shots,created an immune-boosting beverage to lift the spirits of Irish teens. 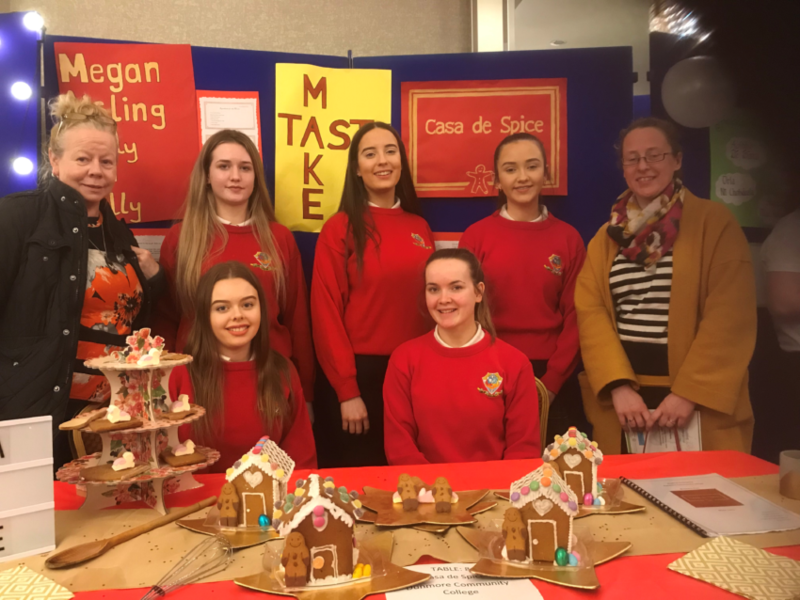 Team 4: Casa de Spice designed a unique gingerbread house which were a huge hit at the Dunmore Christmas market last December. 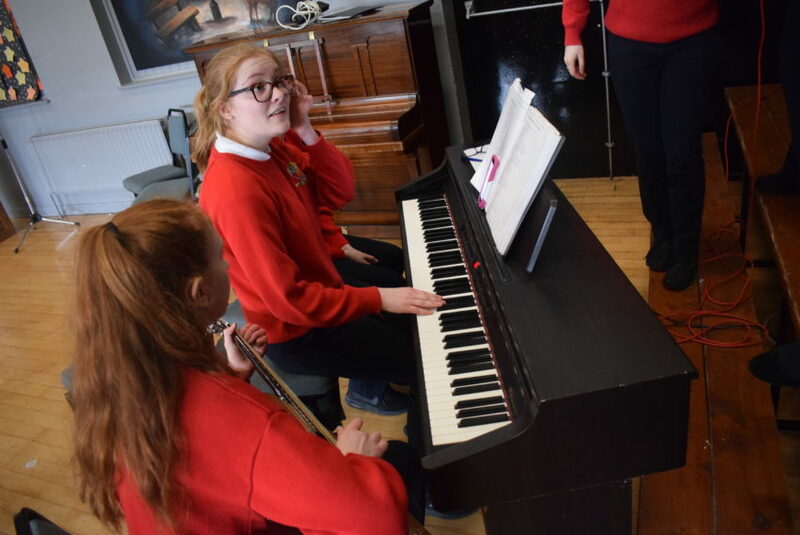 This project fosters cross-curricular links within our school which we could not complete without the generosity of teachers. 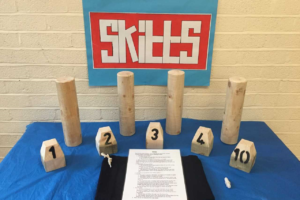 Ms Fallon oversaw all projects from initial brainstorming to the final product. 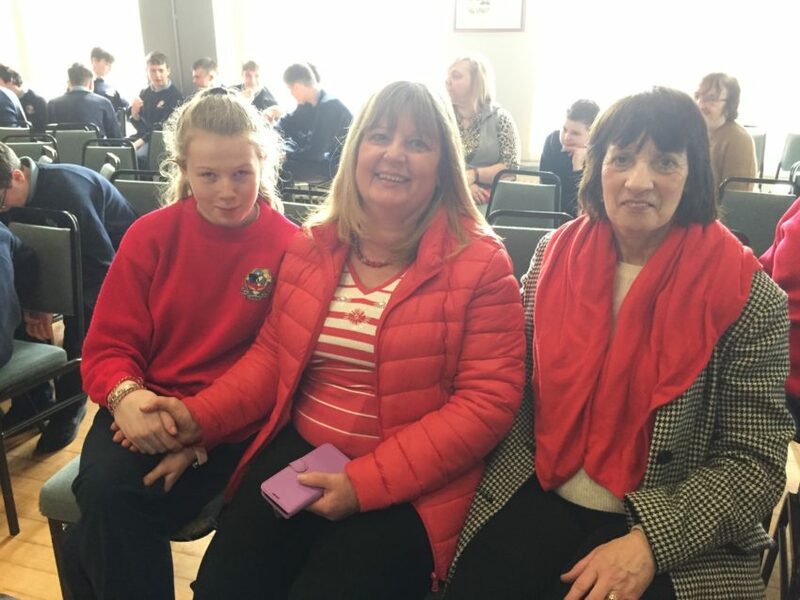 Ms Grehan had a huge involvement in organising the Skitts game. 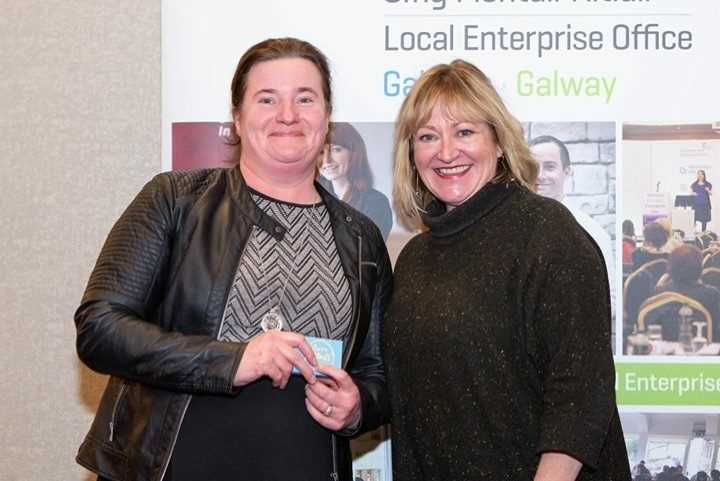 She spotted the niche in the market at the Community Games competition last August. 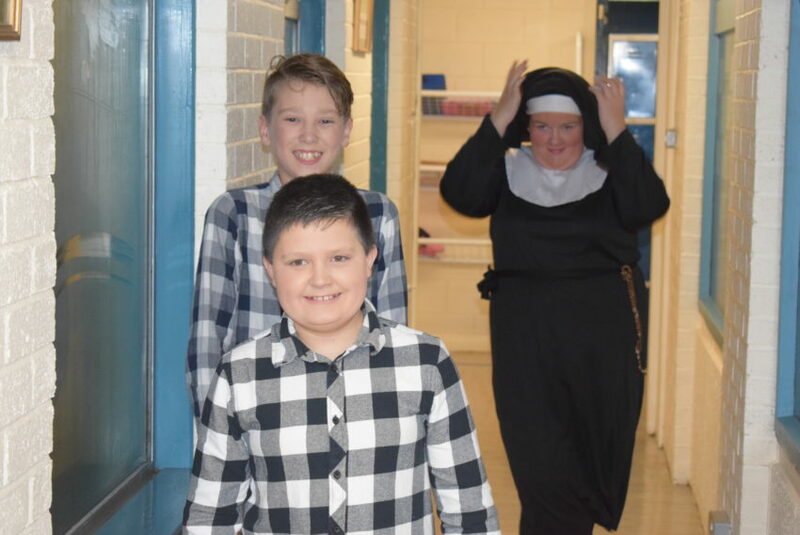 She got a team of students behind her and they are well on the way to success. 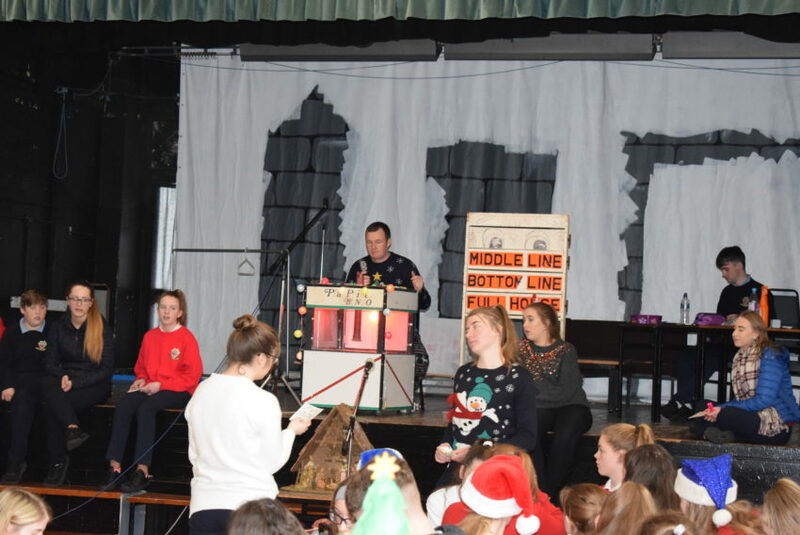 Mr Burke gave generously of his time in the woodwork room. 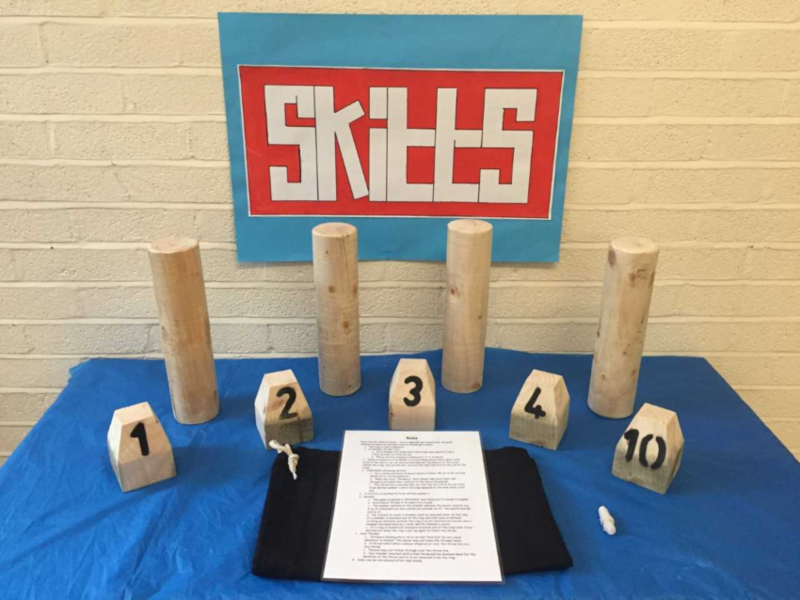 He designed a template to help cut out the standers for the game. 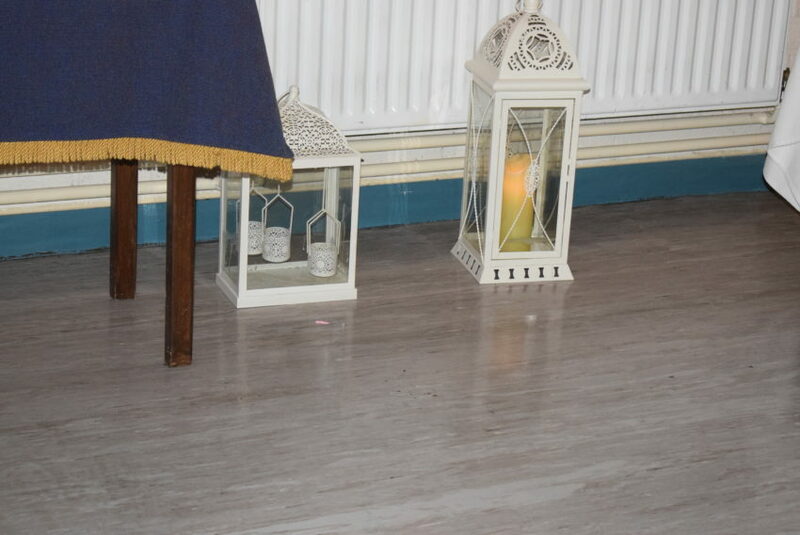 We are indebted to him as he ensured the product was ready for the market. 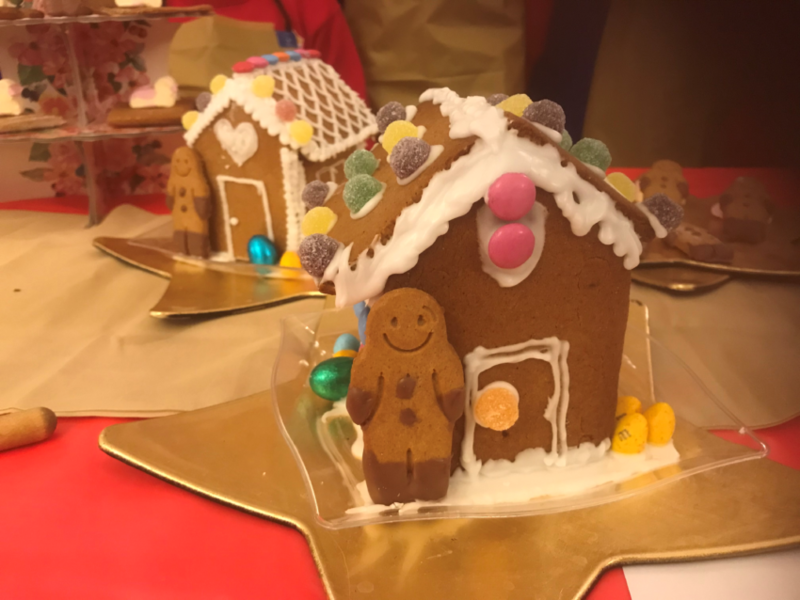 Ms McManus guided Casa de Spice to making and decorating the gingerbread houses in time to meet the Christmas market. 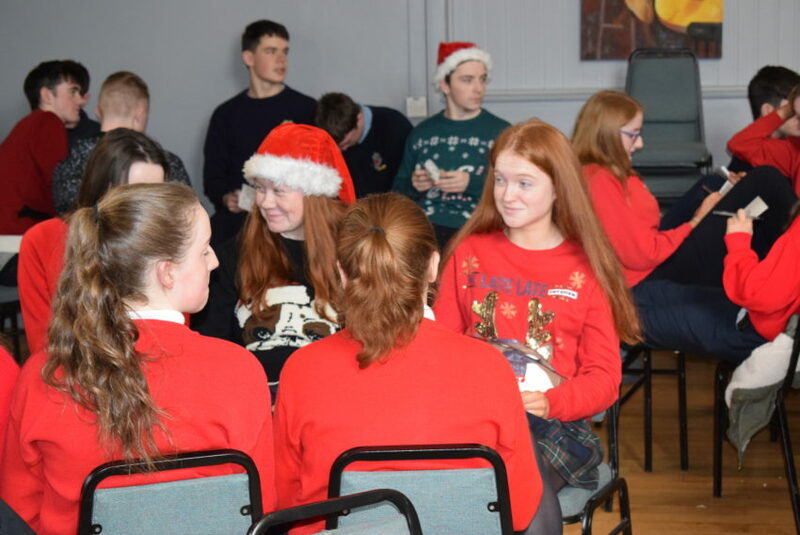 Ms O’Reilly advised the Cosy Mug Company through the process of making the mug cosies. 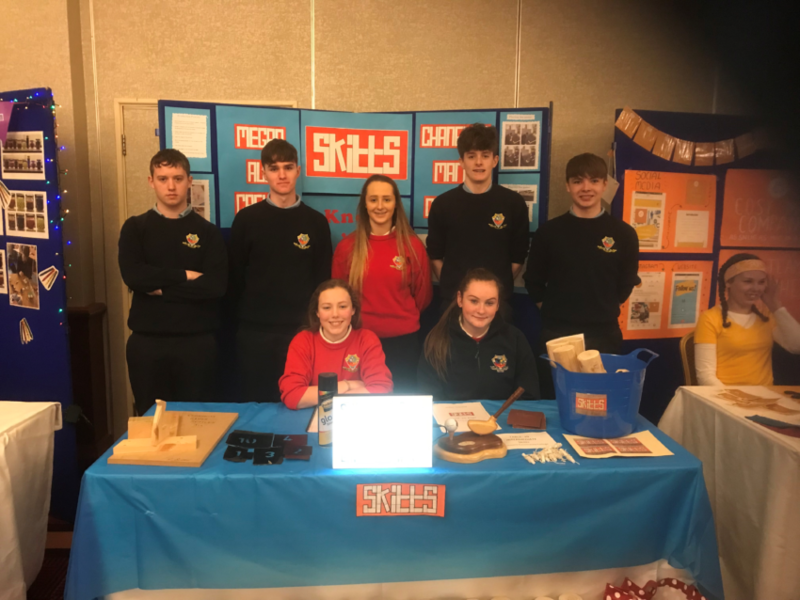 She also created logos, posters and bunting with her Art classes that really caught attention on the day of the competition. 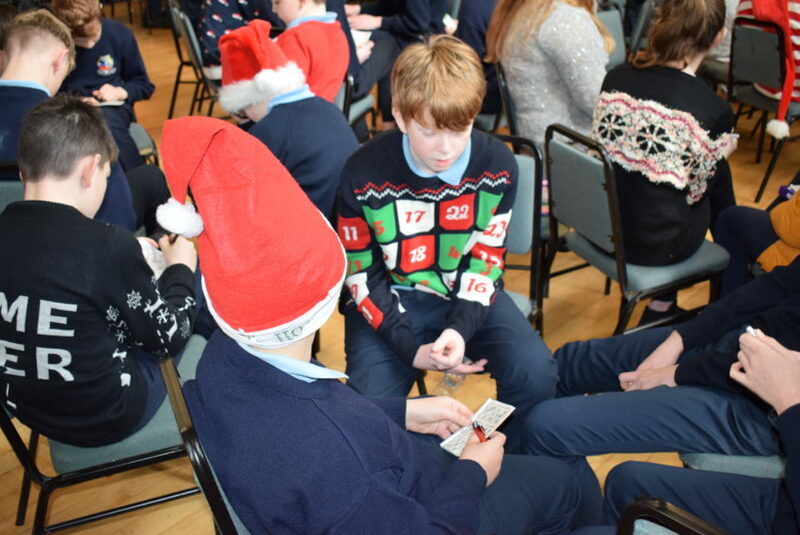 We were delighted to bring home three prizes on the day of the Galway Final. 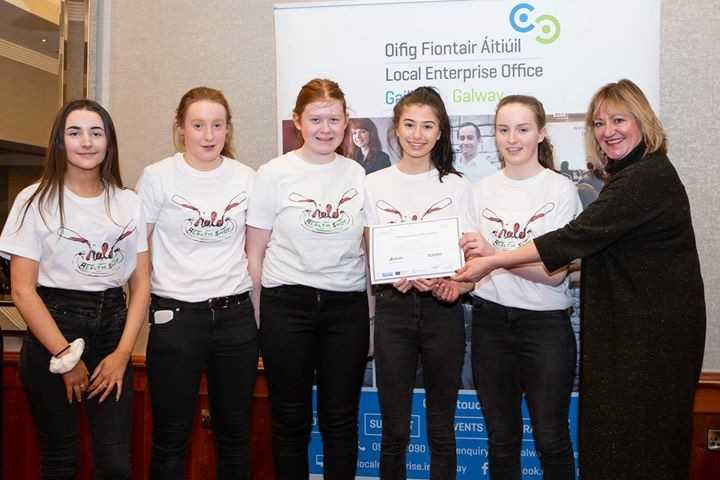 Skitts won the Intermediate Category and they go on to represent Galway in the National Final in Croke Park on the 3rd of May. 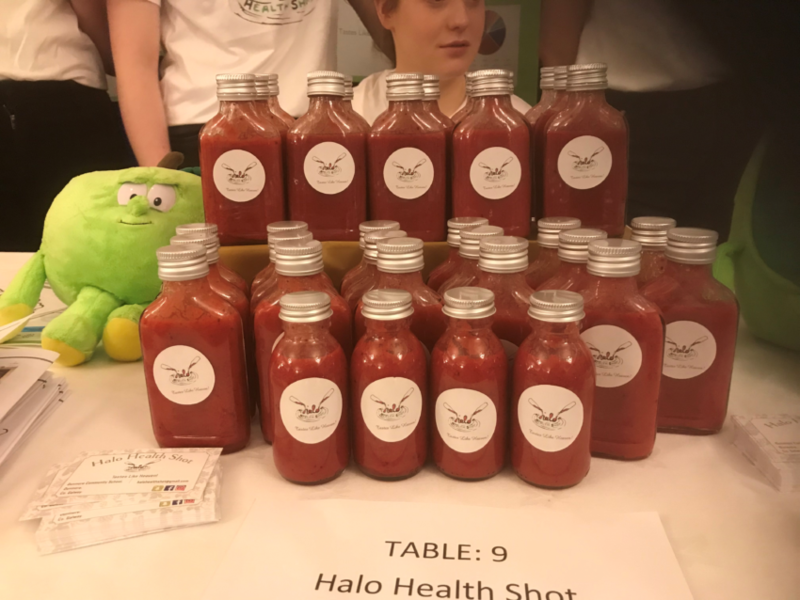 Halo Health Shots won Best Health Product. 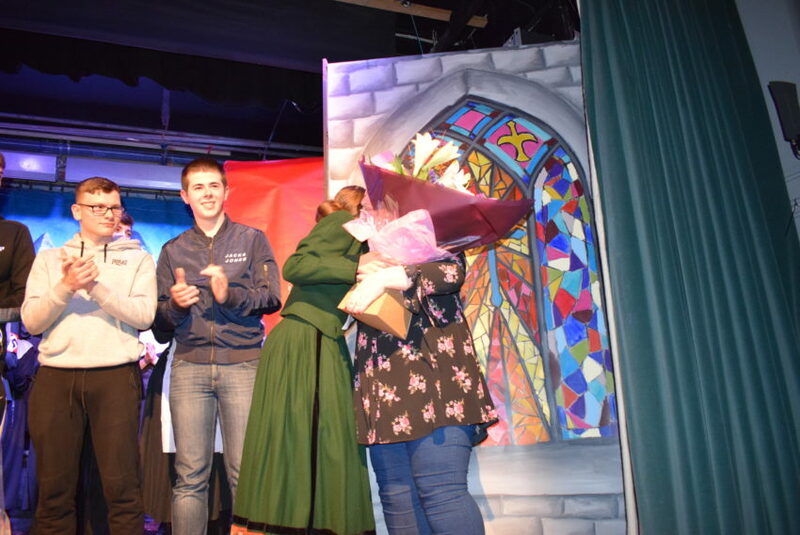 Ms Fallon won the teacher’s prize for the Best Educator. 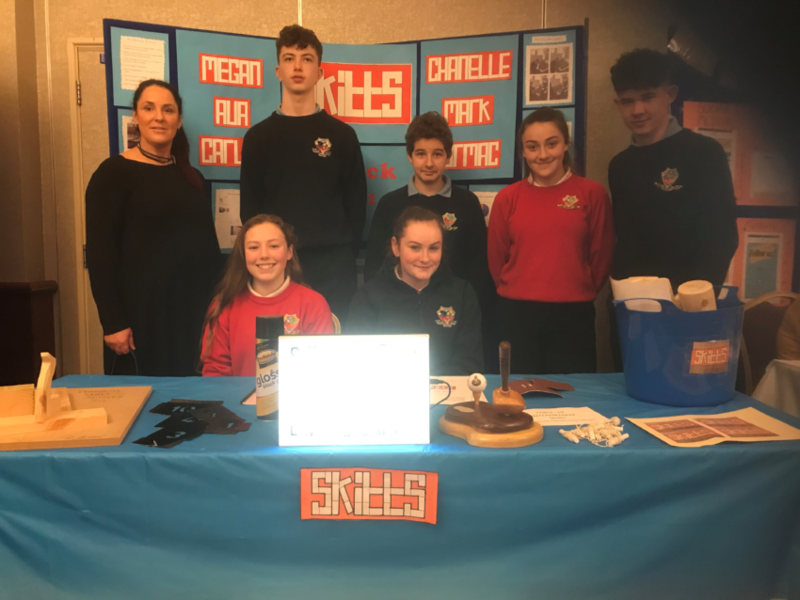 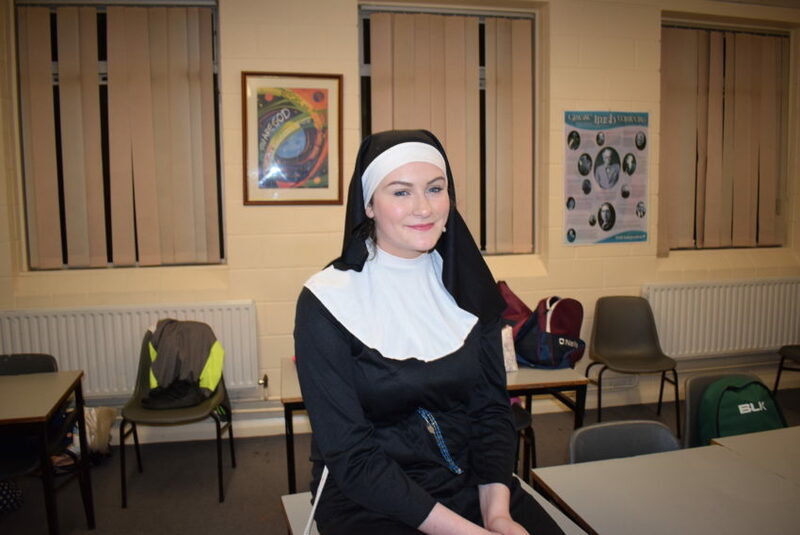 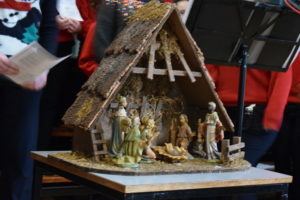 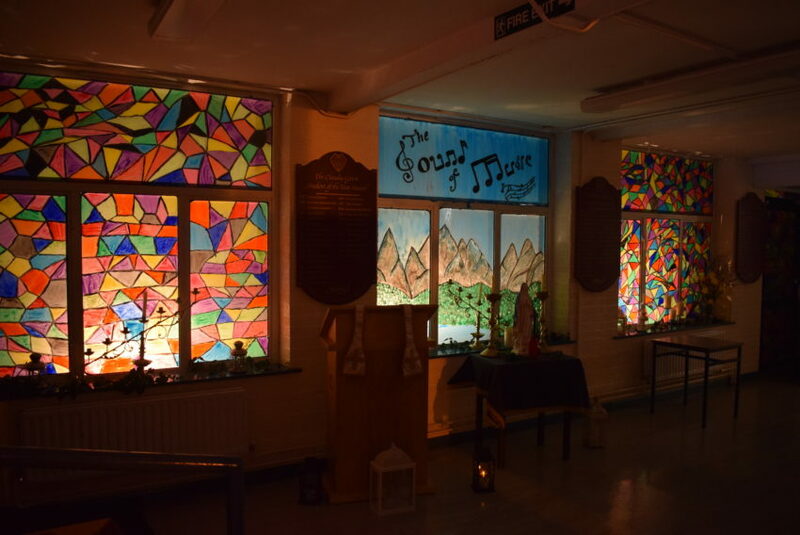 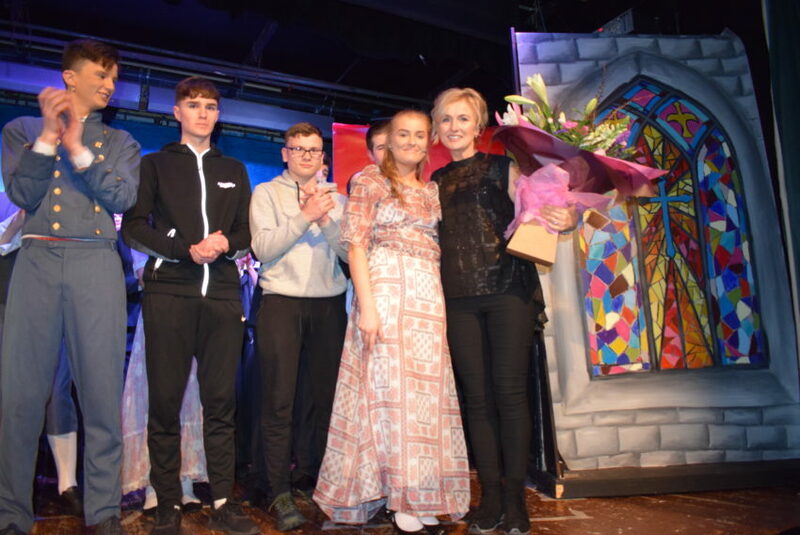 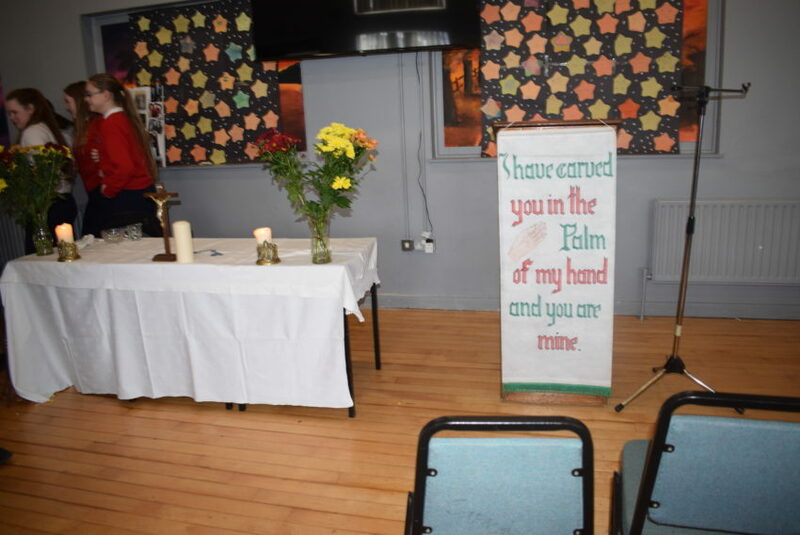 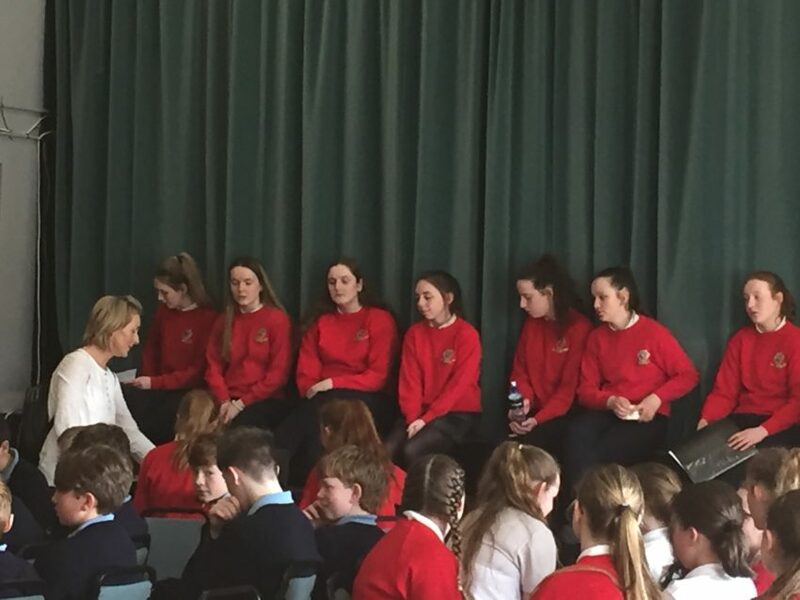 Well done to all involved and a huge thank you to the mentors, Emily Corr, Tina Kelly and Liz McCarthy in the Adult class who guided the students through the many projects. 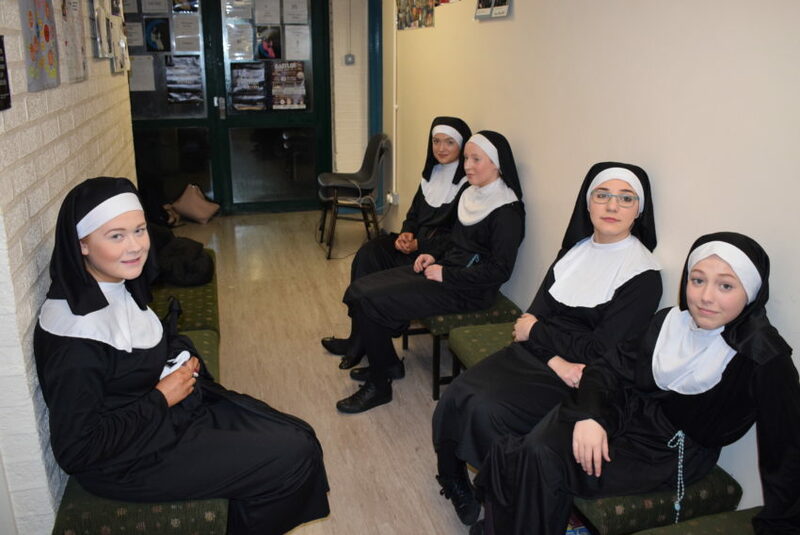 They also attended on the day of the Galway Final. 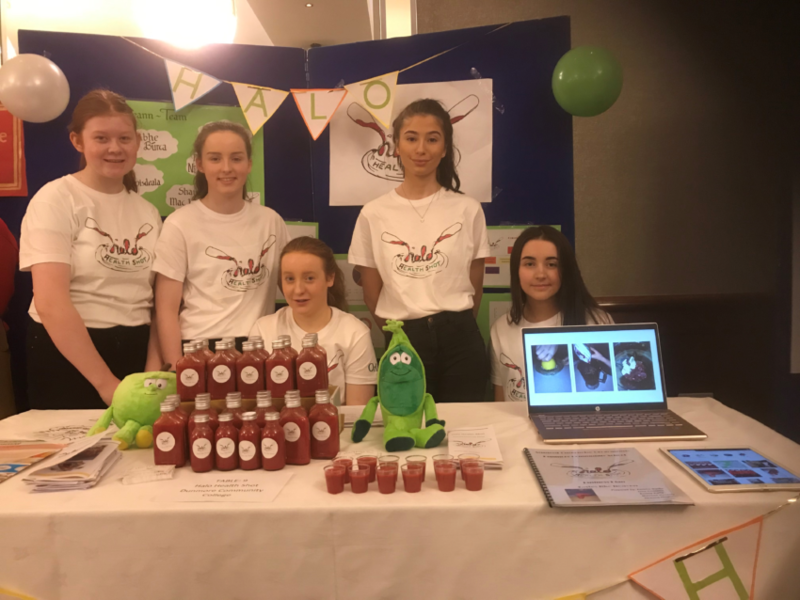 Halo Health Shots won the Best Health product. 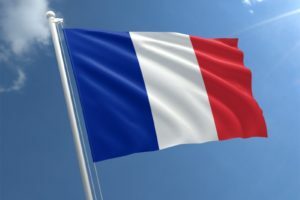 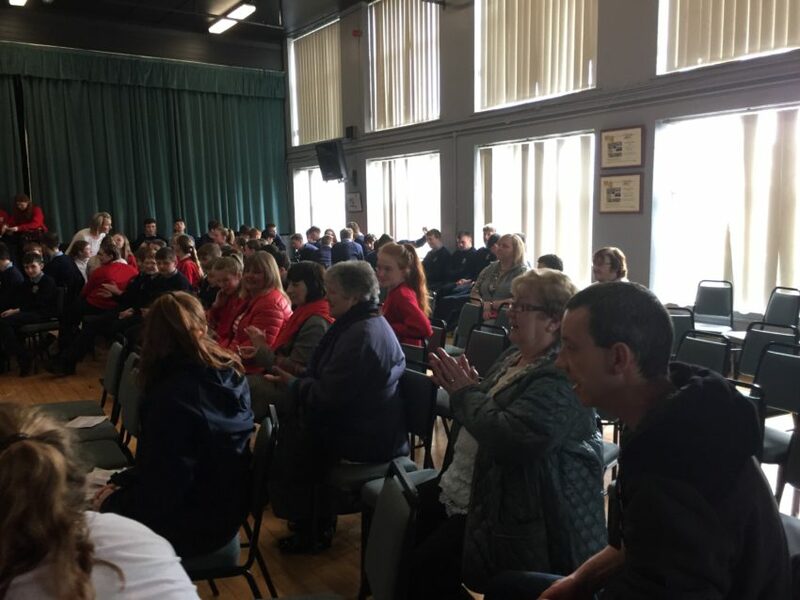 Ms. Scarry and Ms. Clesham along with our Transition Year students welcomed 57 French students and their teachers from Normandy to Dunmore Community School today. 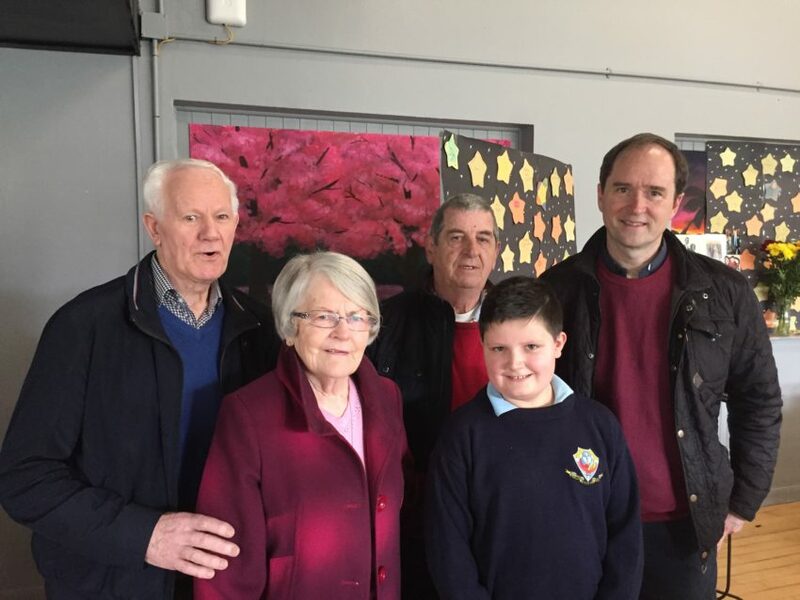 They were given a tour of our school and shown our facilities. 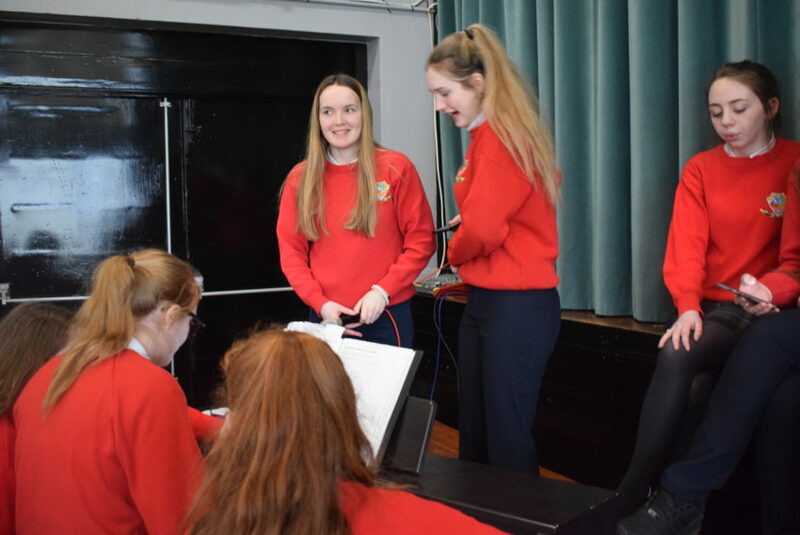 They learned alot about the opportunities our TY students get with us here in DCS. 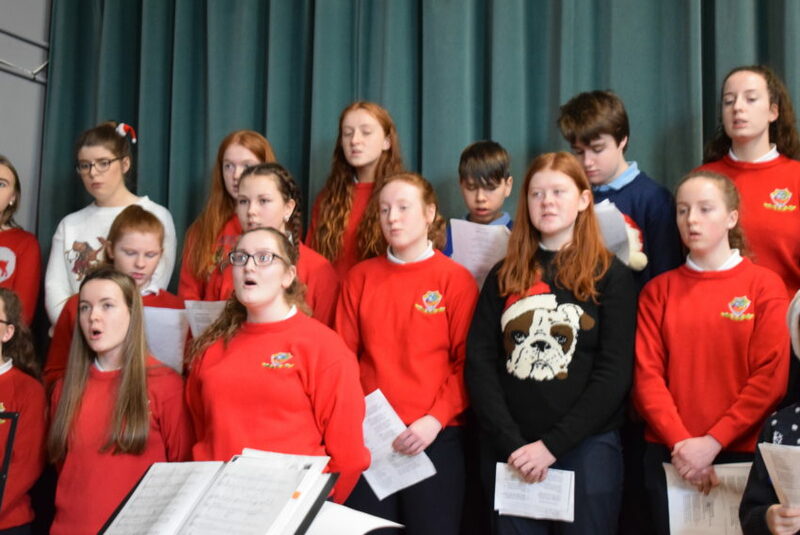 Ms. Walsh and the Music Dept entertained our visitors with music, song and dance. 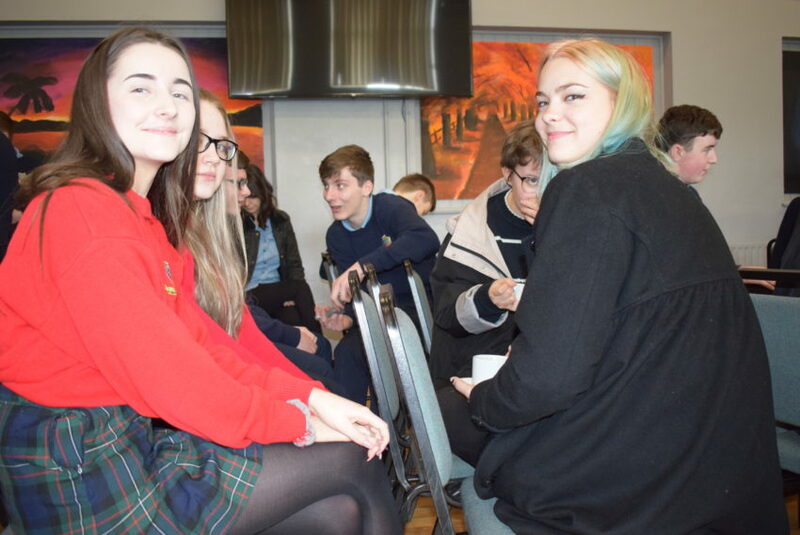 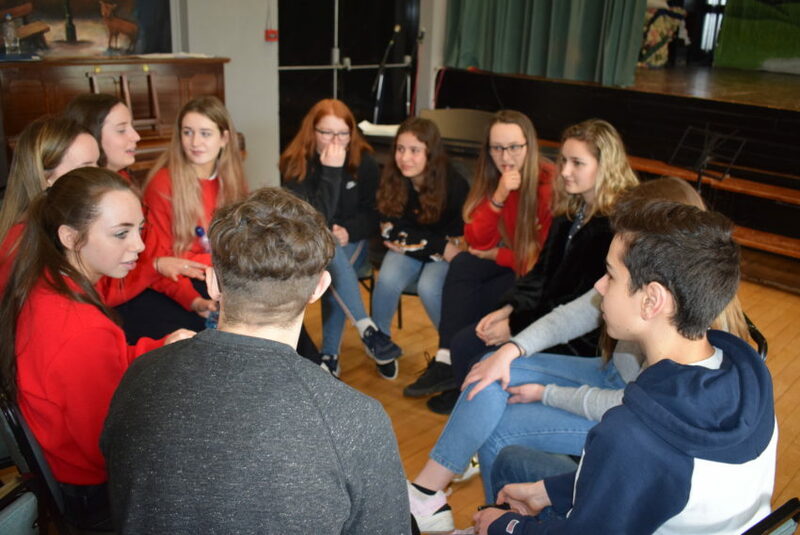 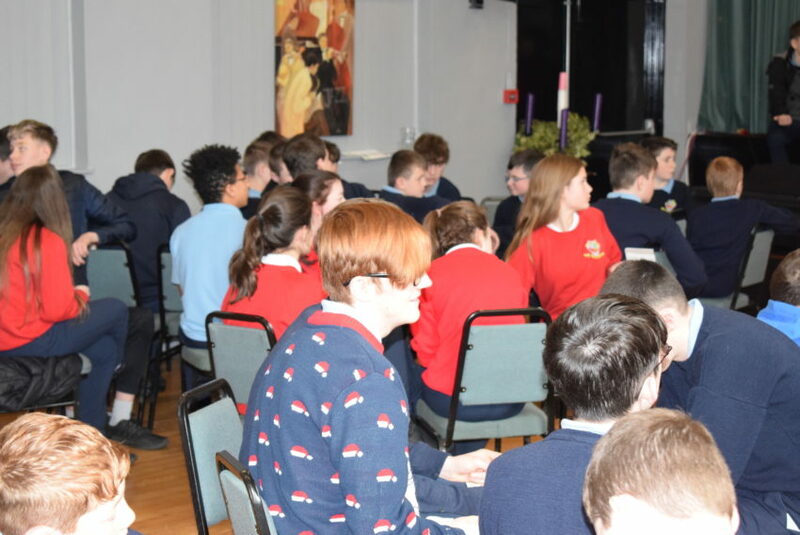 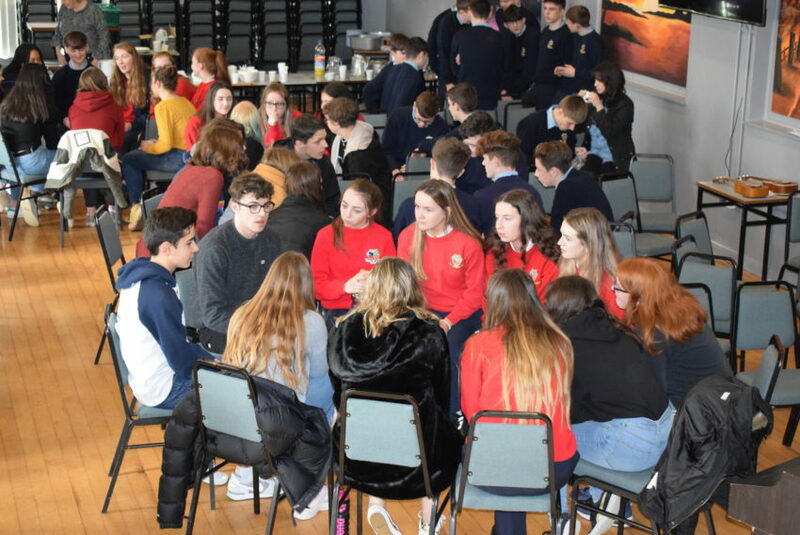 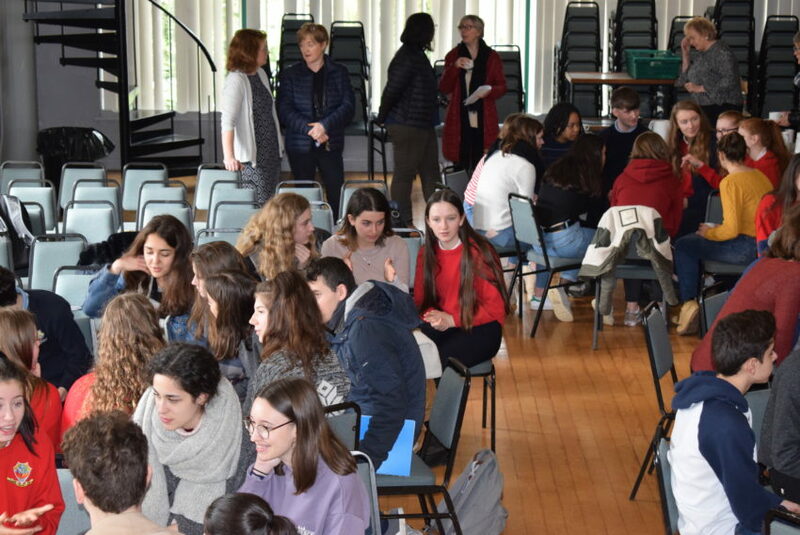 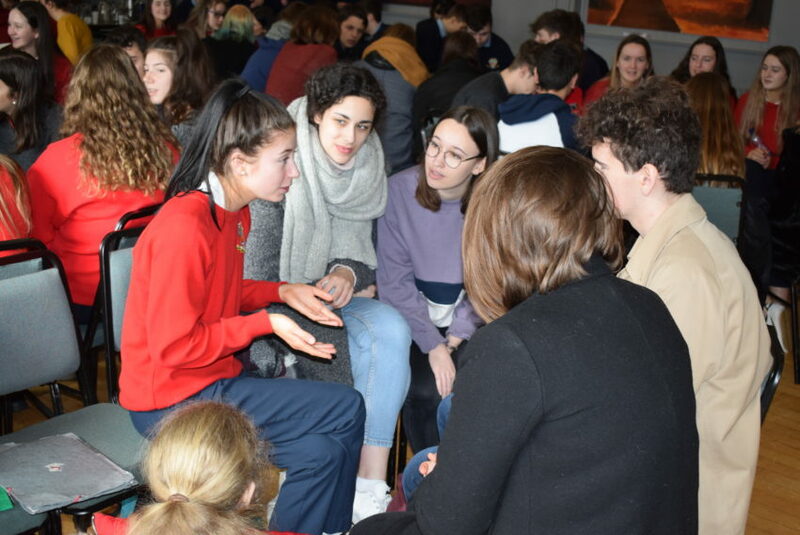 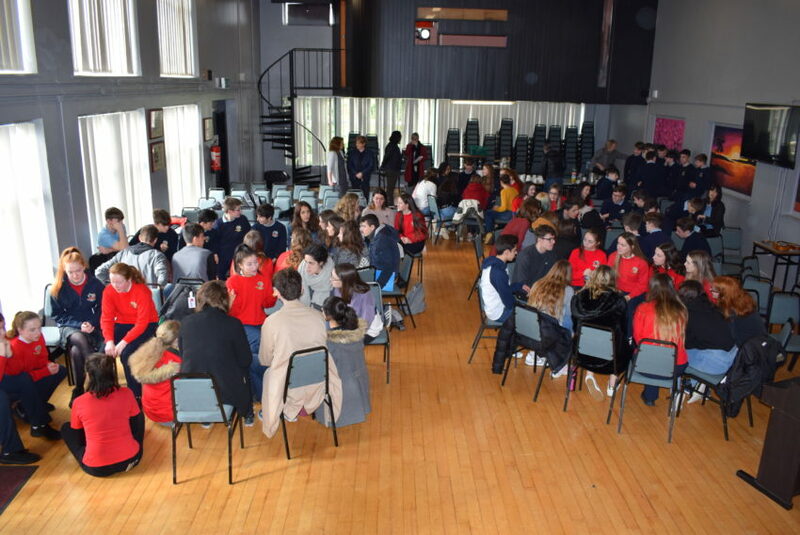 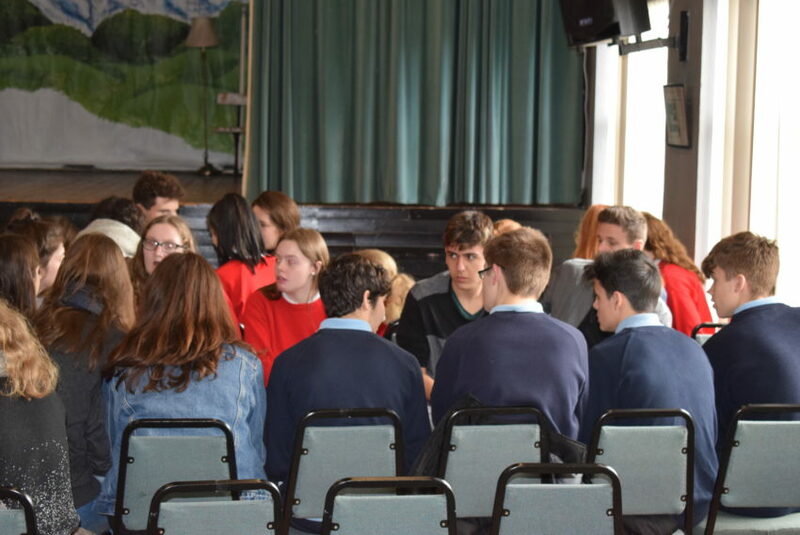 On Tuesday 19th March, our Transition Year students welcomed 35 French students and 3 teachers from the Loire Valley. 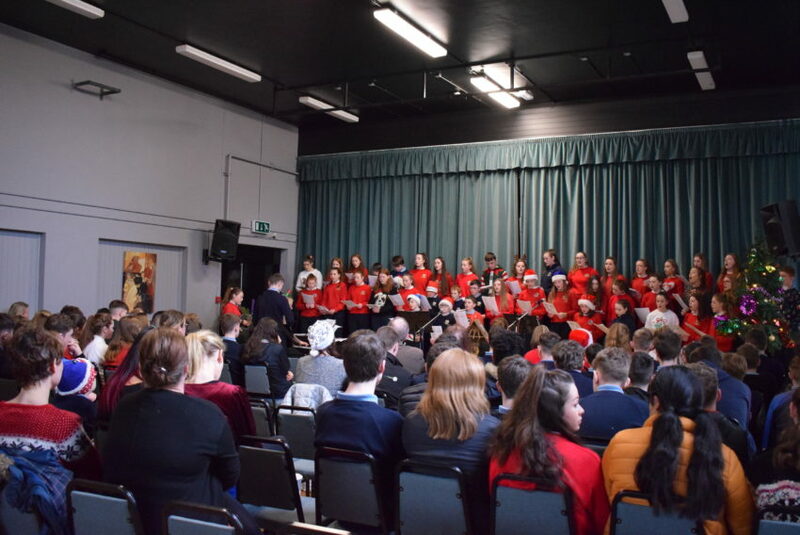 They organised a wonderful concert to entertain our French guests which highlighted the wonderful talents and culture in our school. 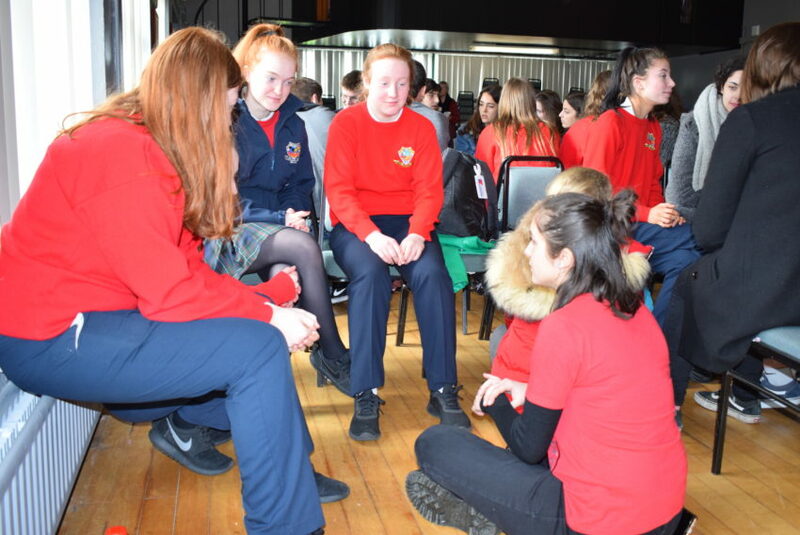 They also gave them a tour of our school and swapped stories about life in Ireland and life in France. 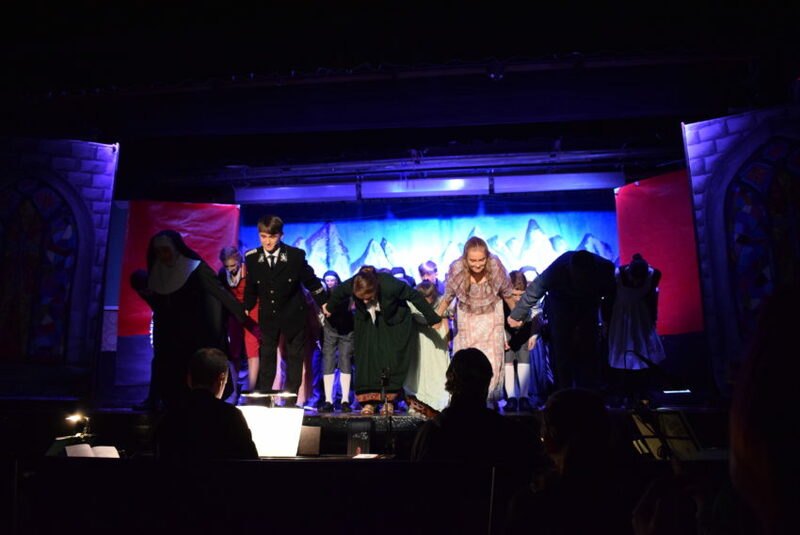 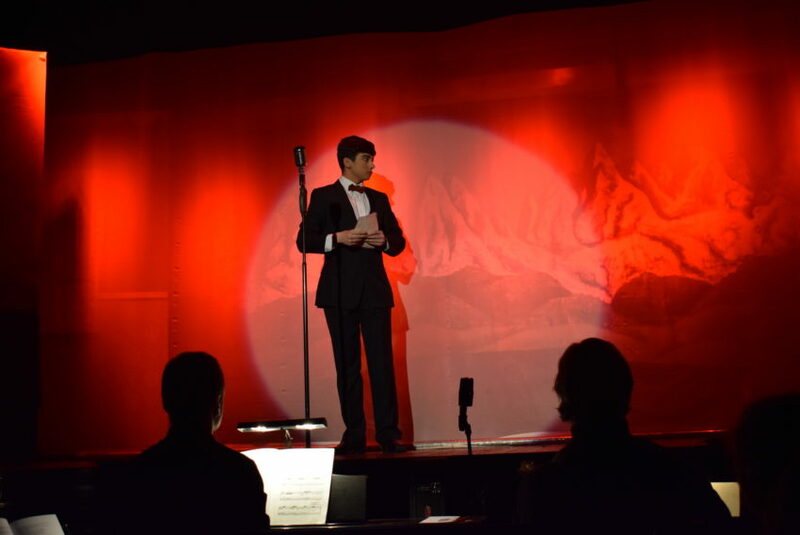 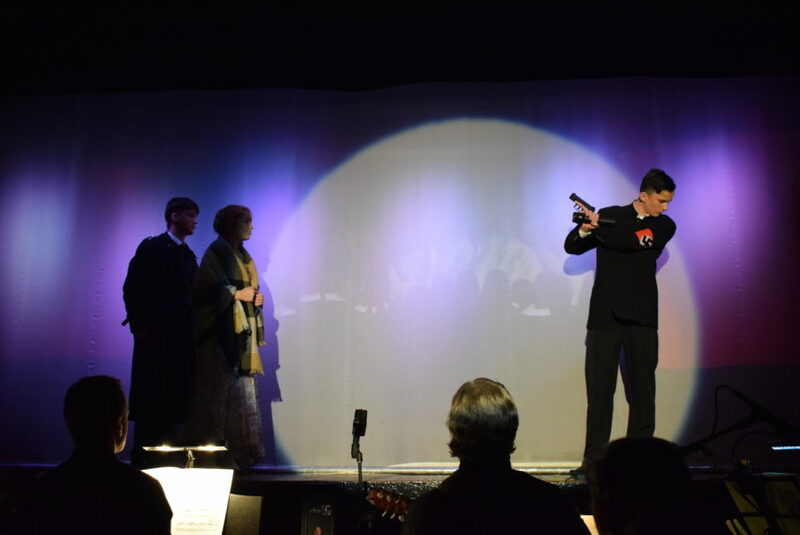 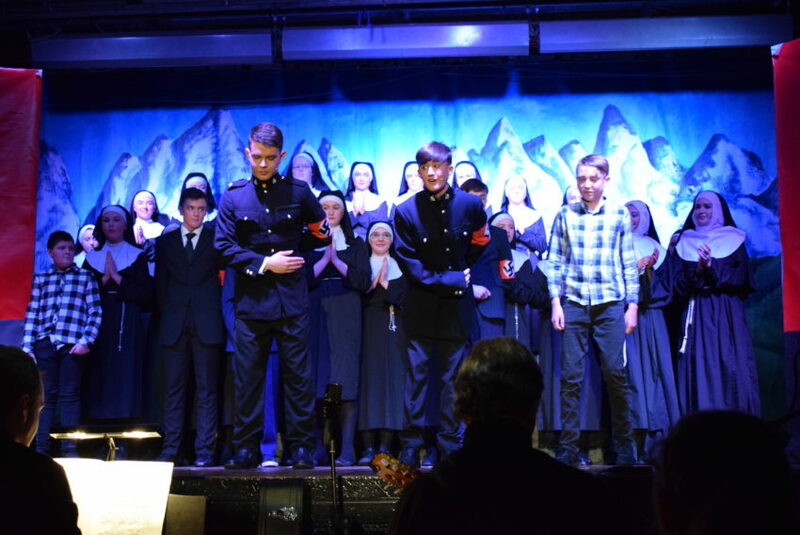 It’s a wrap… The Sound of Music concludes. 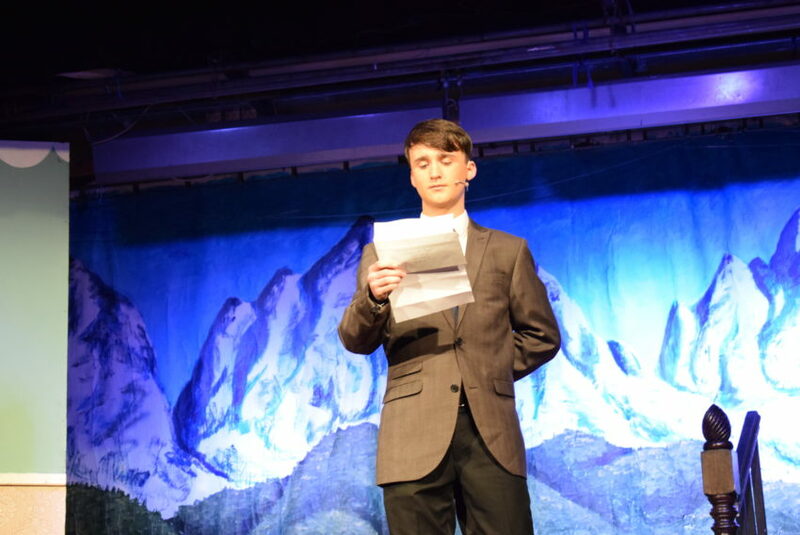 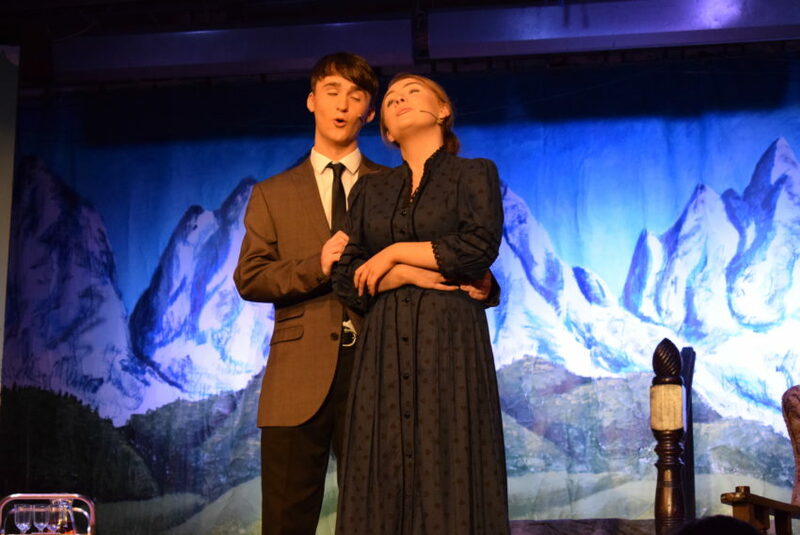 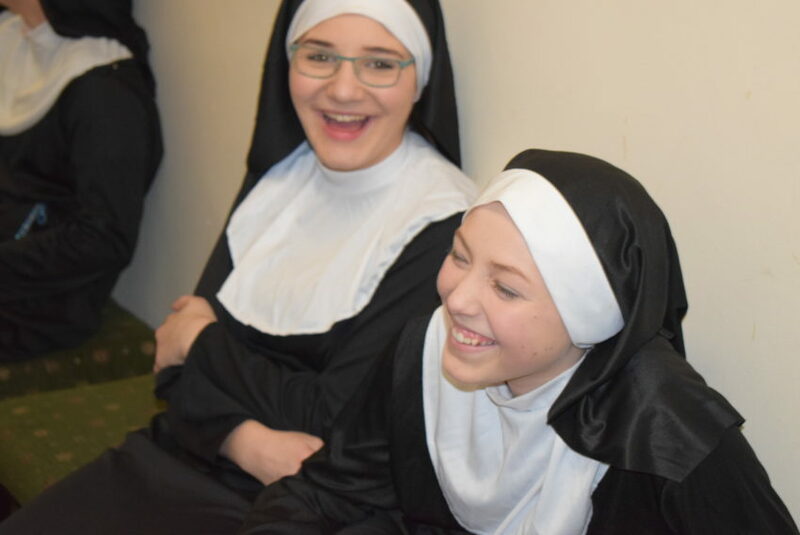 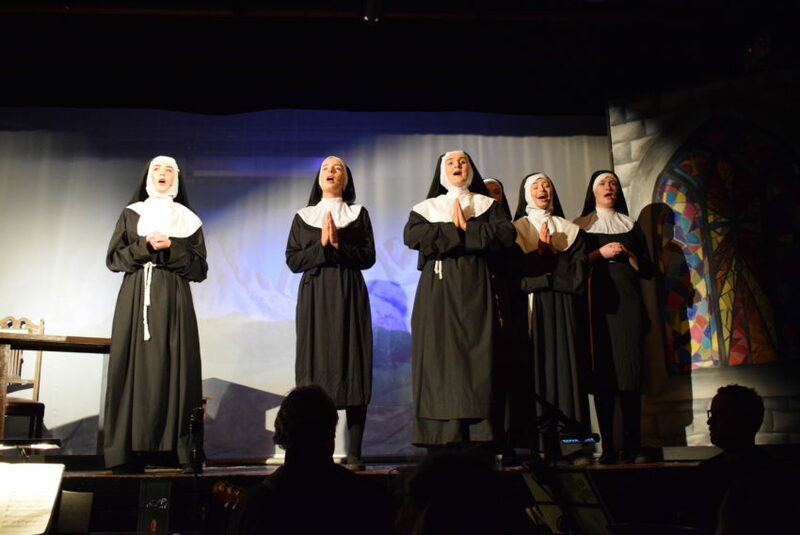 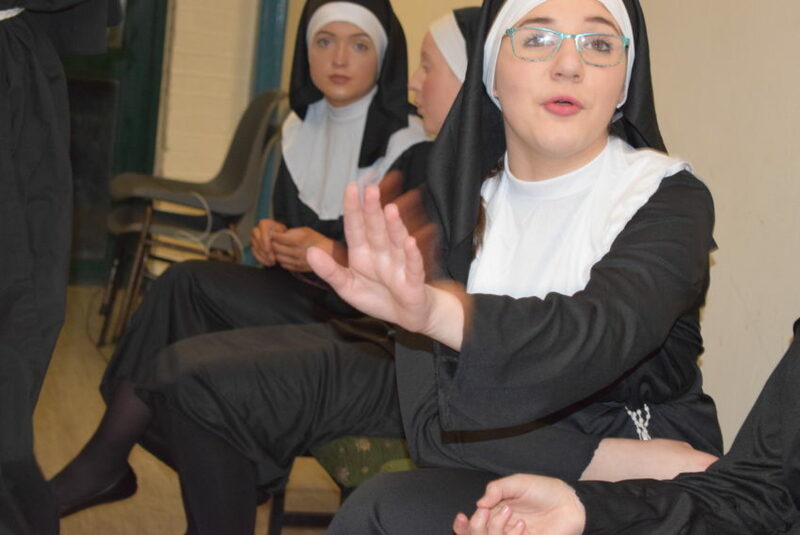 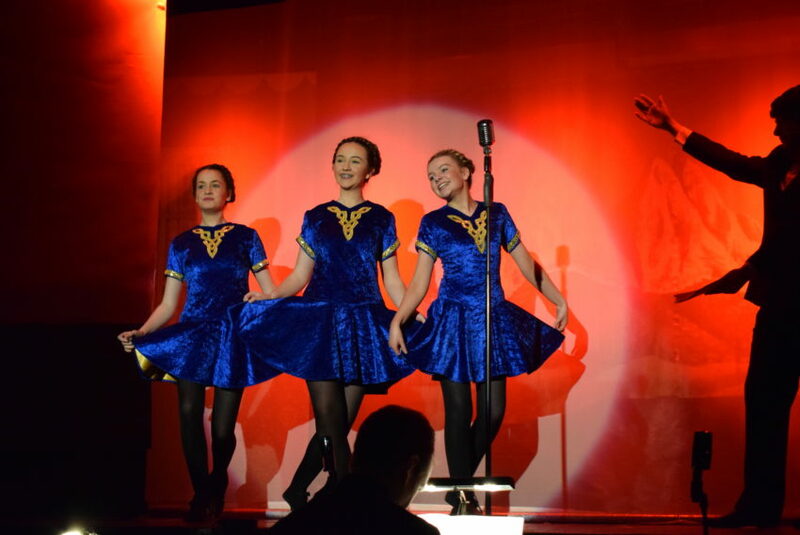 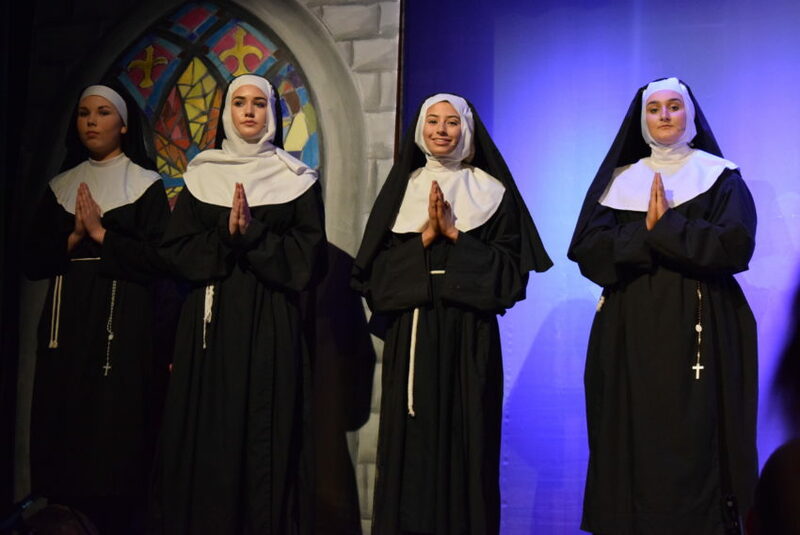 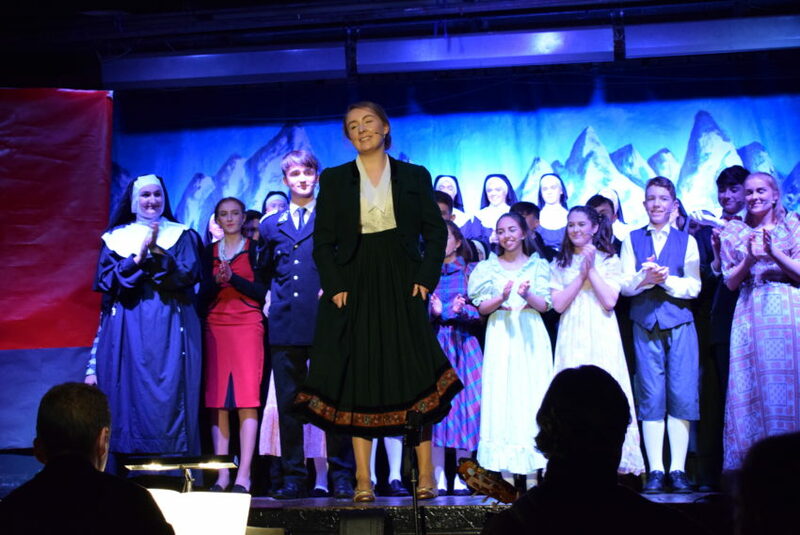 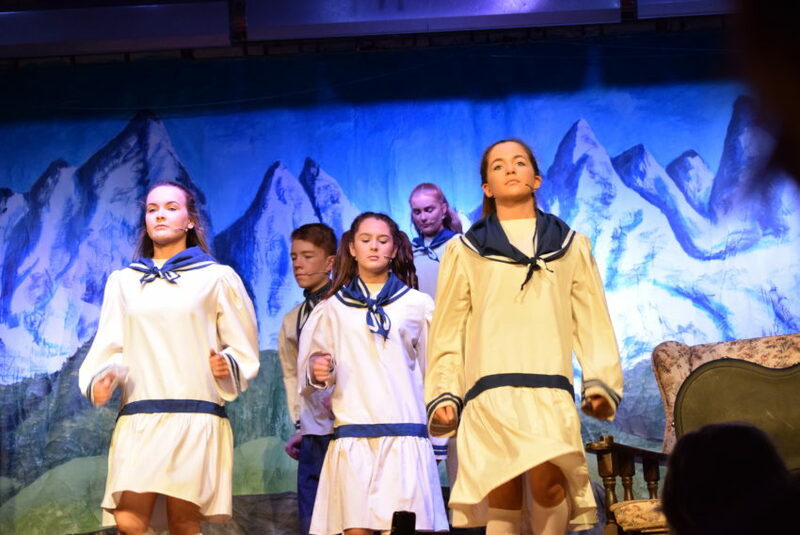 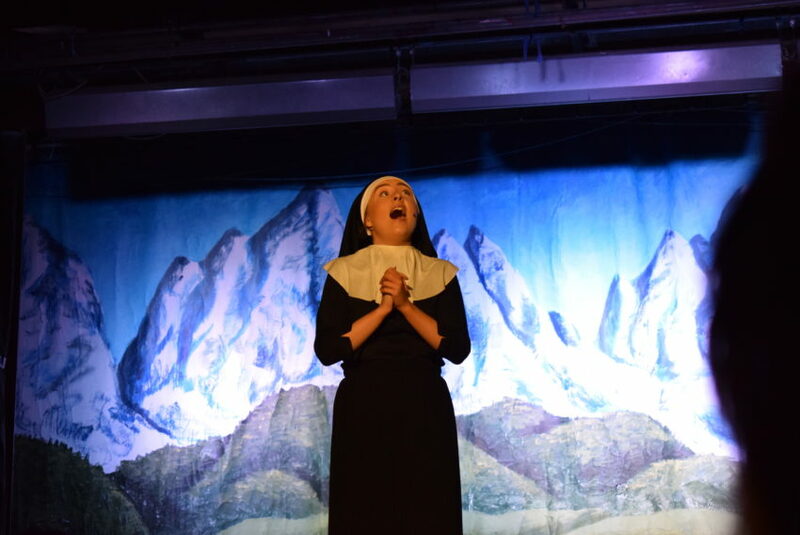 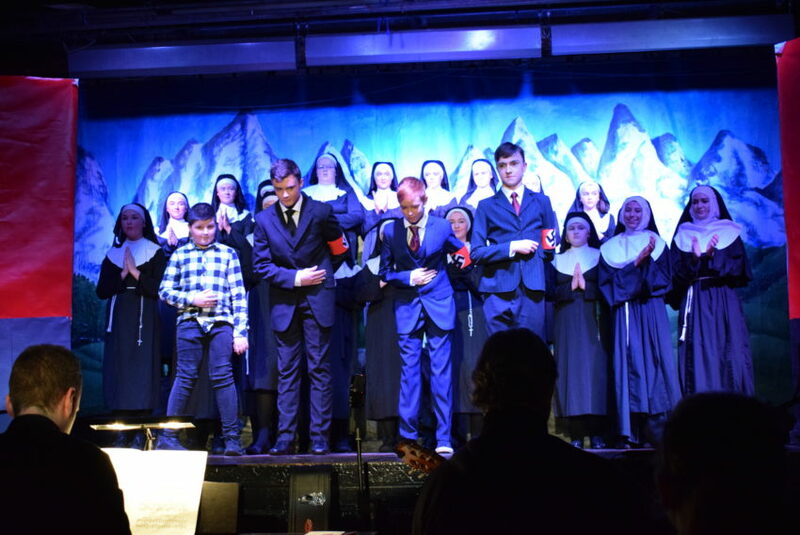 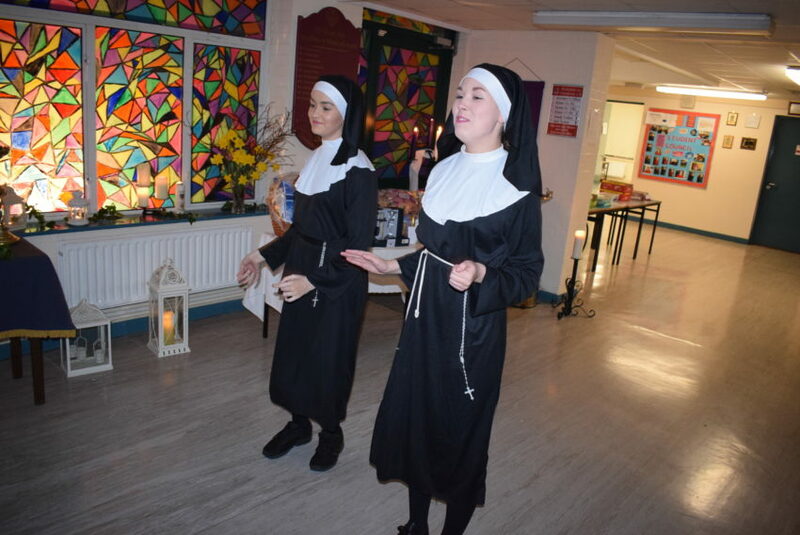 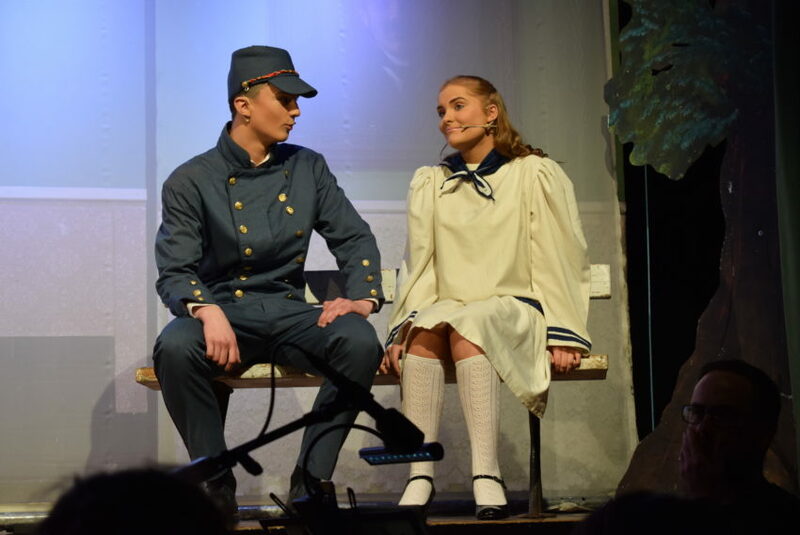 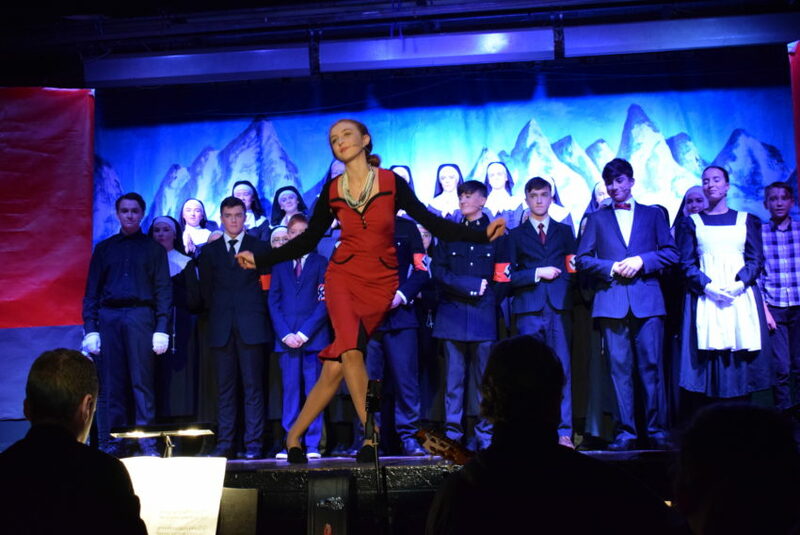 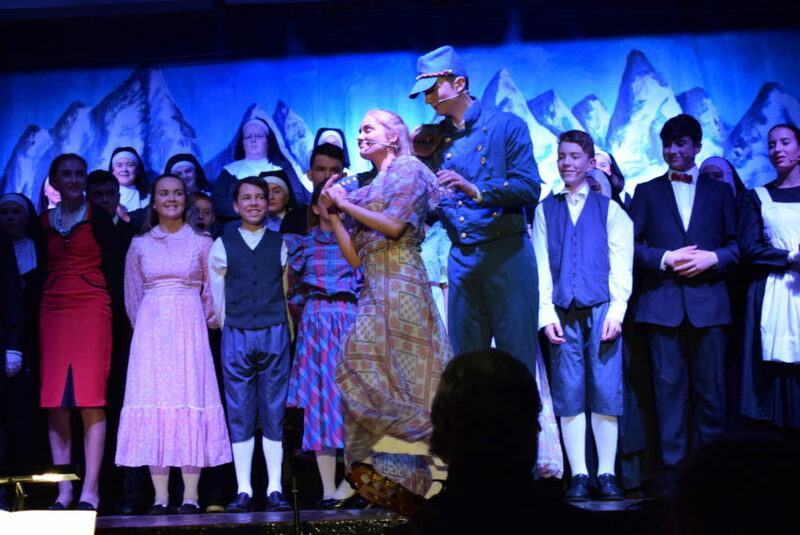 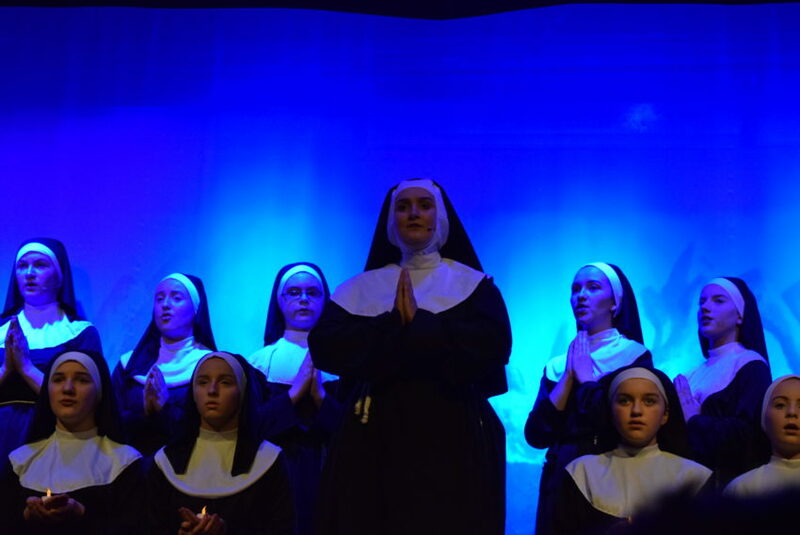 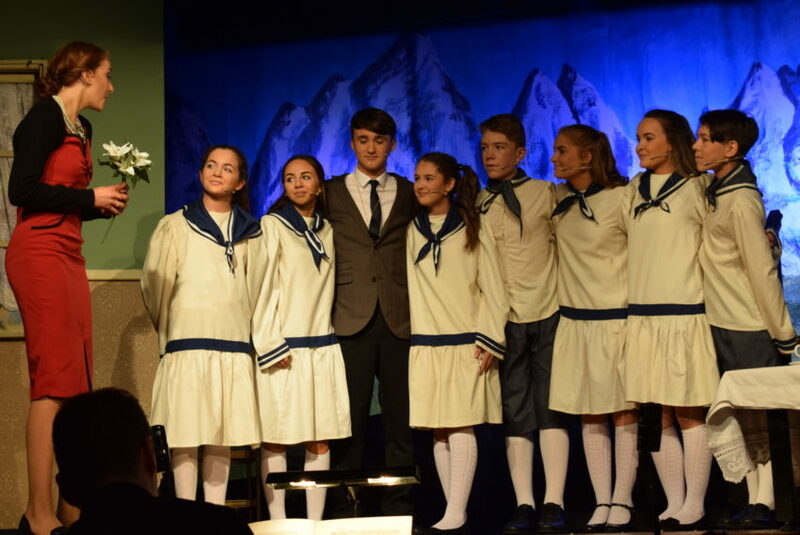 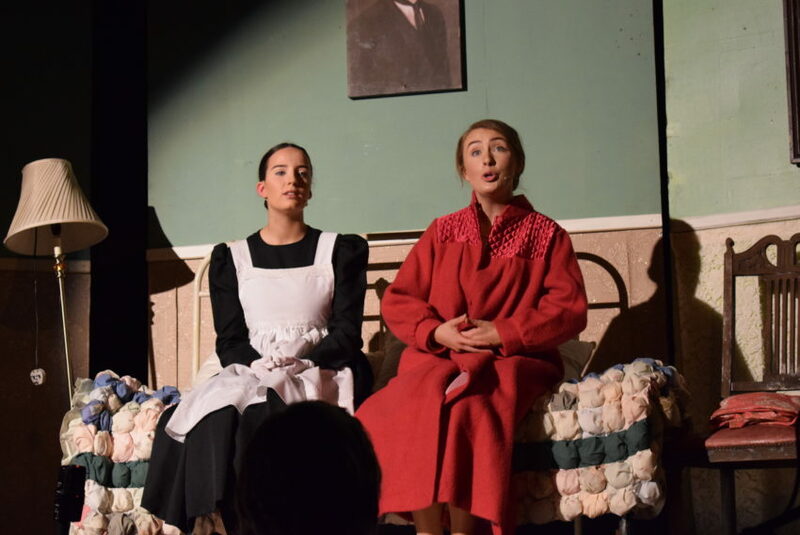 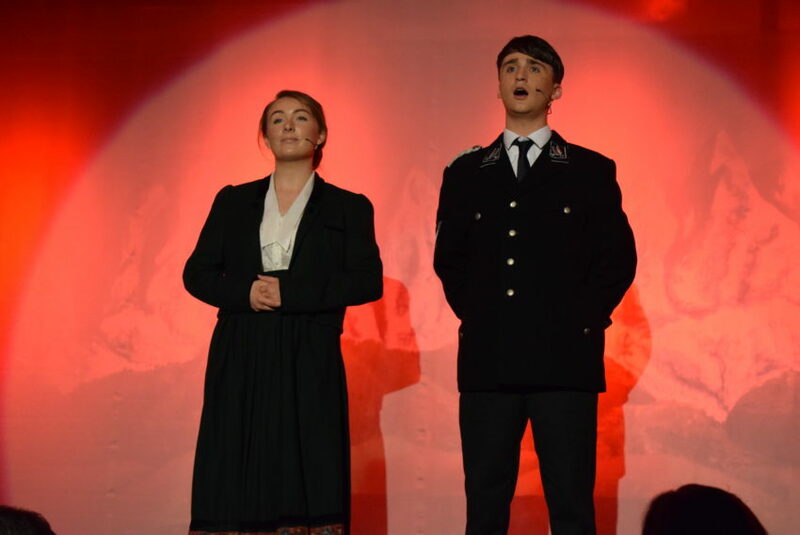 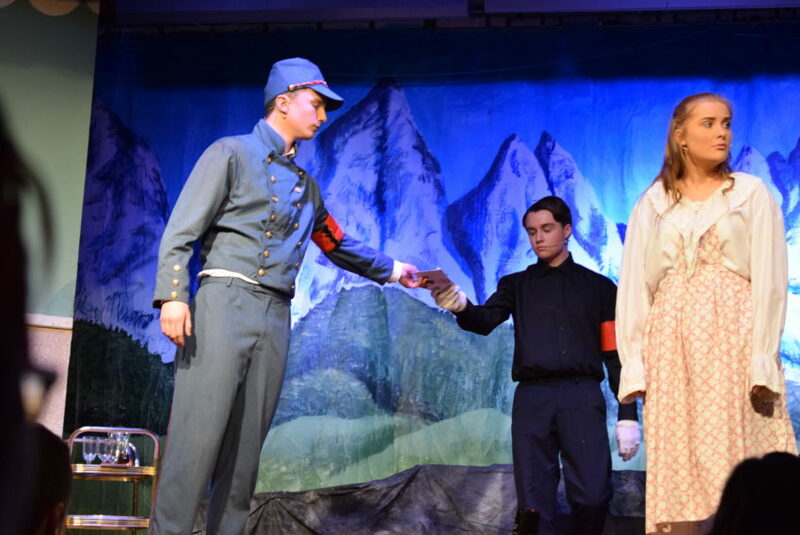 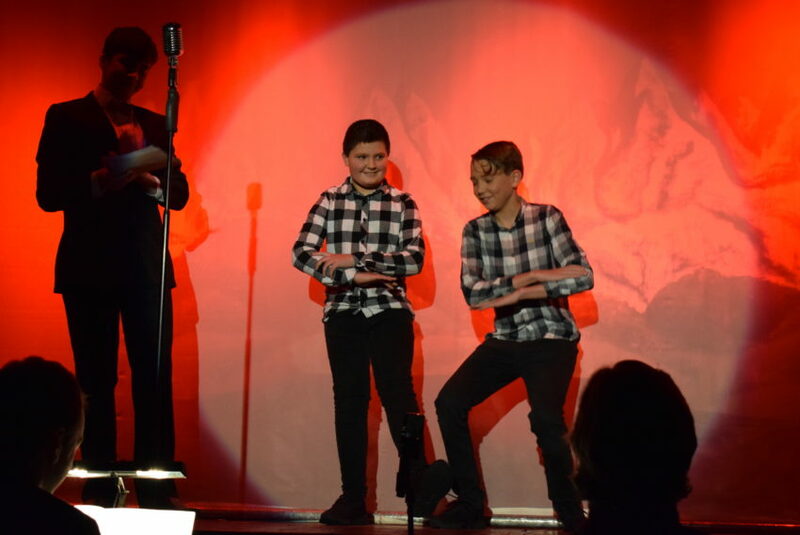 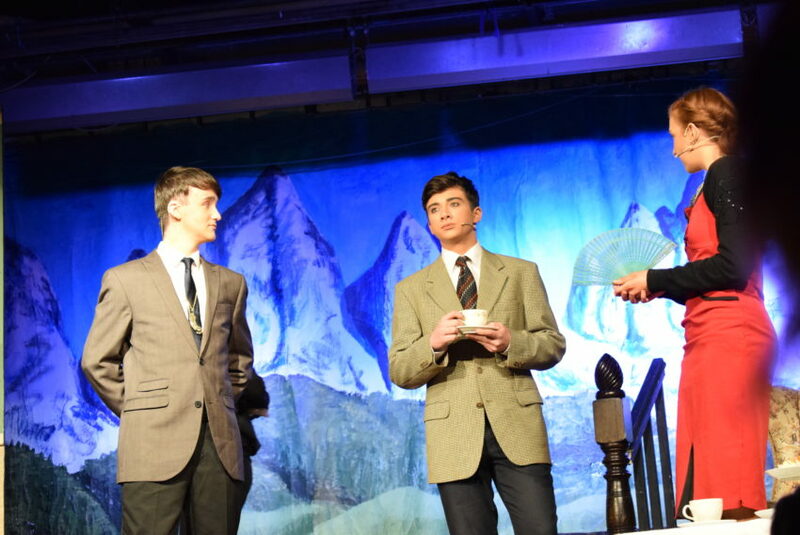 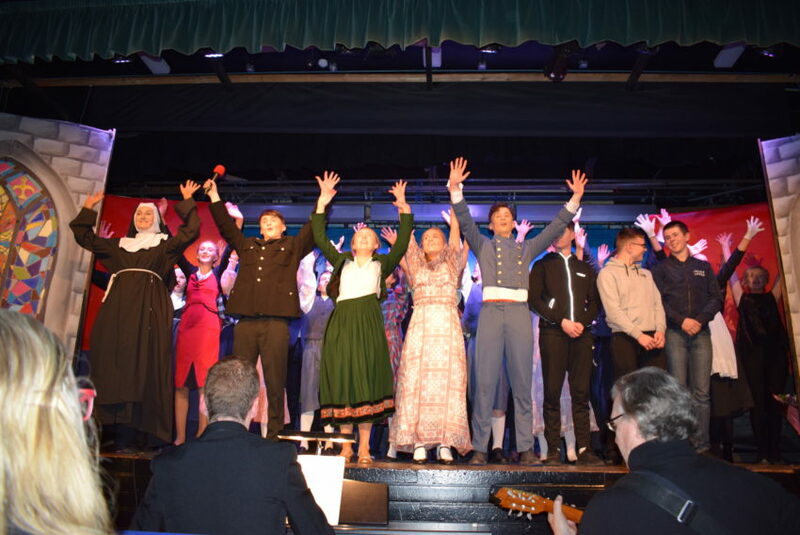 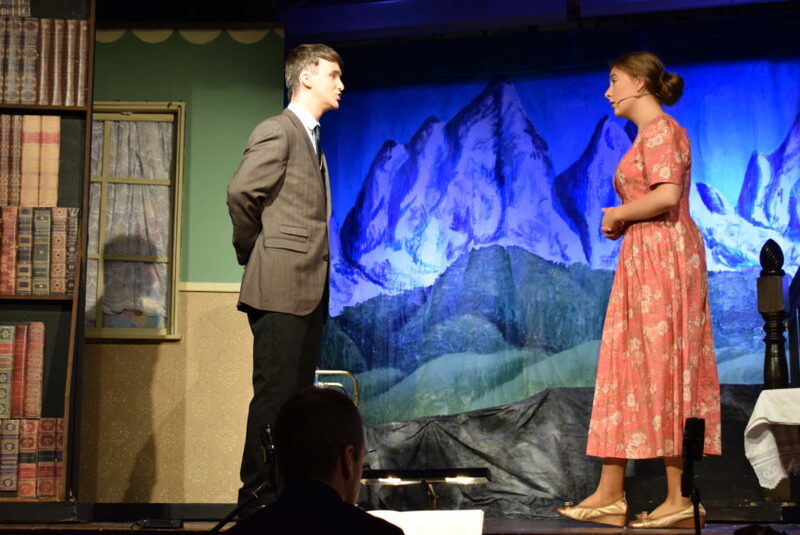 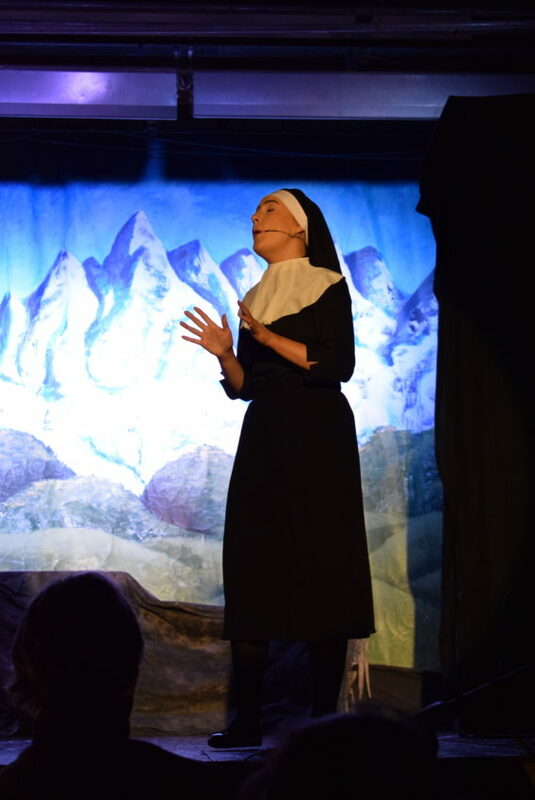 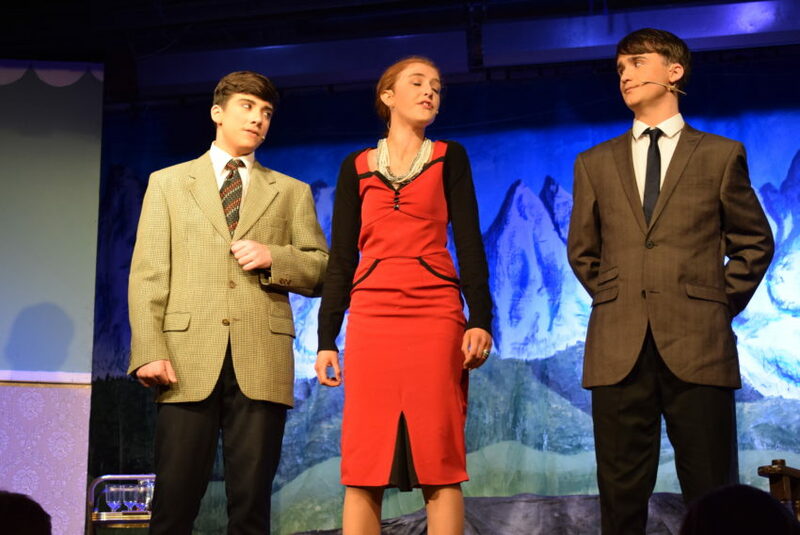 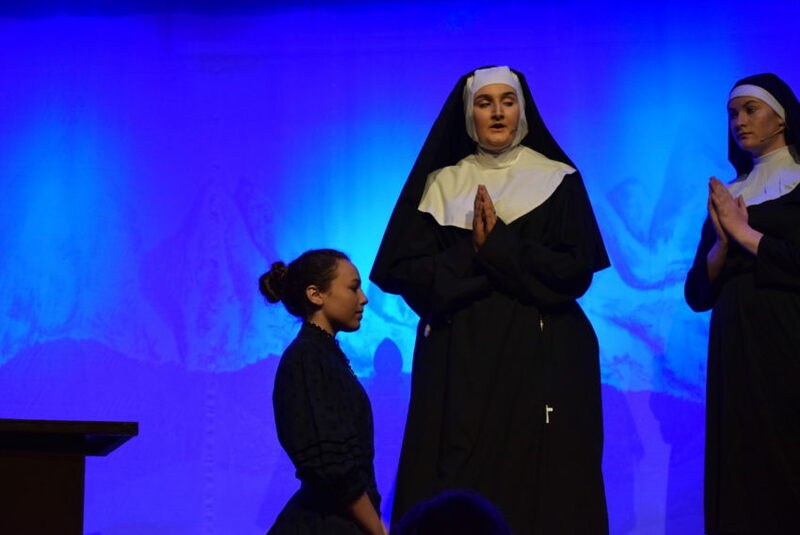 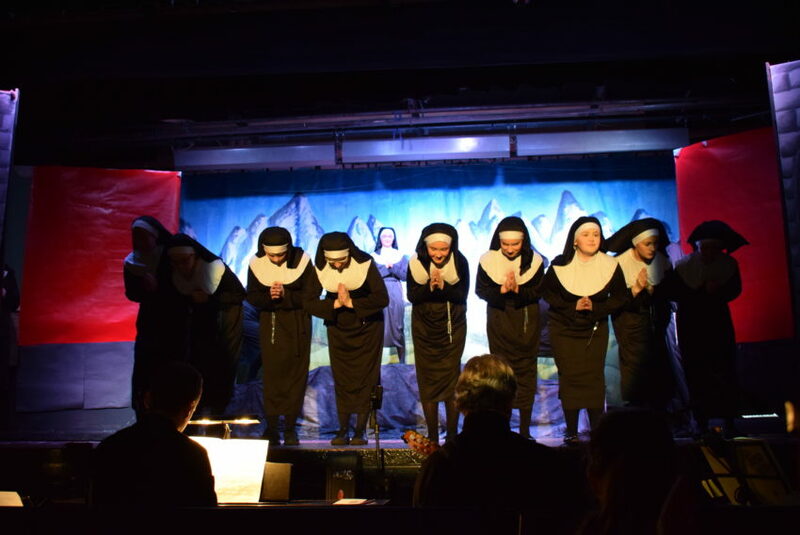 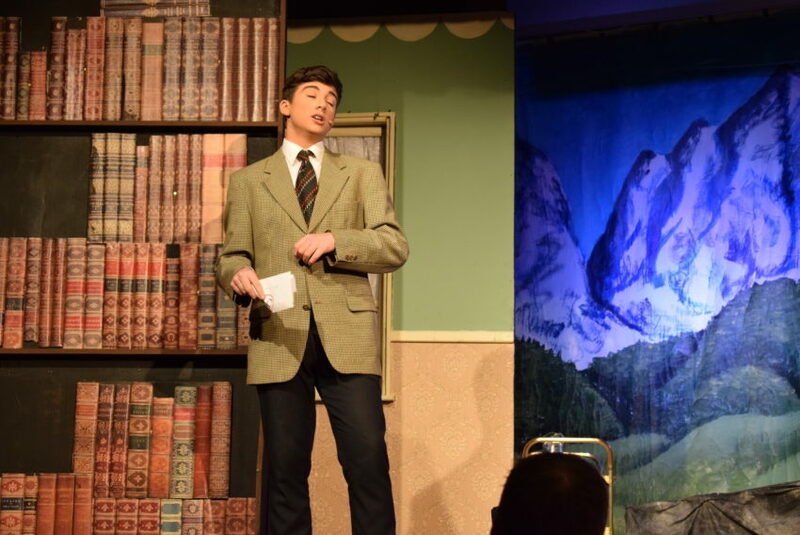 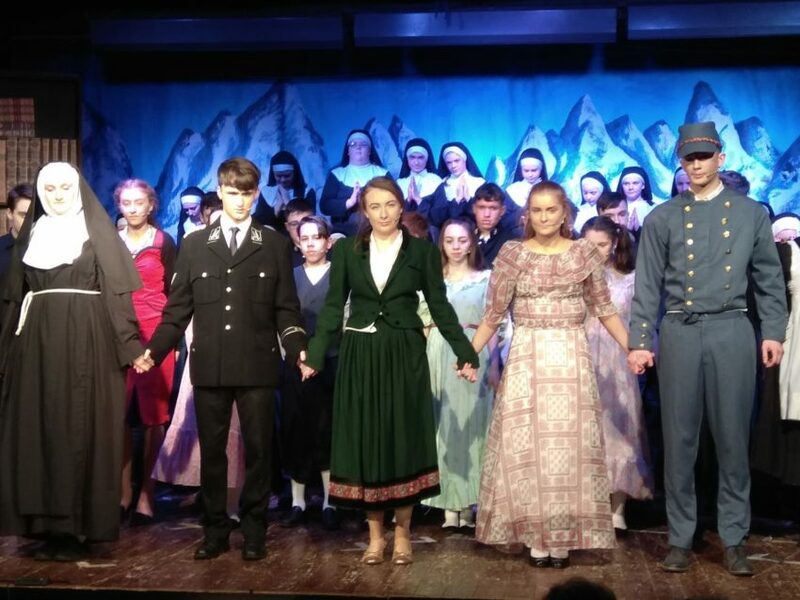 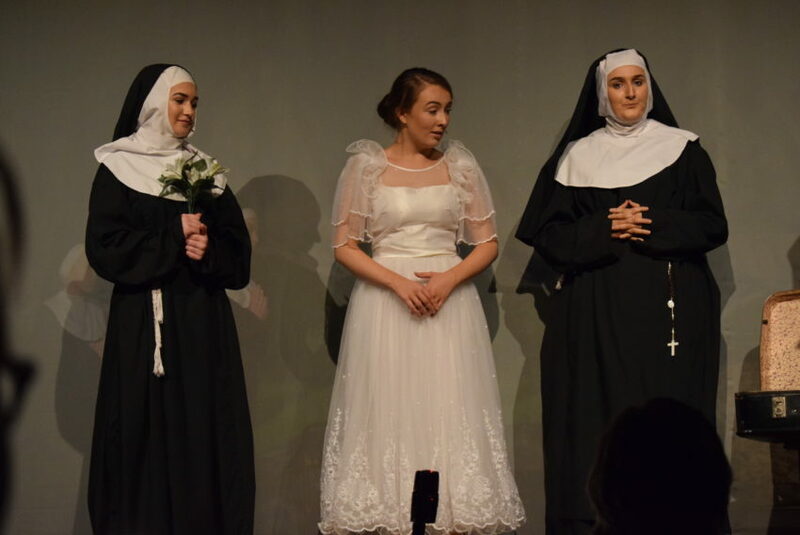 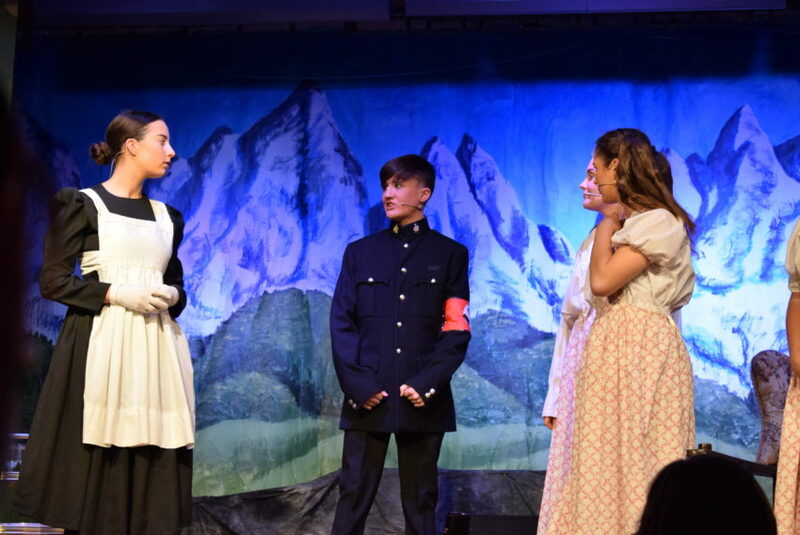 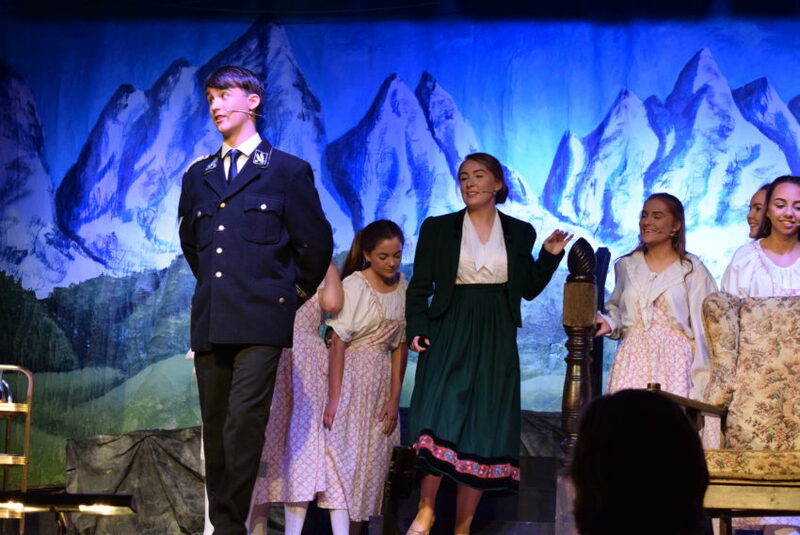 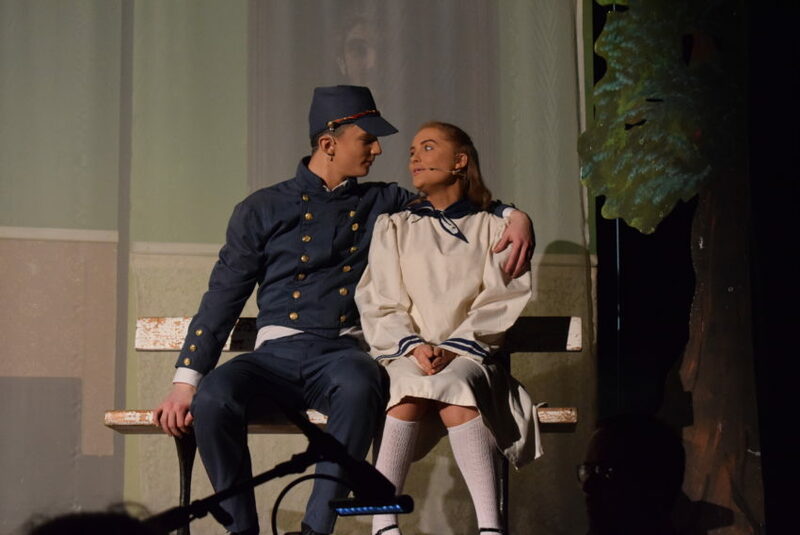 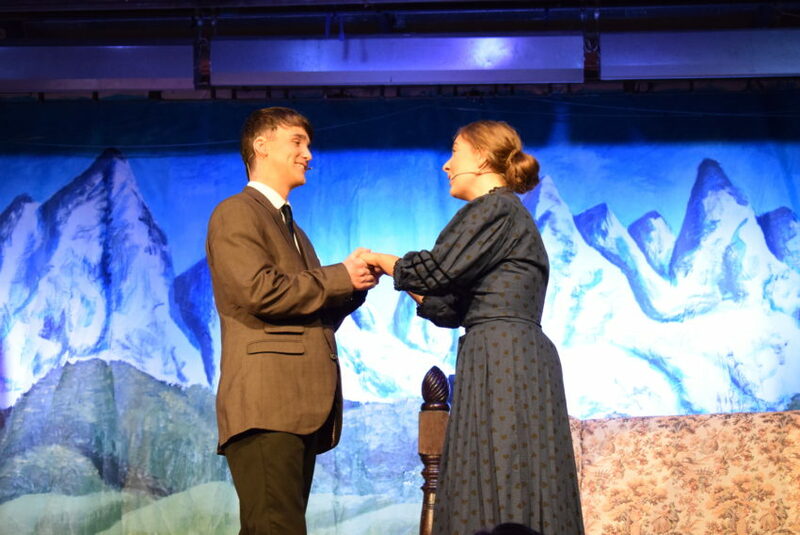 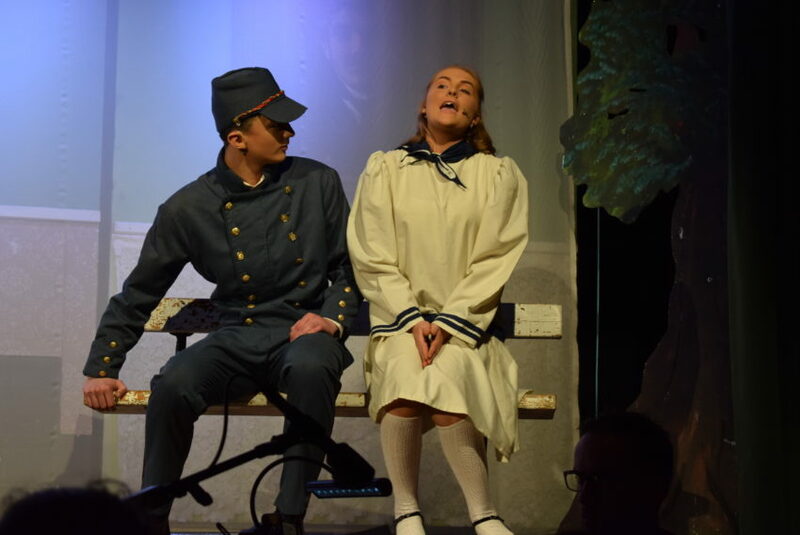 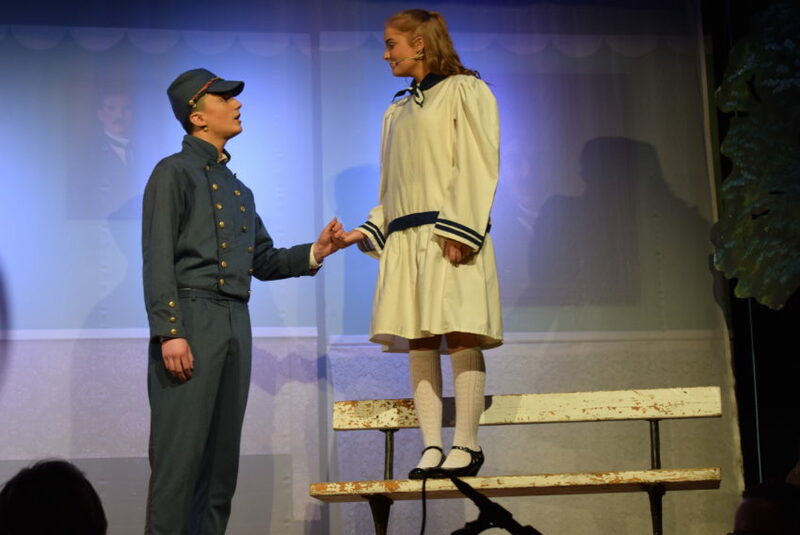 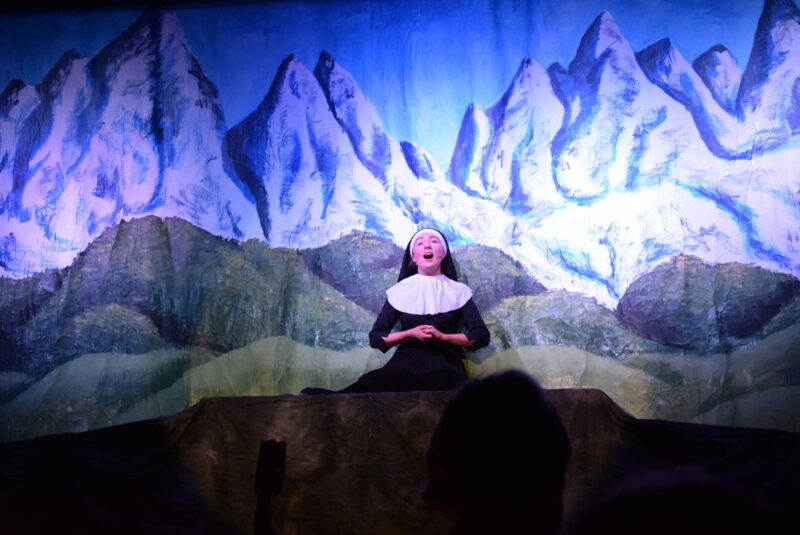 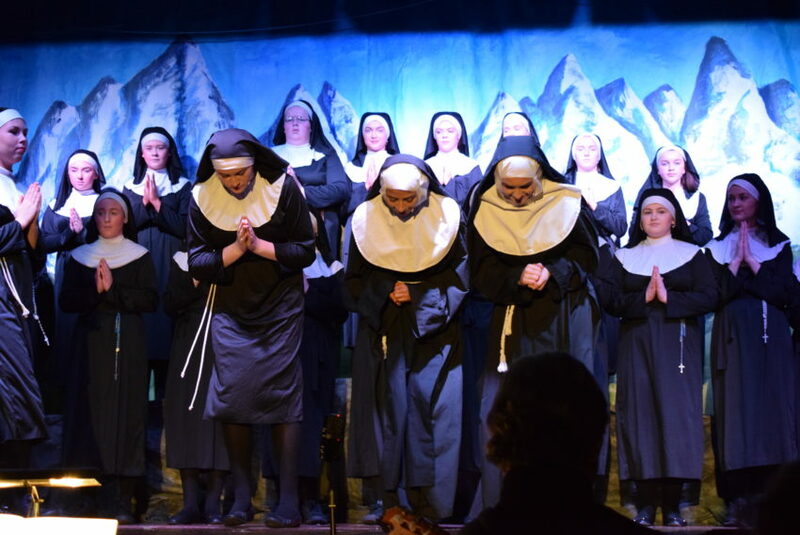 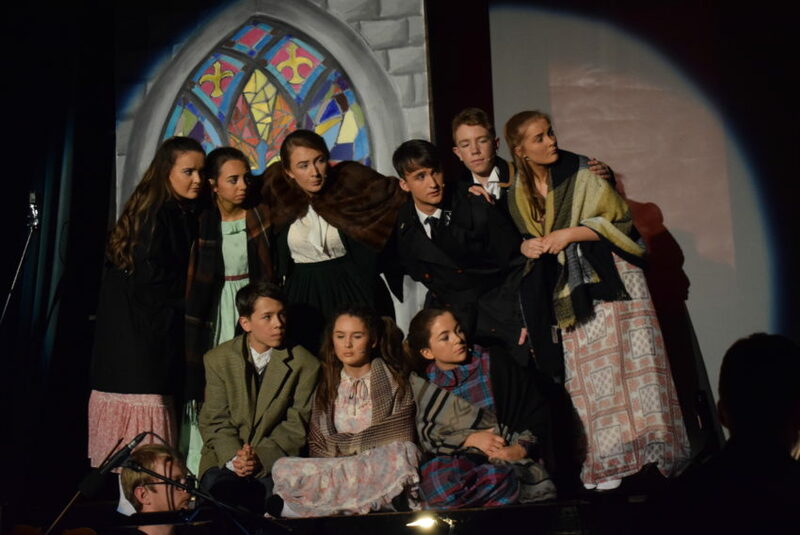 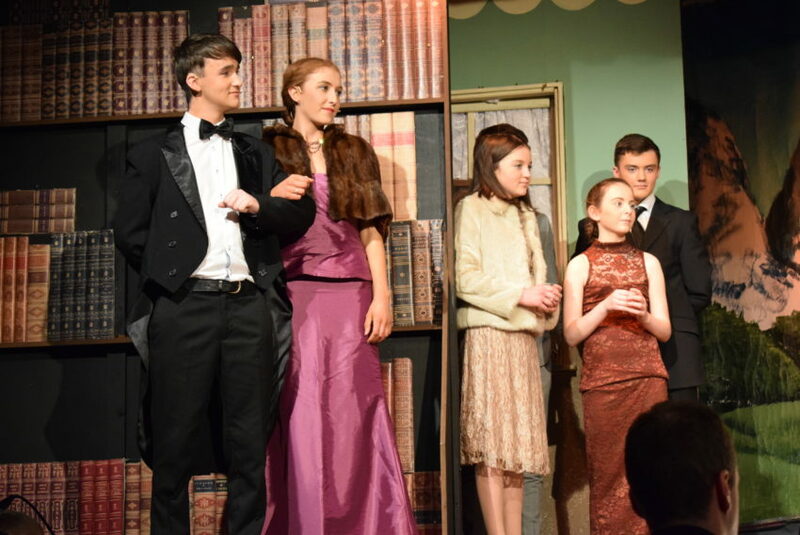 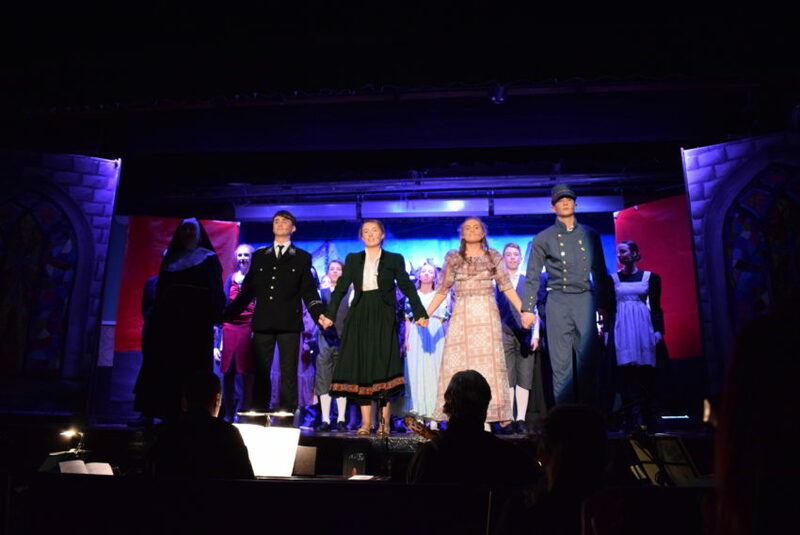 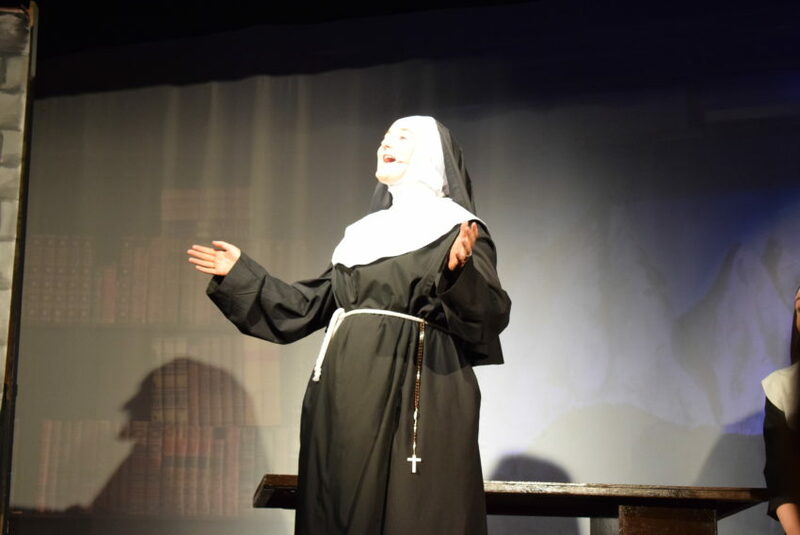 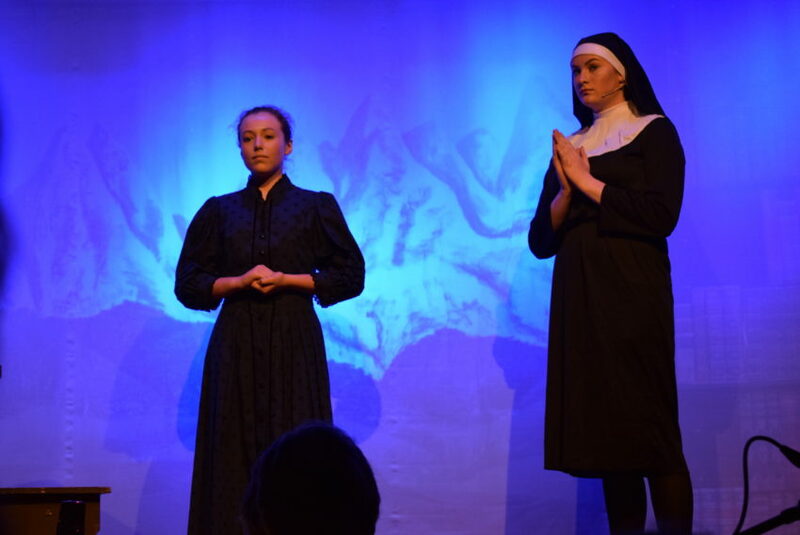 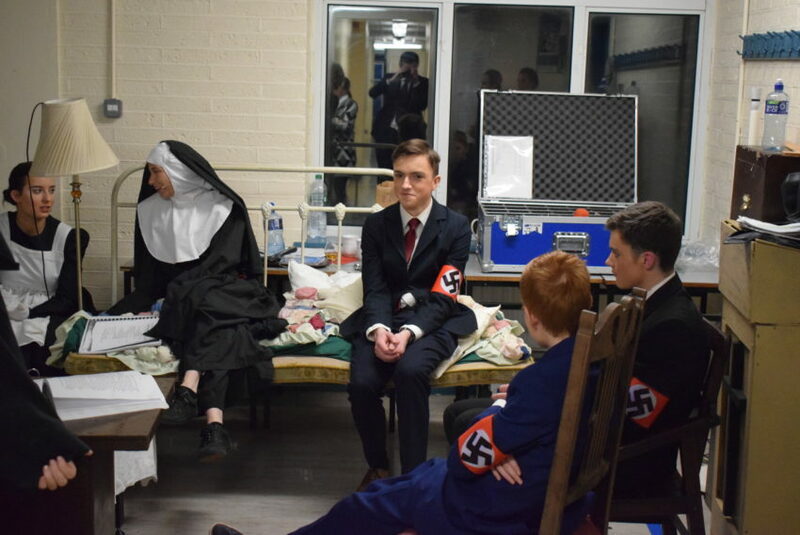 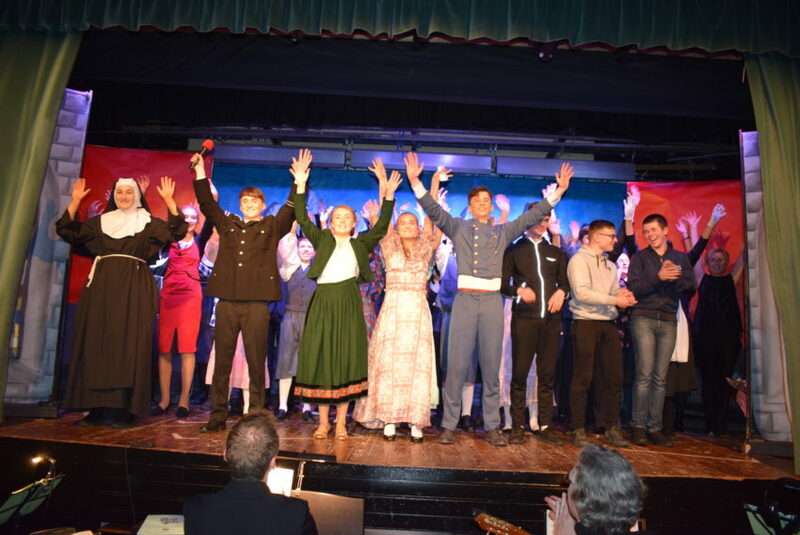 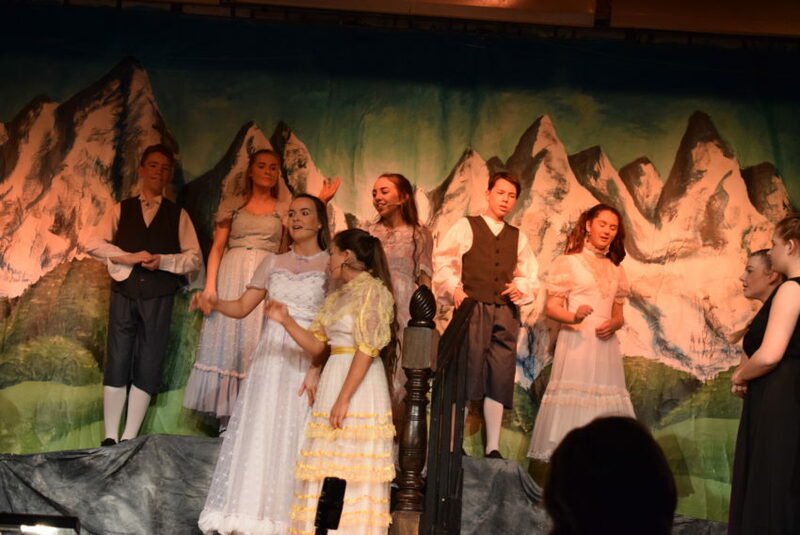 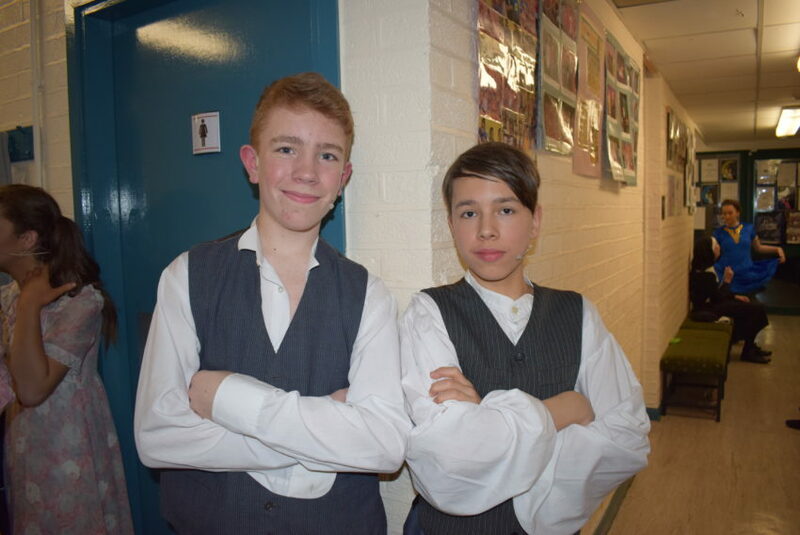 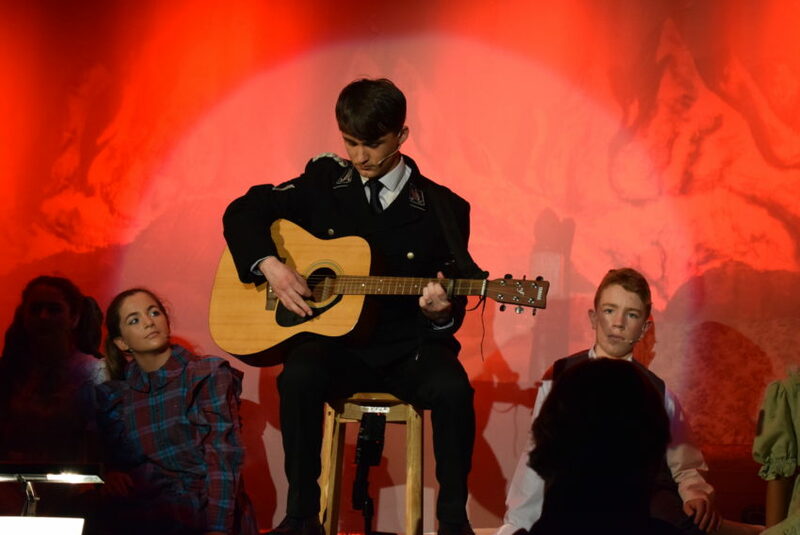 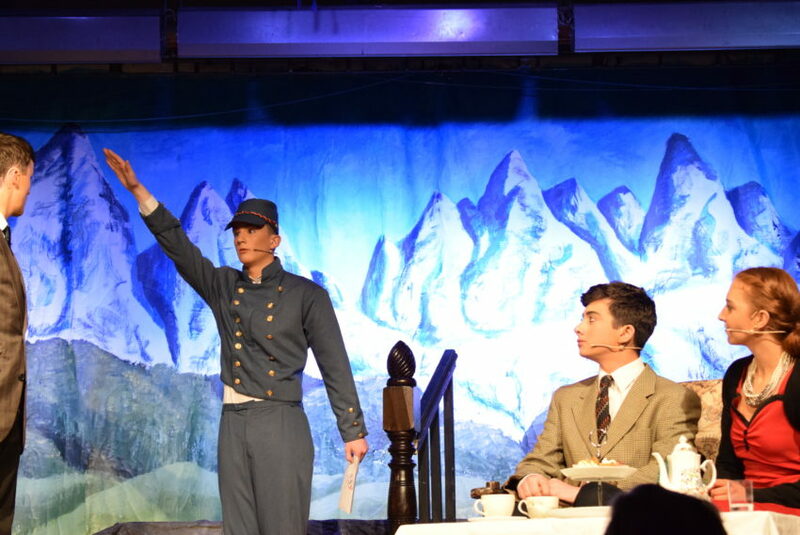 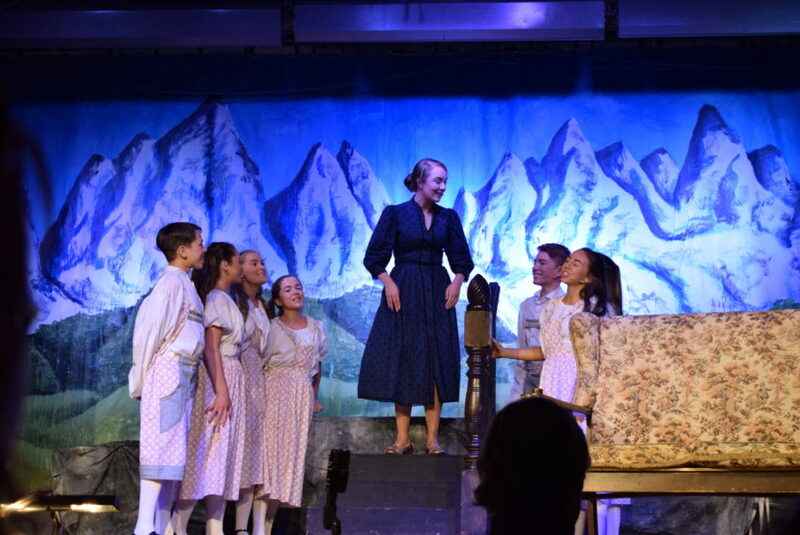 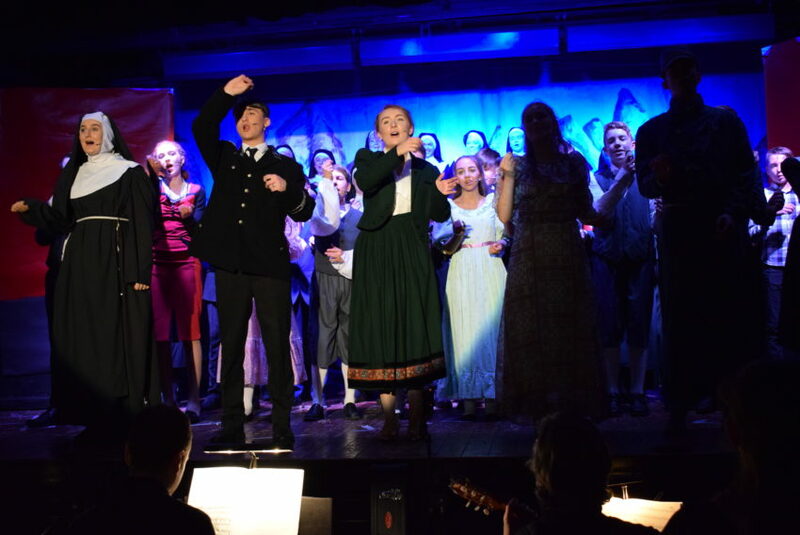 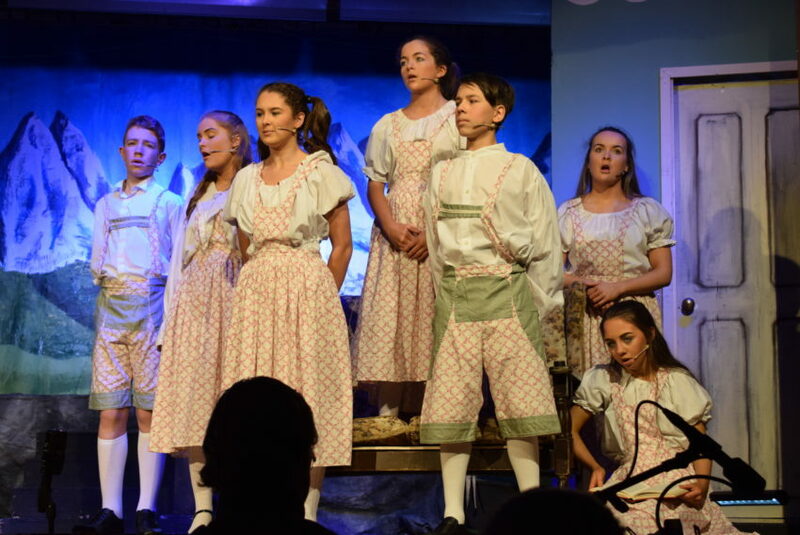 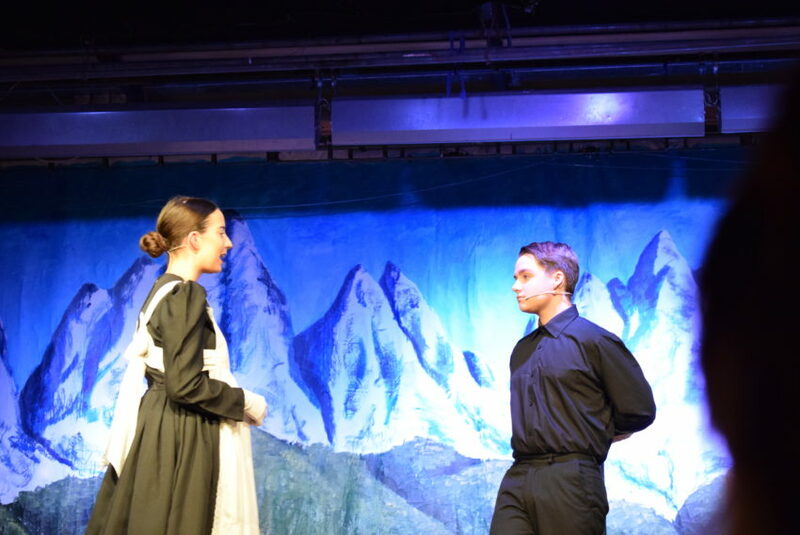 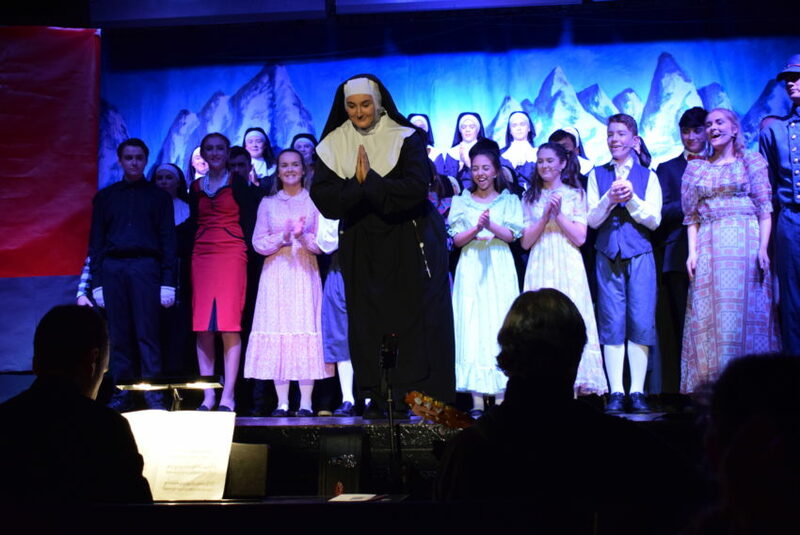 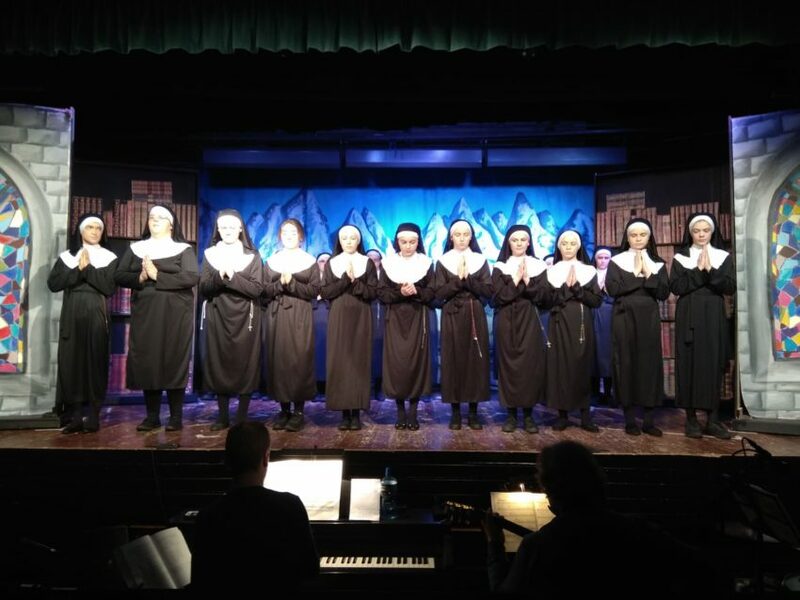 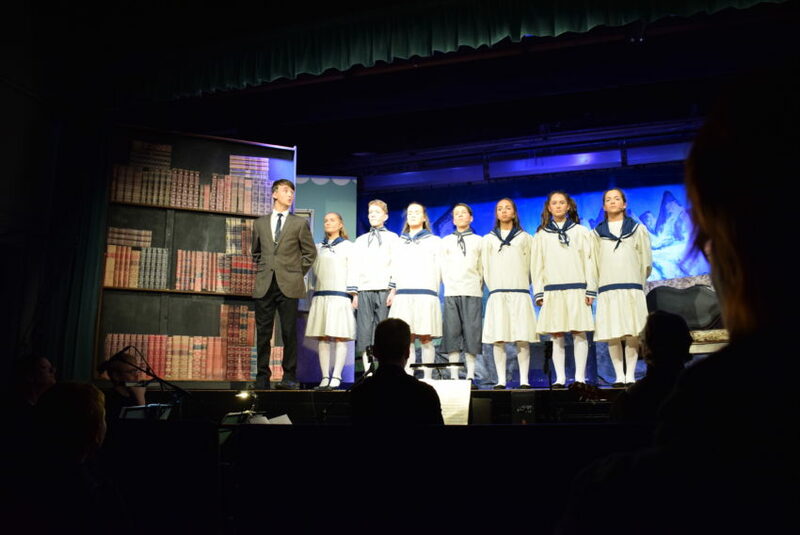 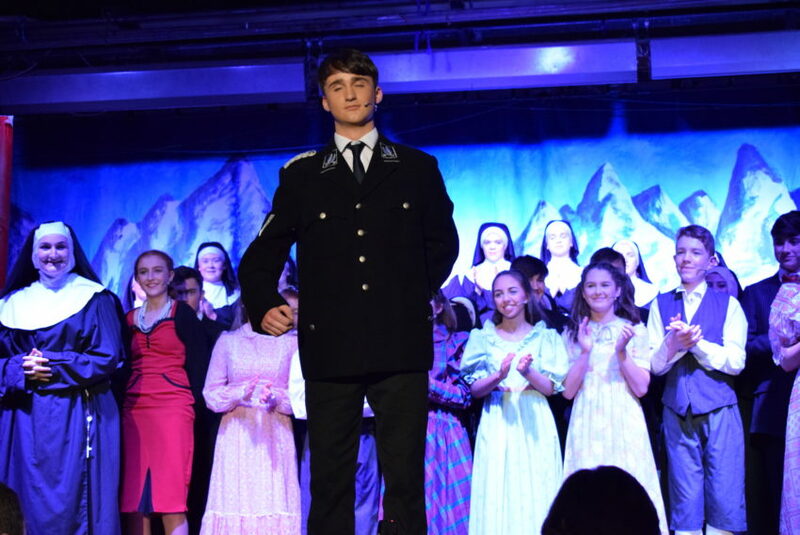 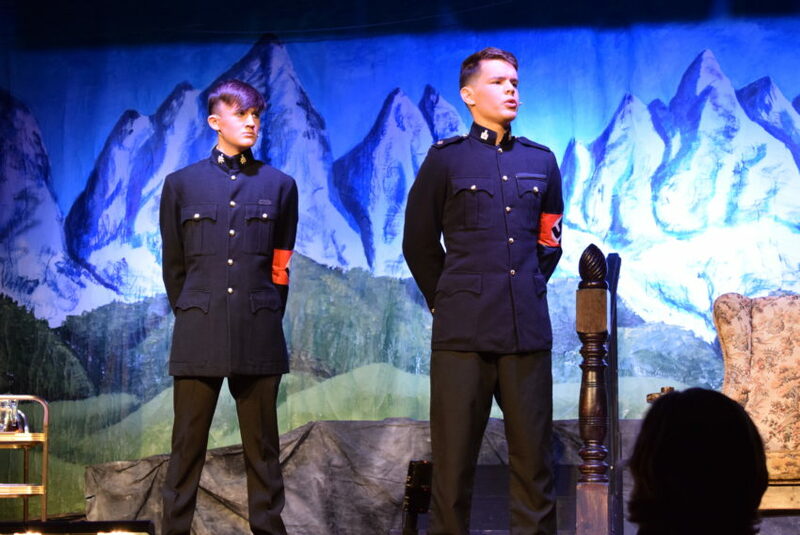 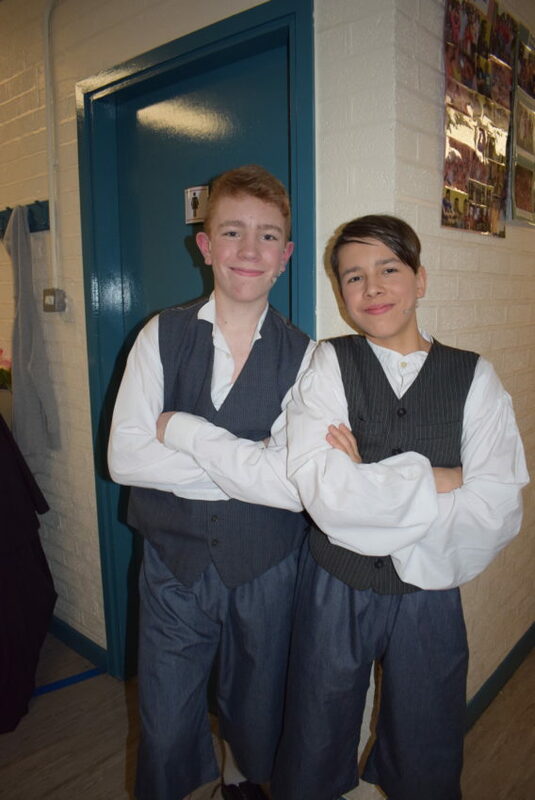 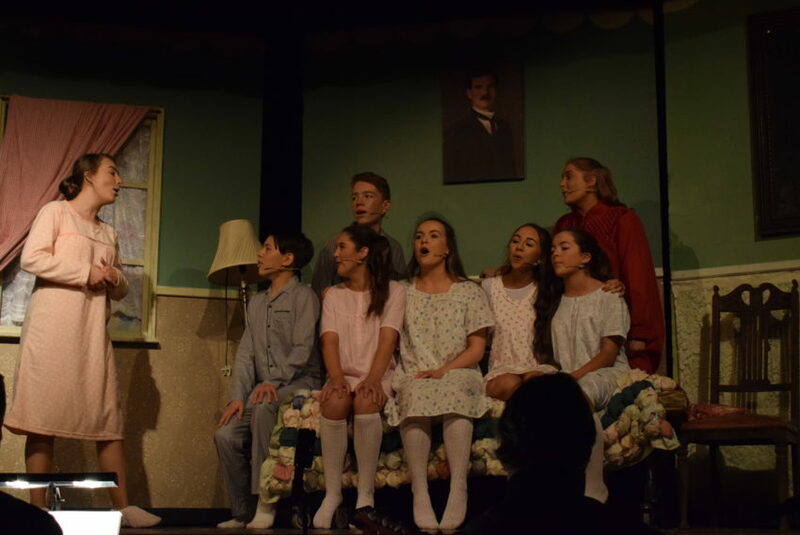 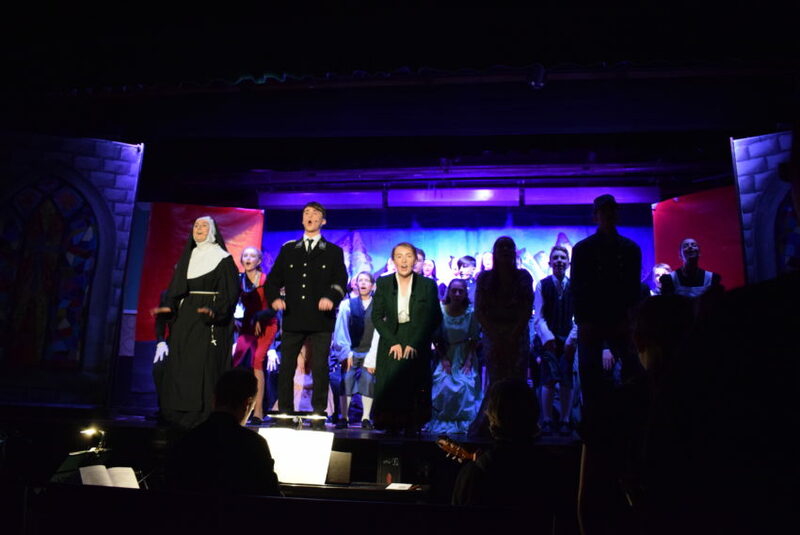 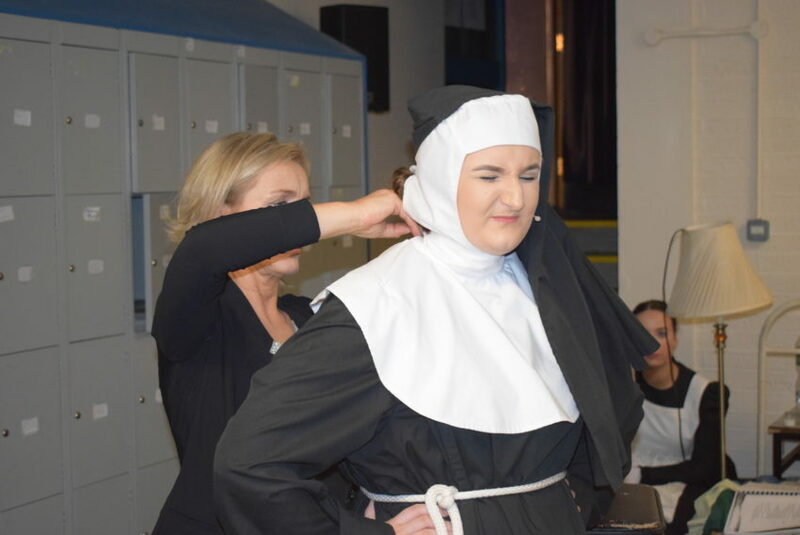 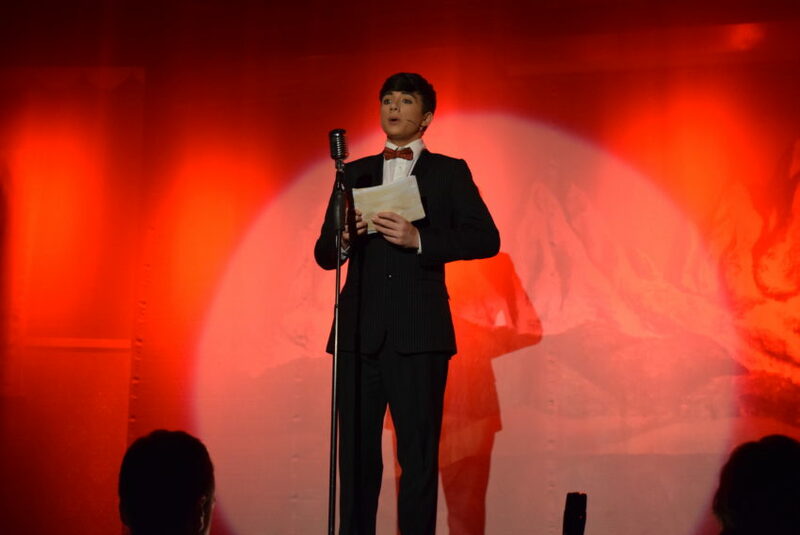 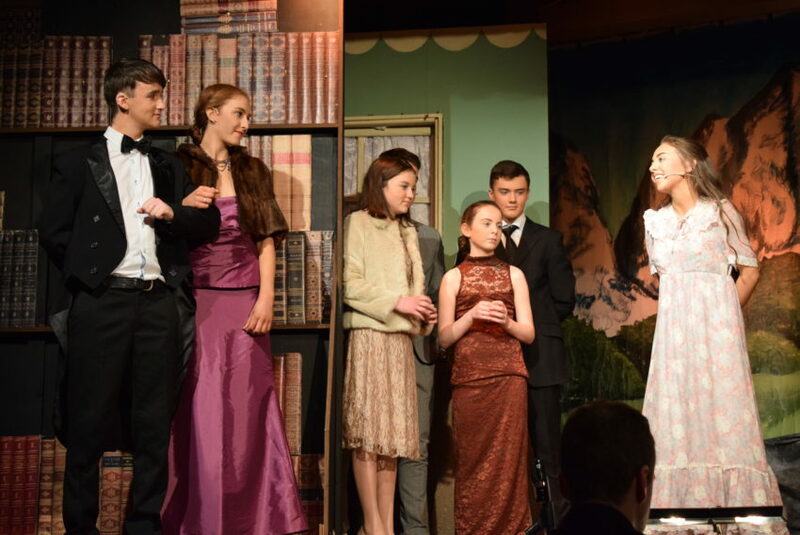 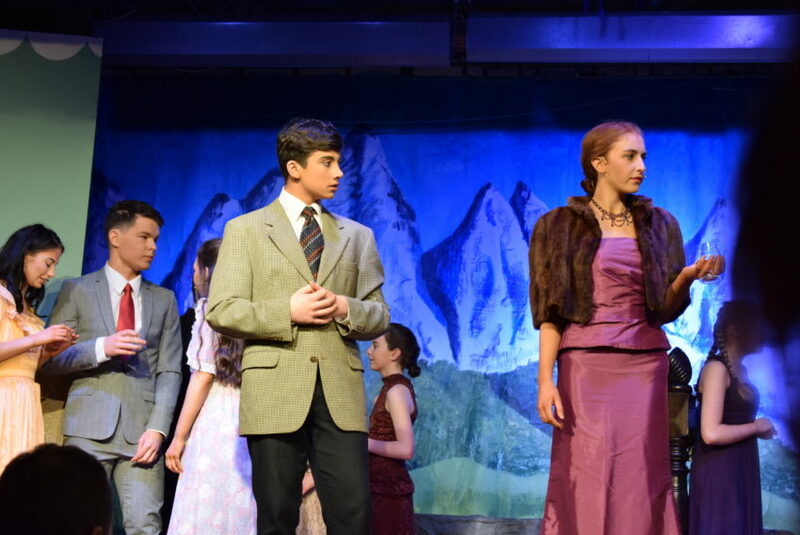 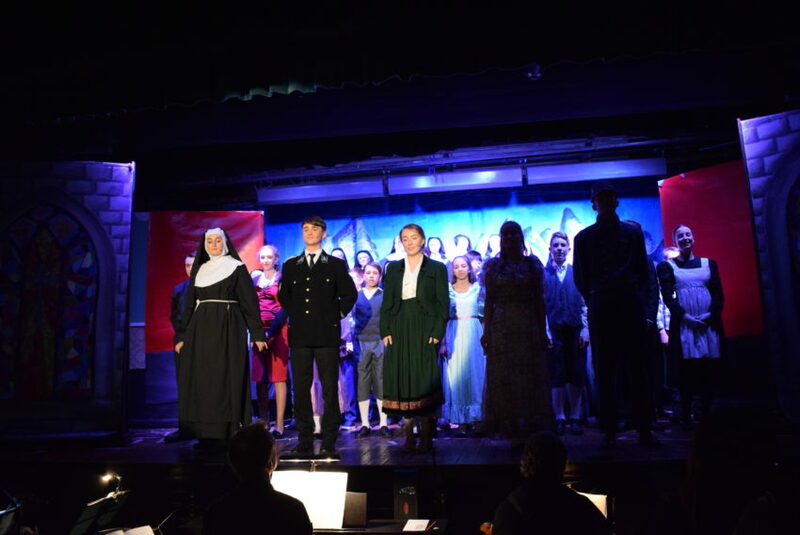 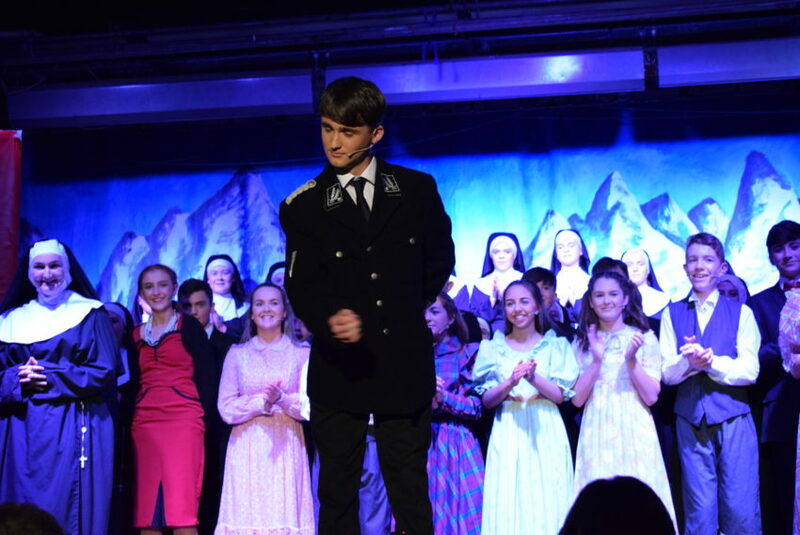 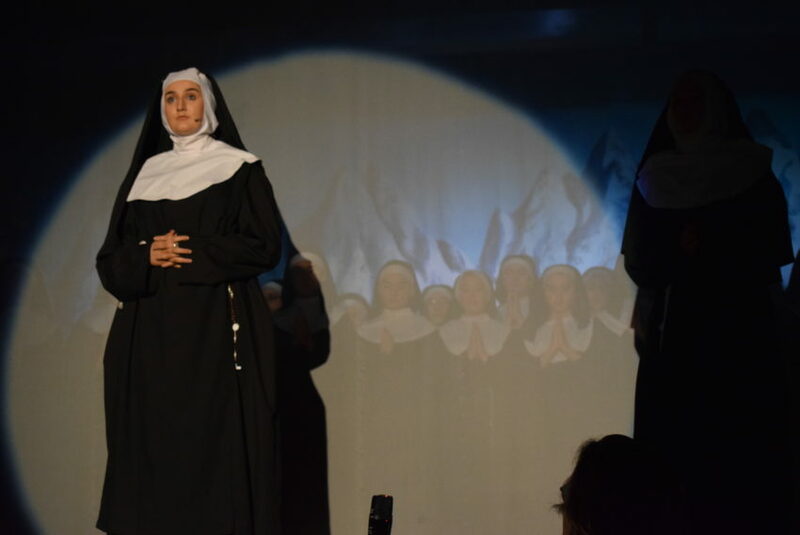 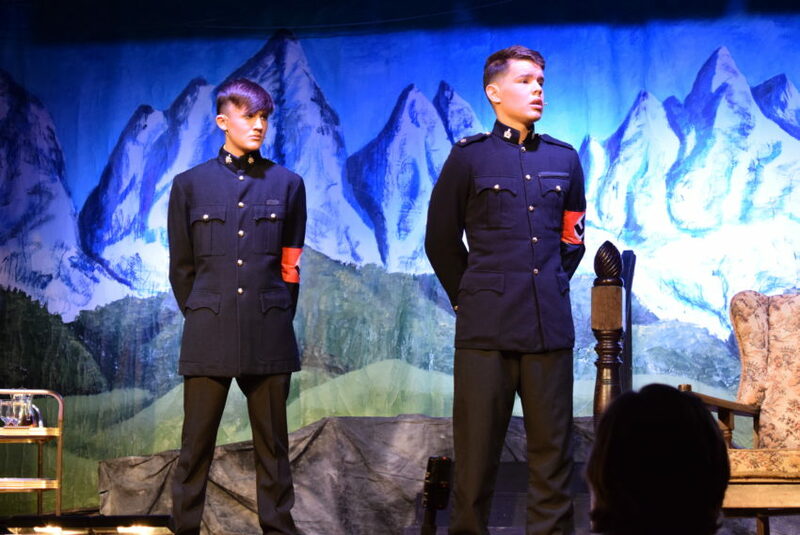 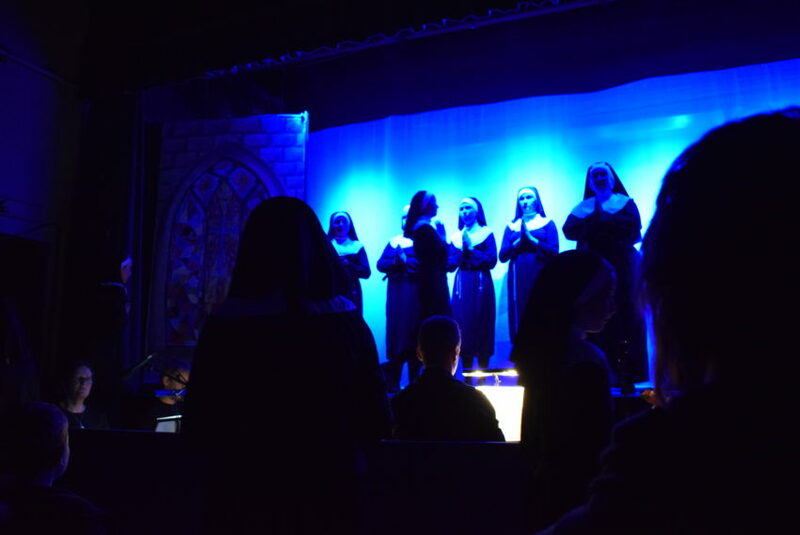 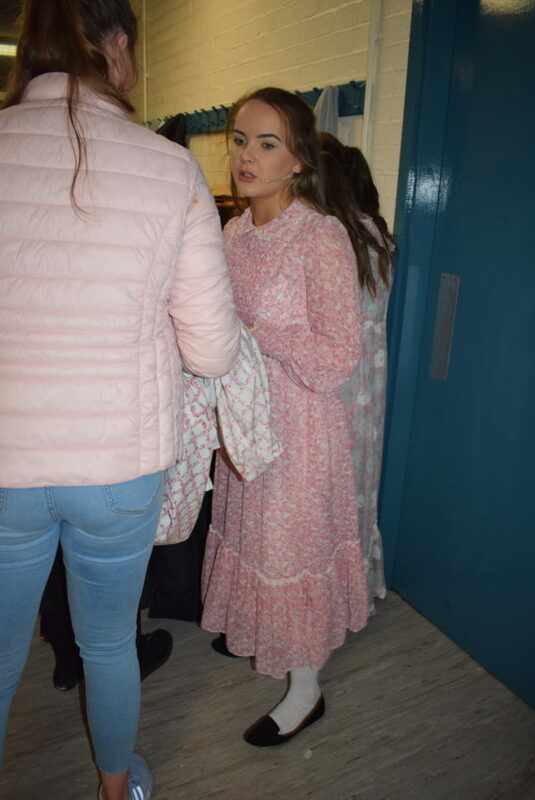 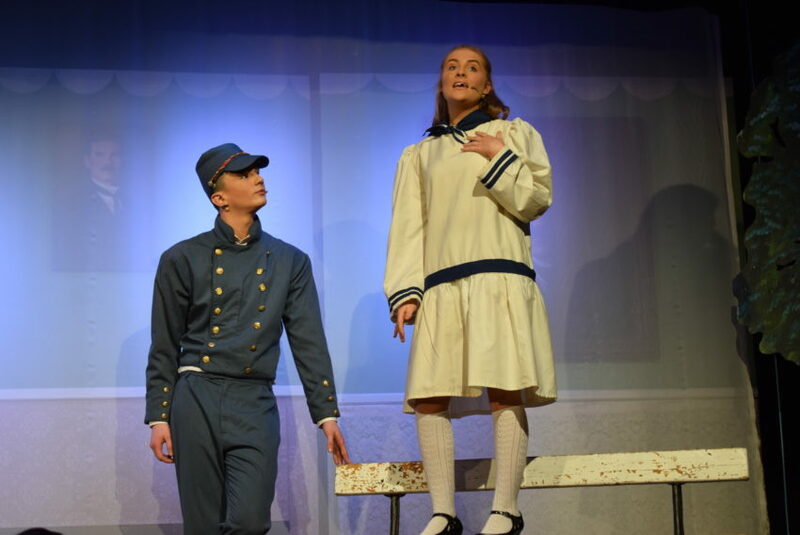 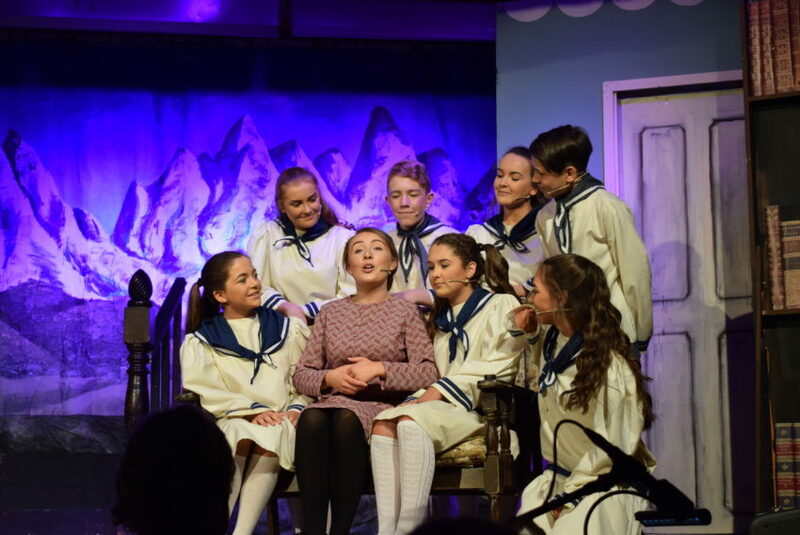 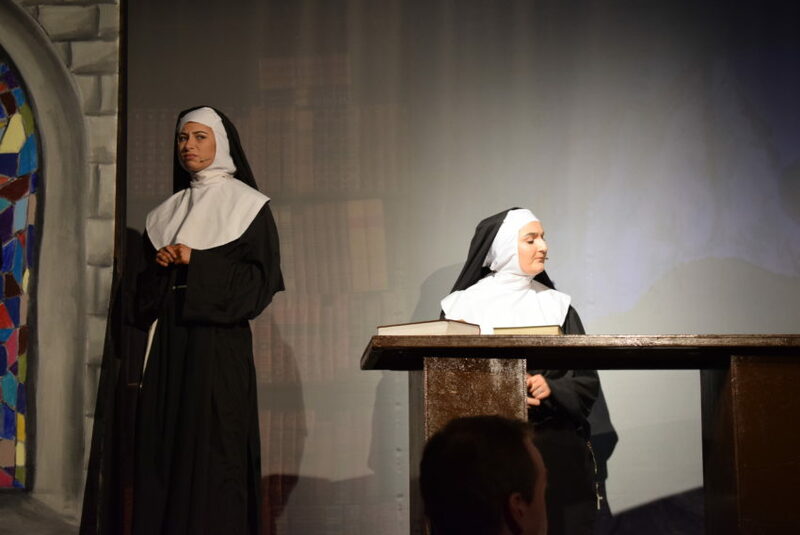 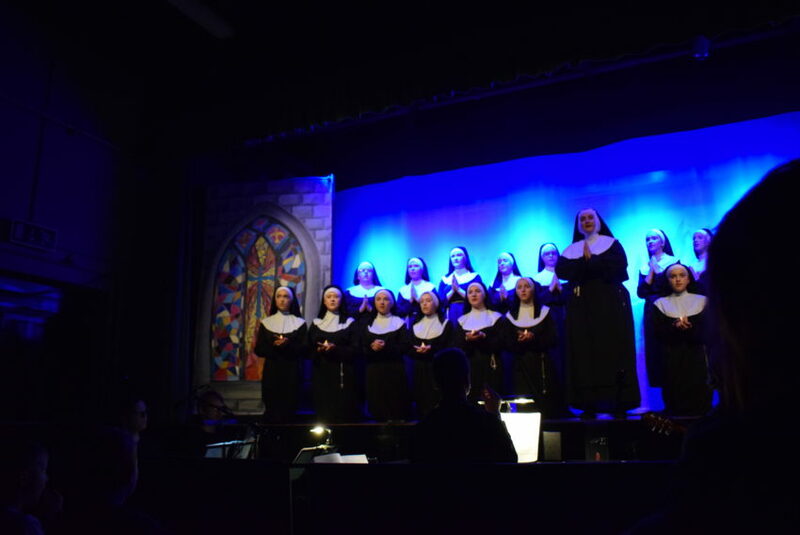 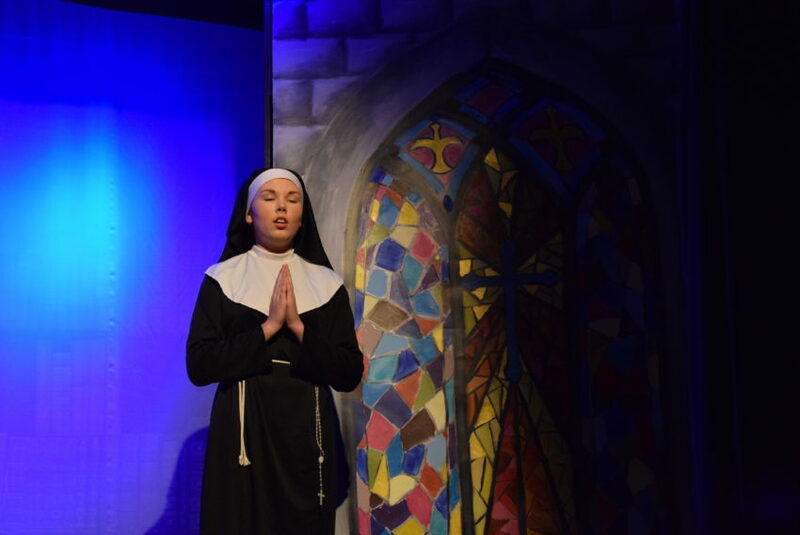 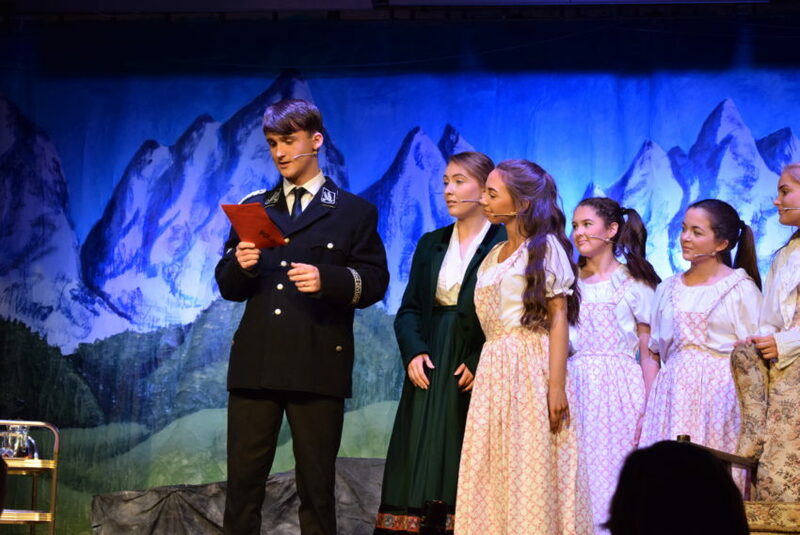 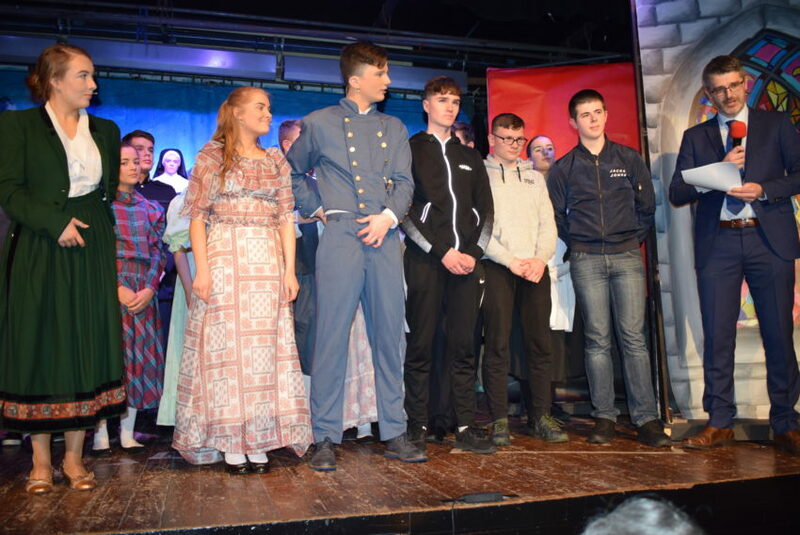 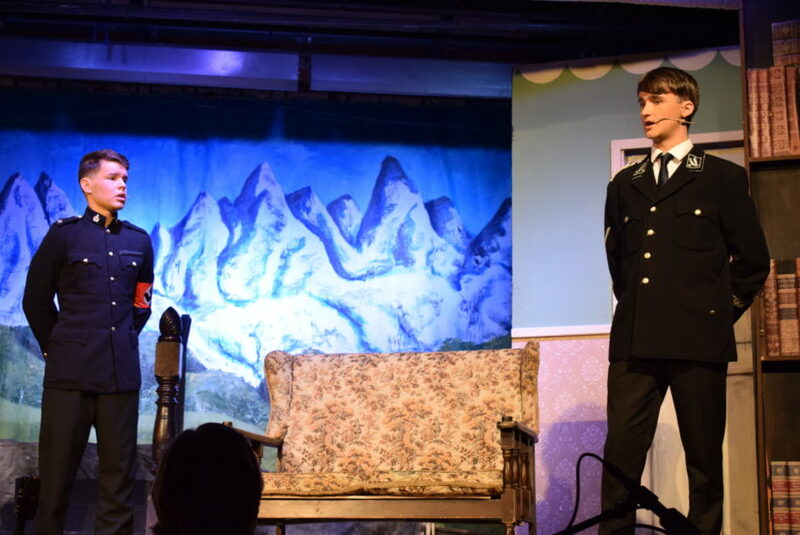 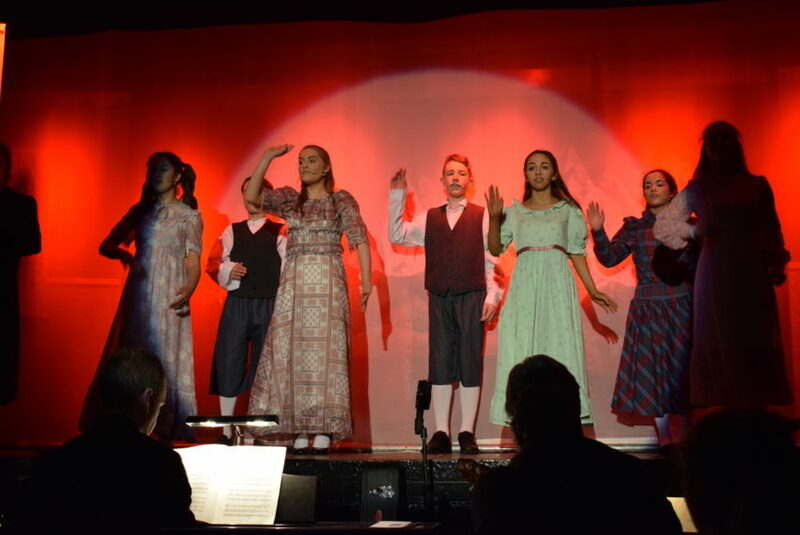 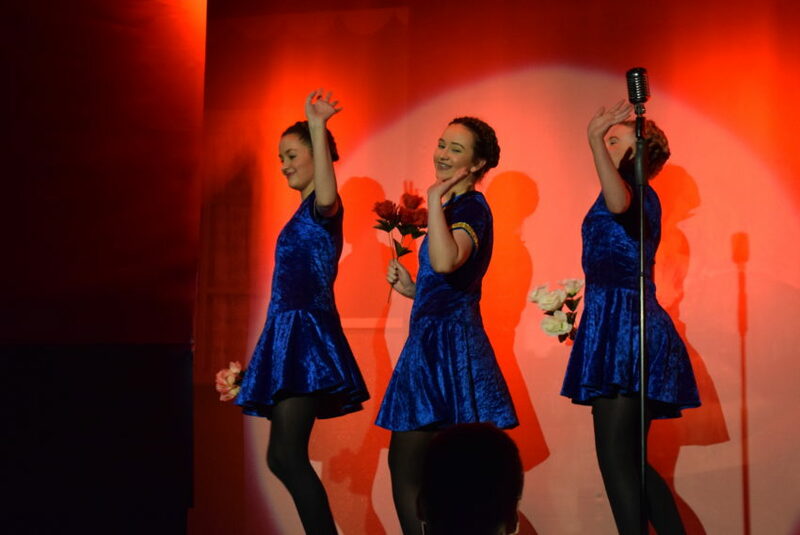 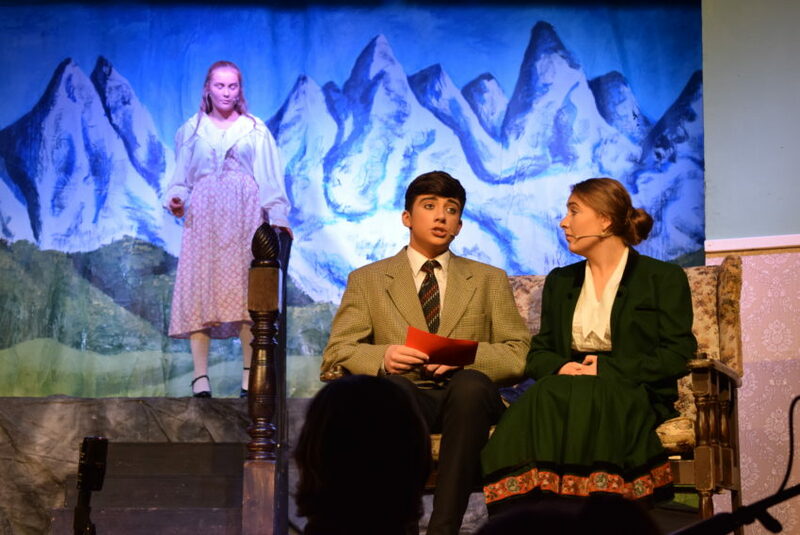 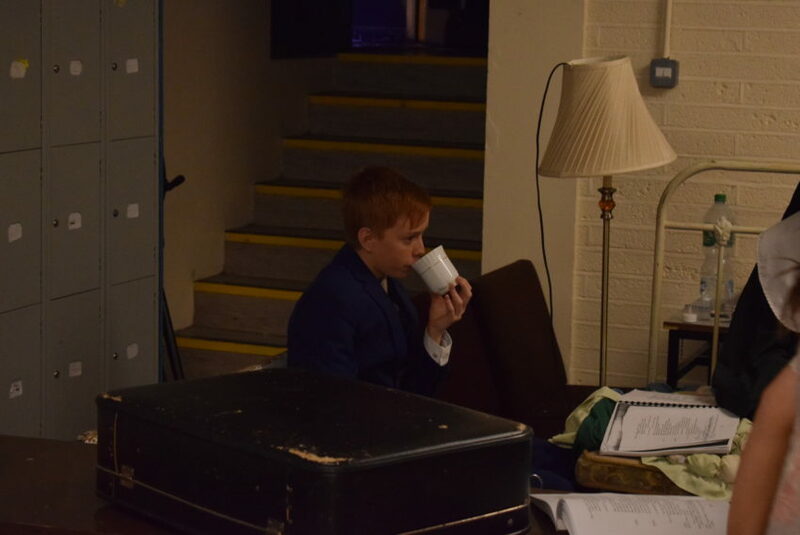 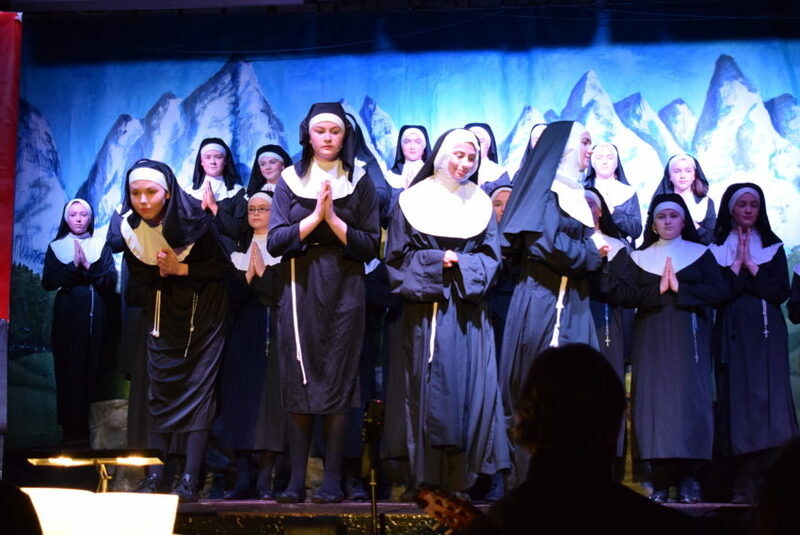 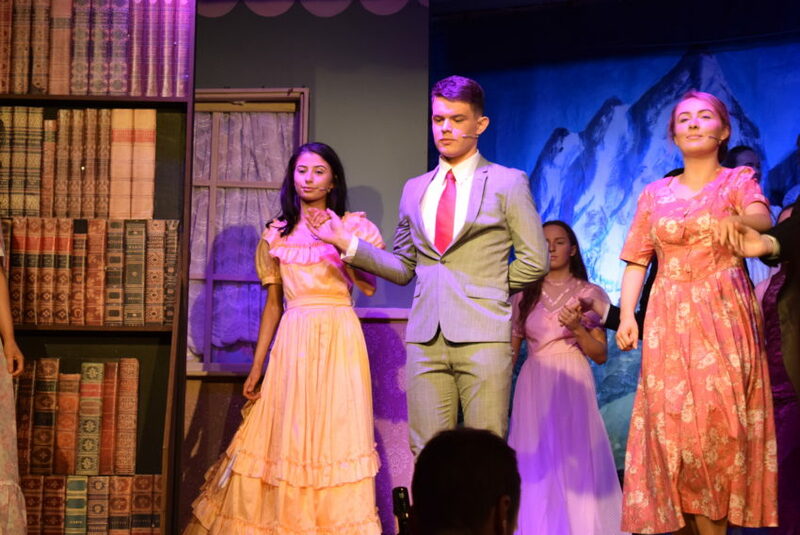 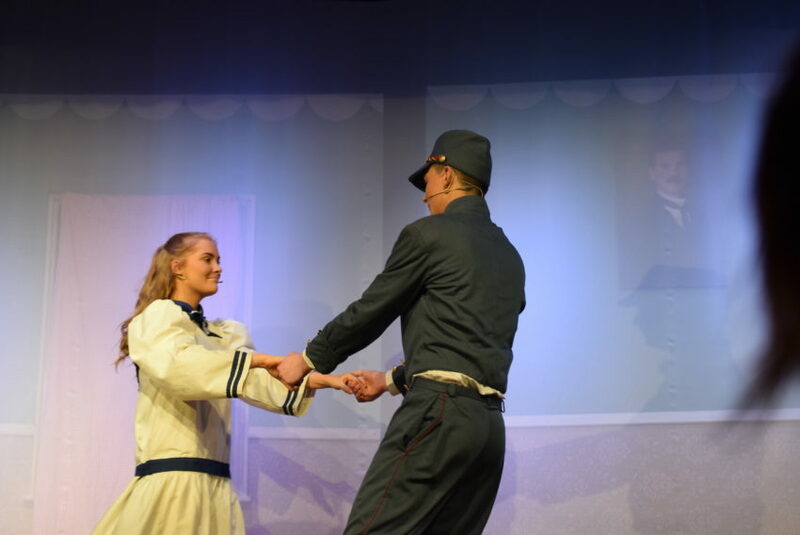 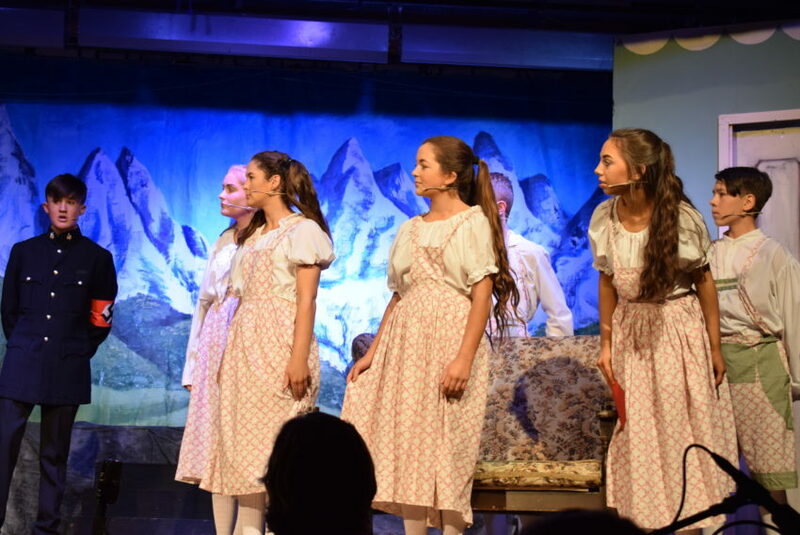 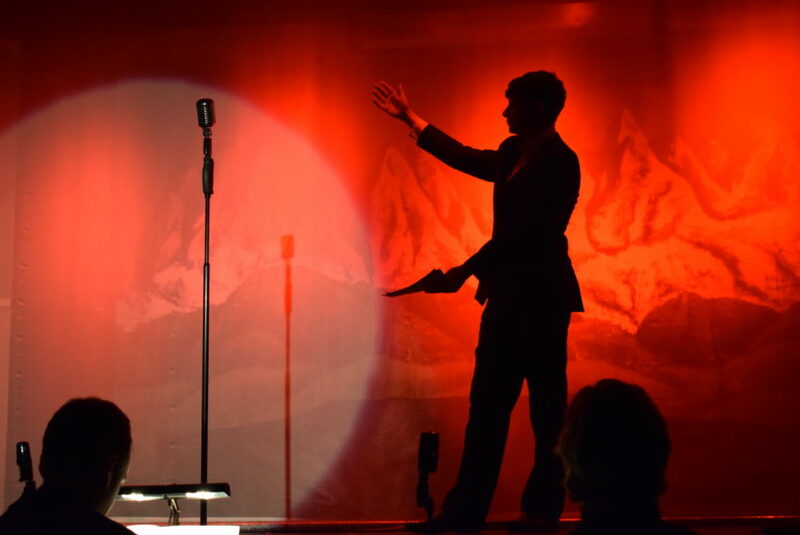 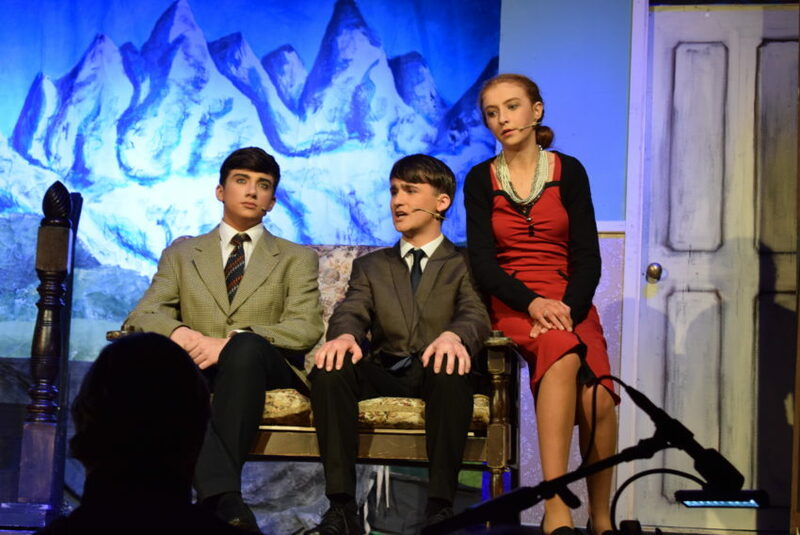 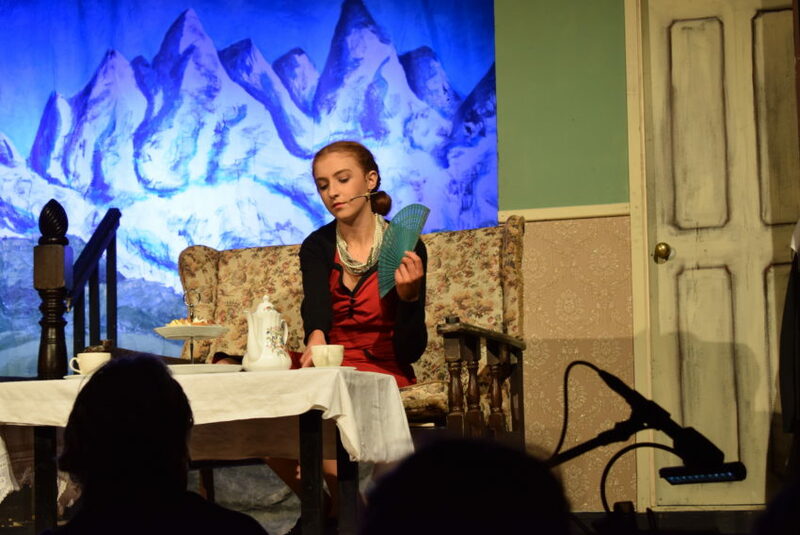 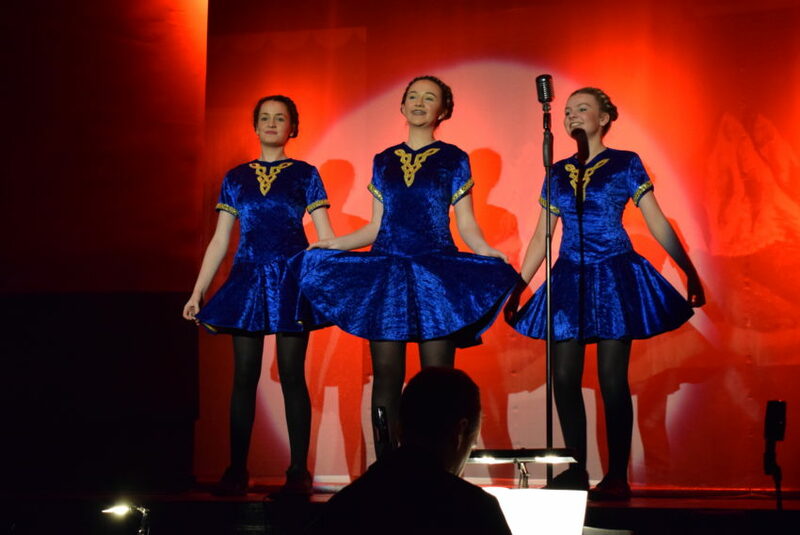 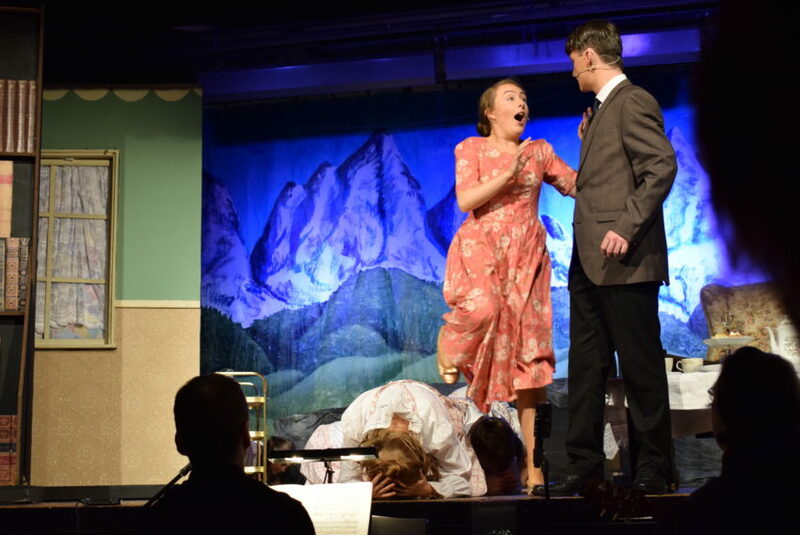 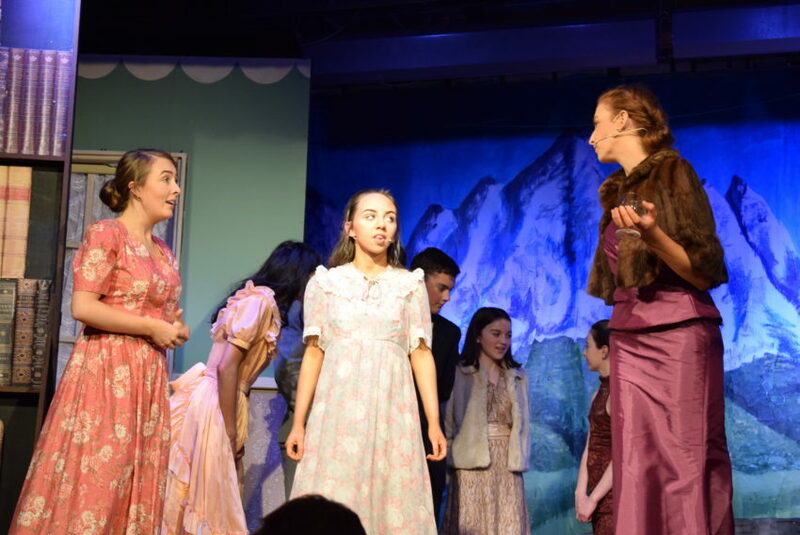 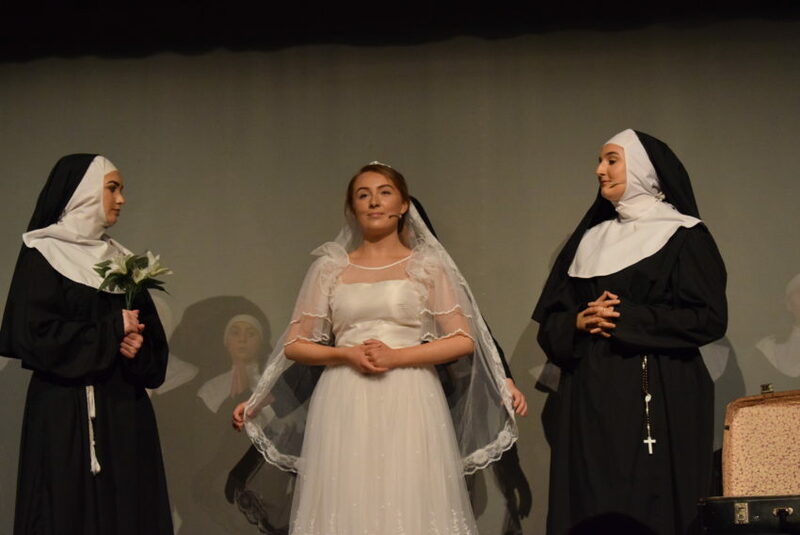 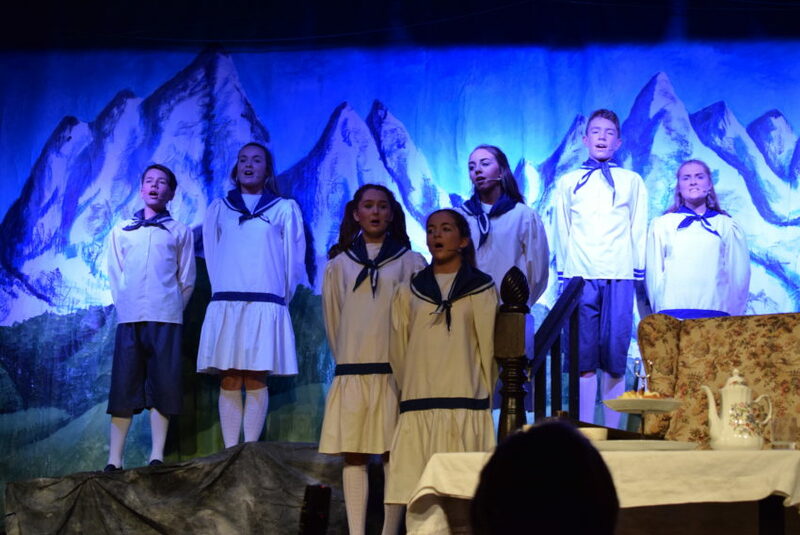 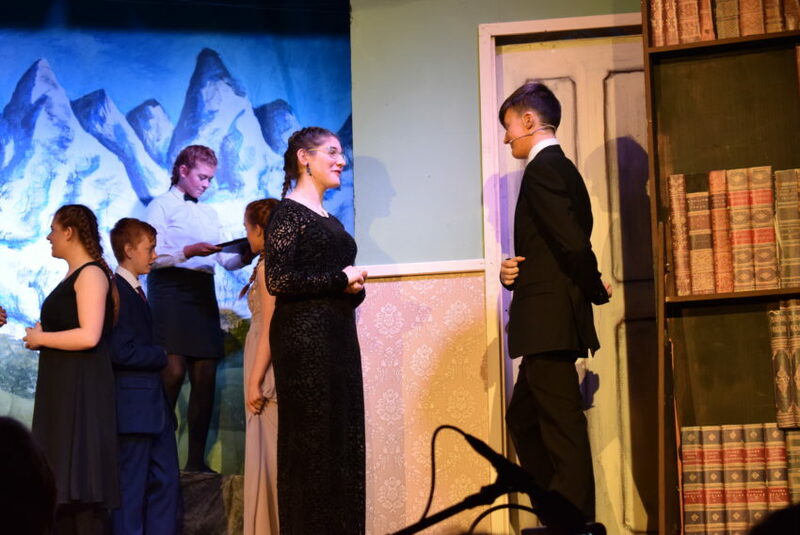 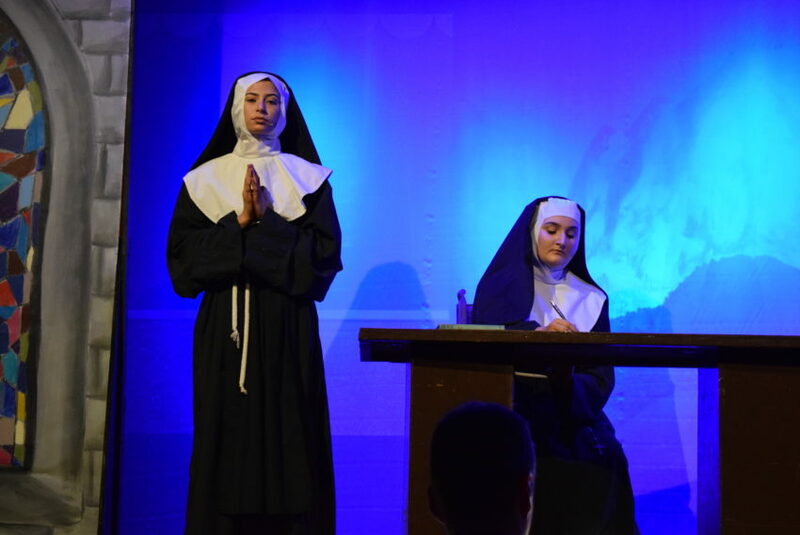 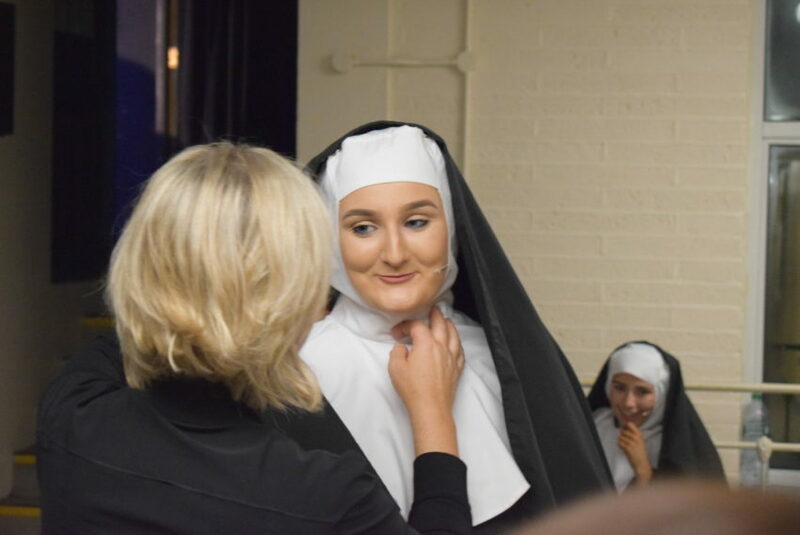 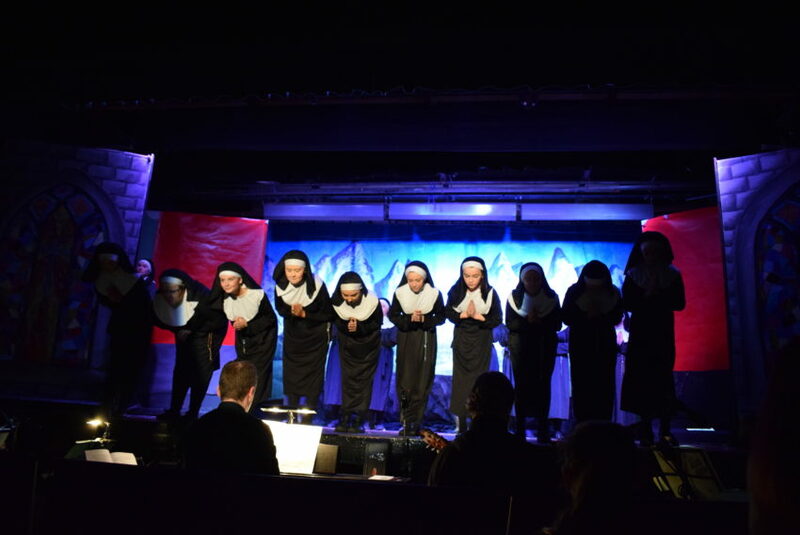 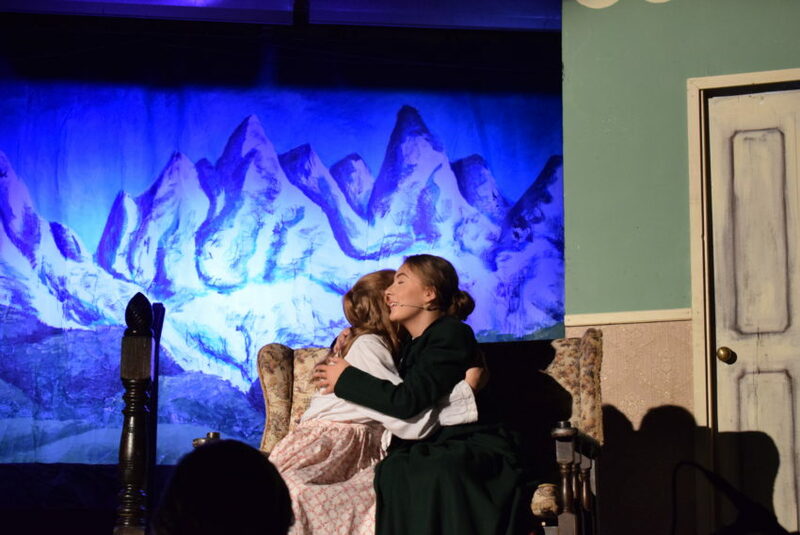 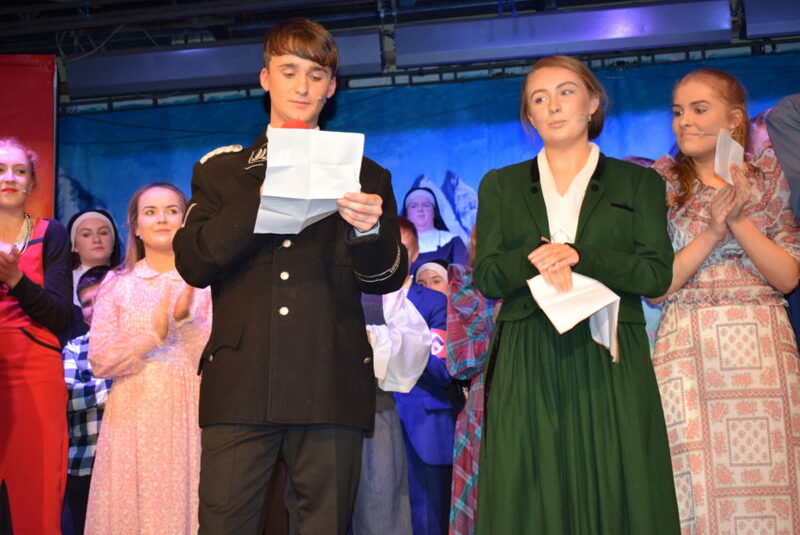 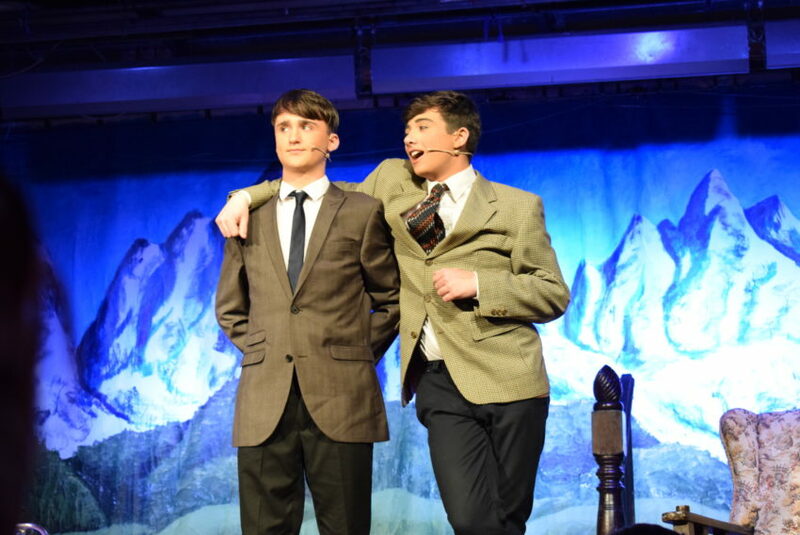 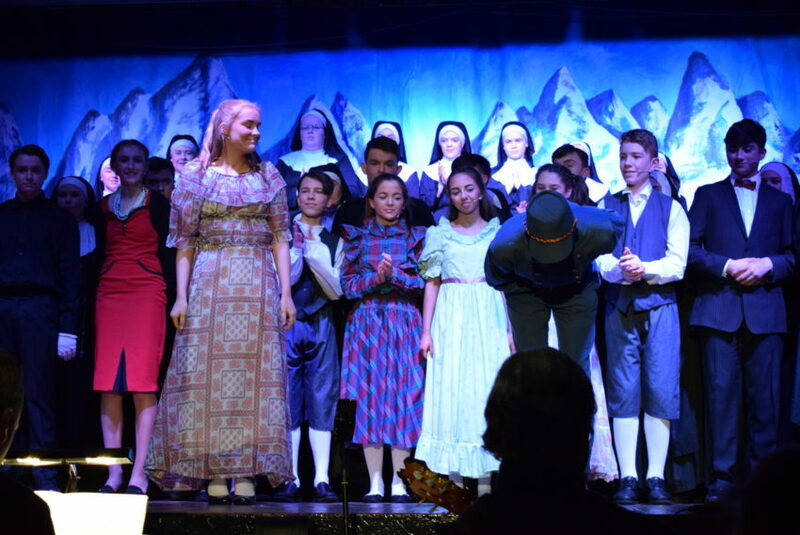 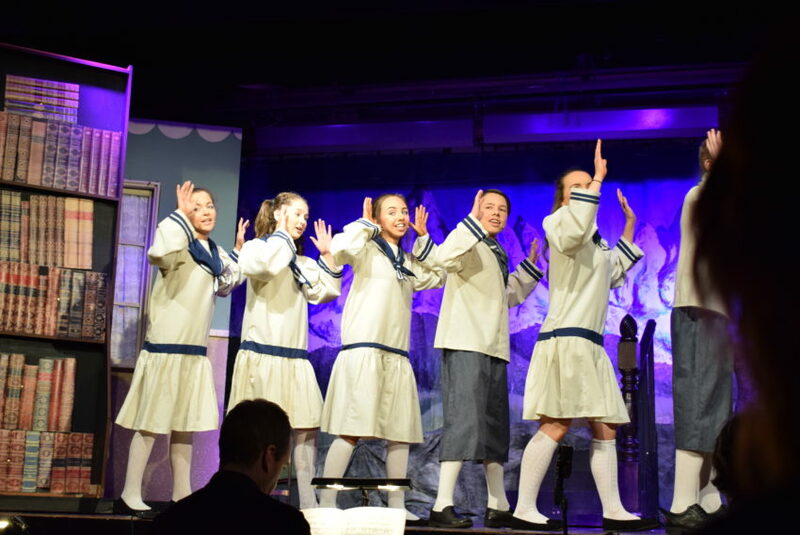 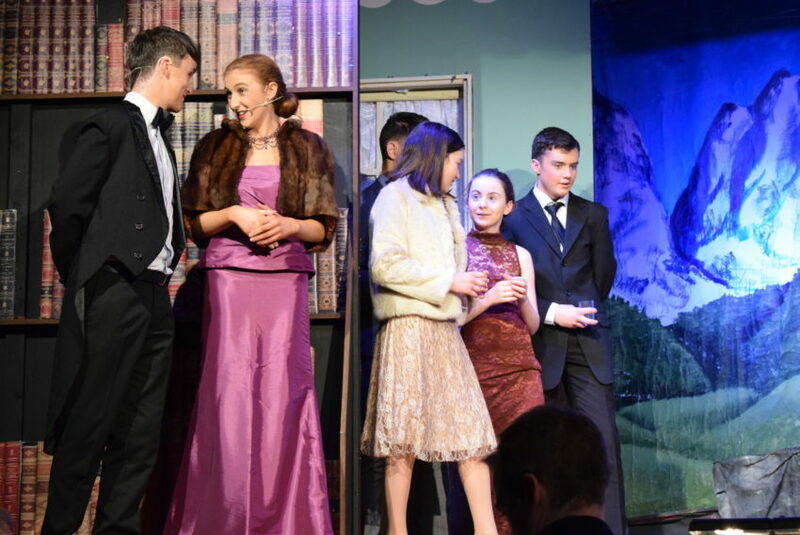 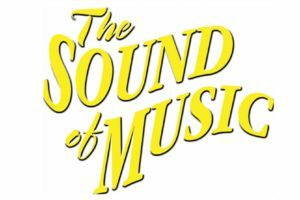 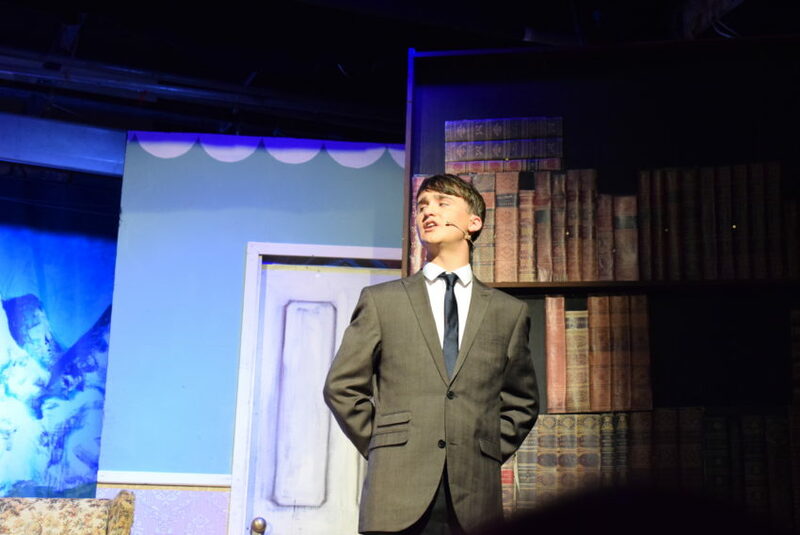 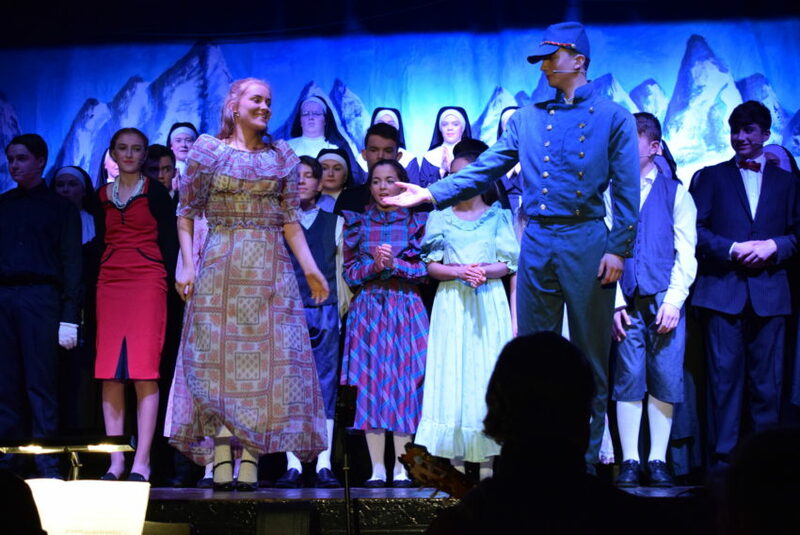 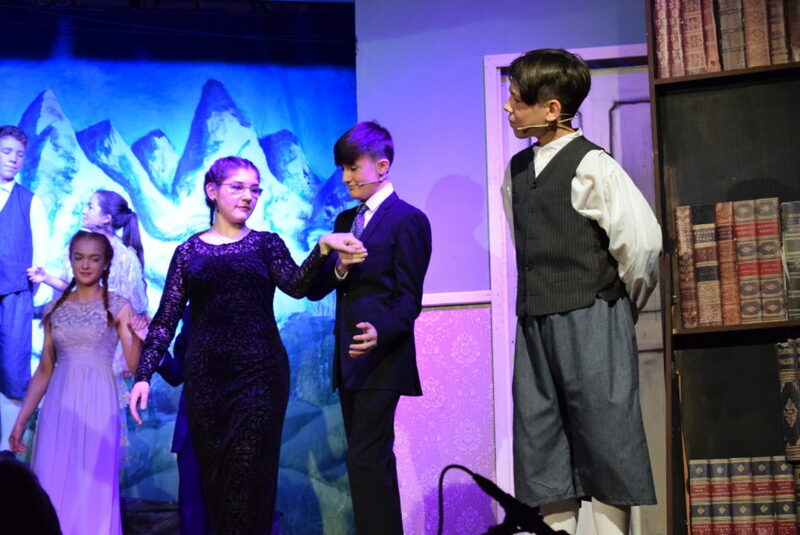 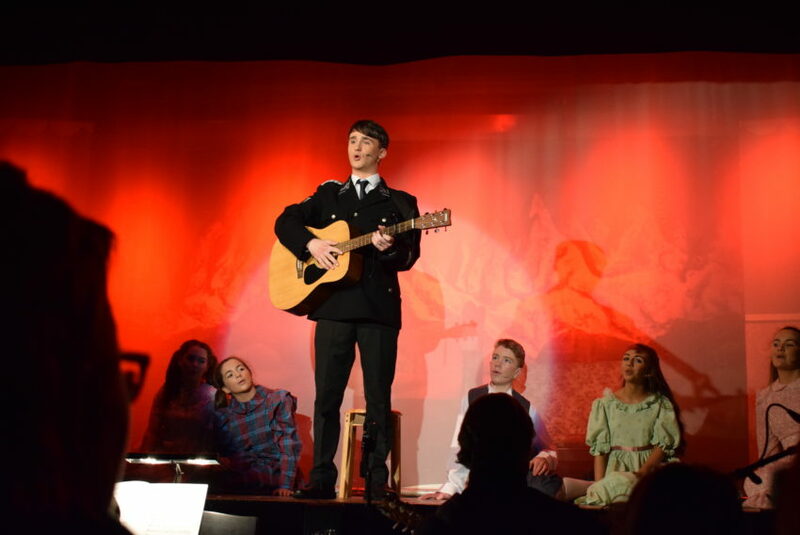 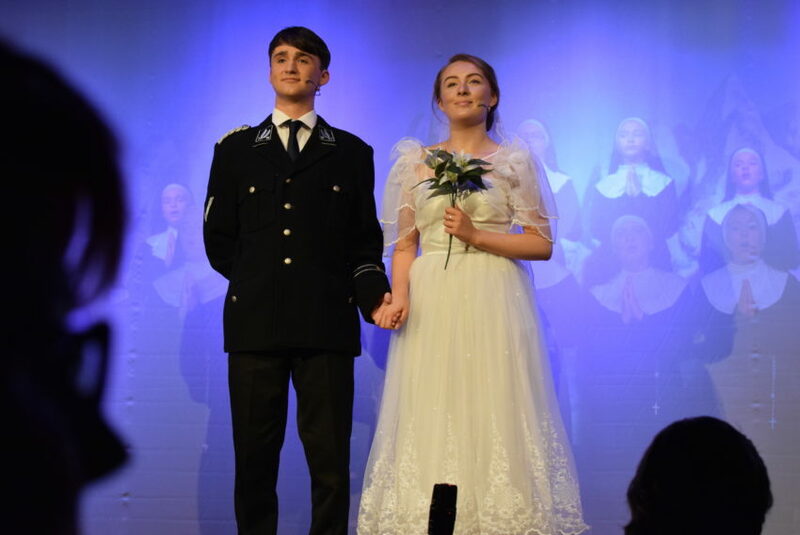 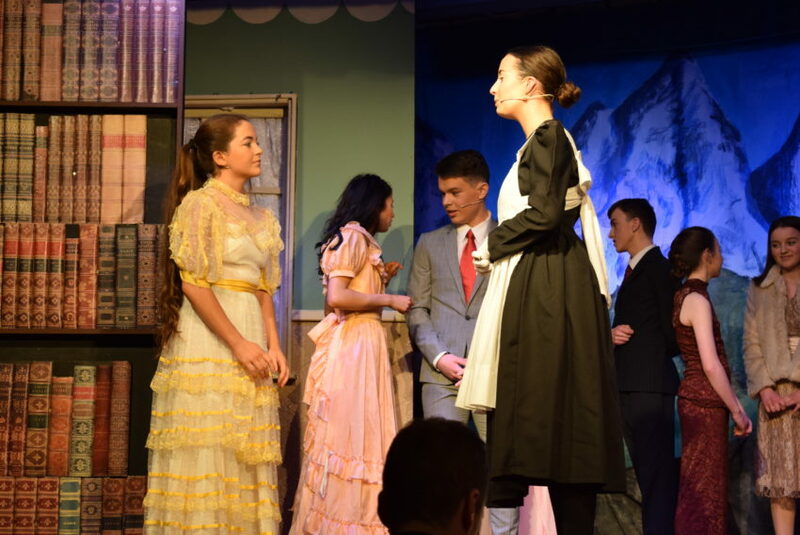 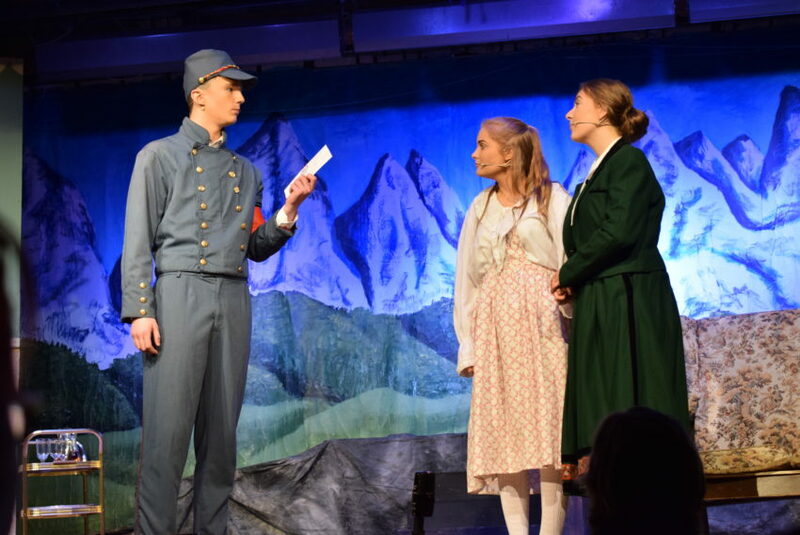 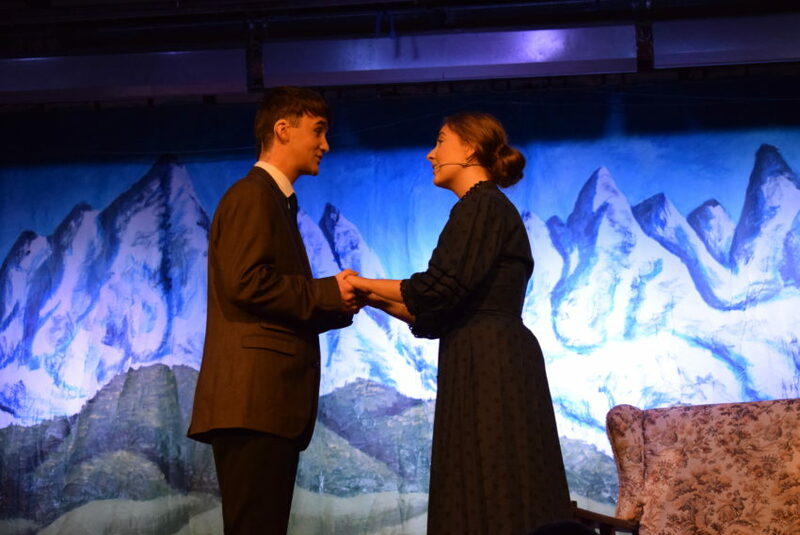 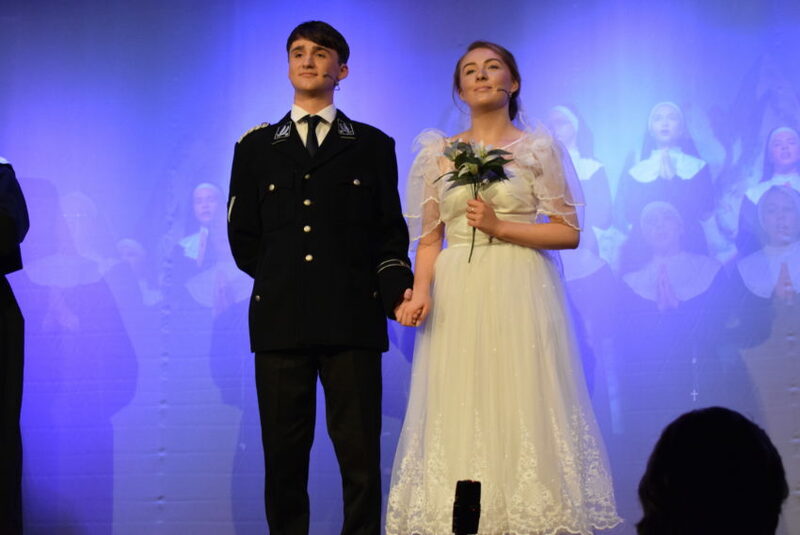 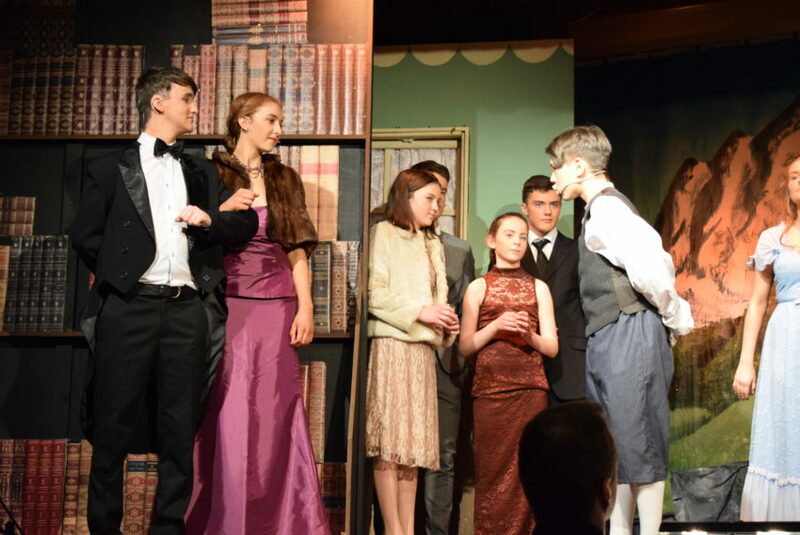 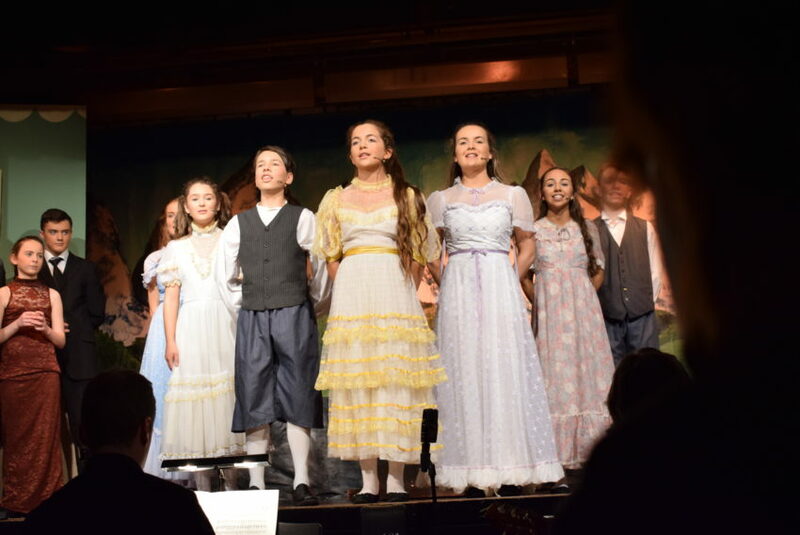 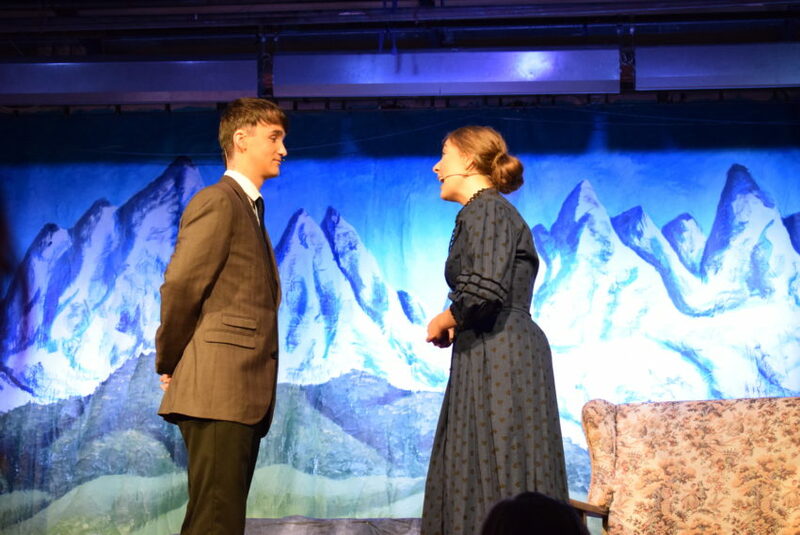 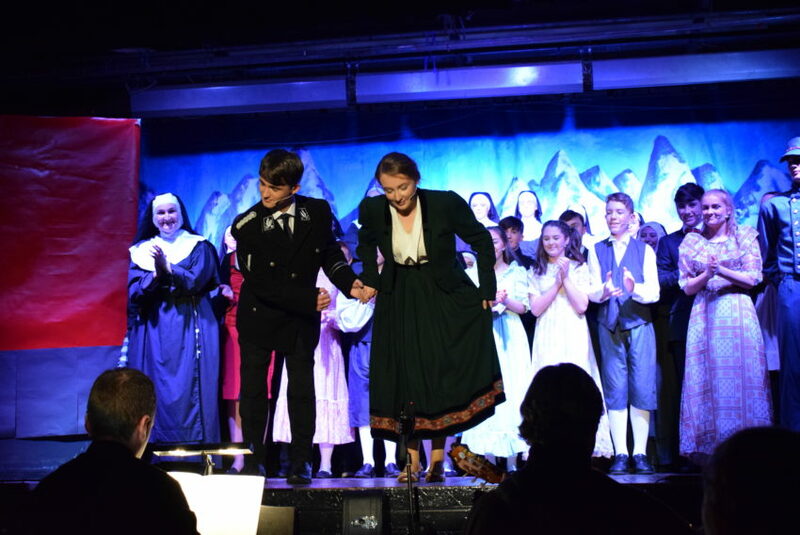 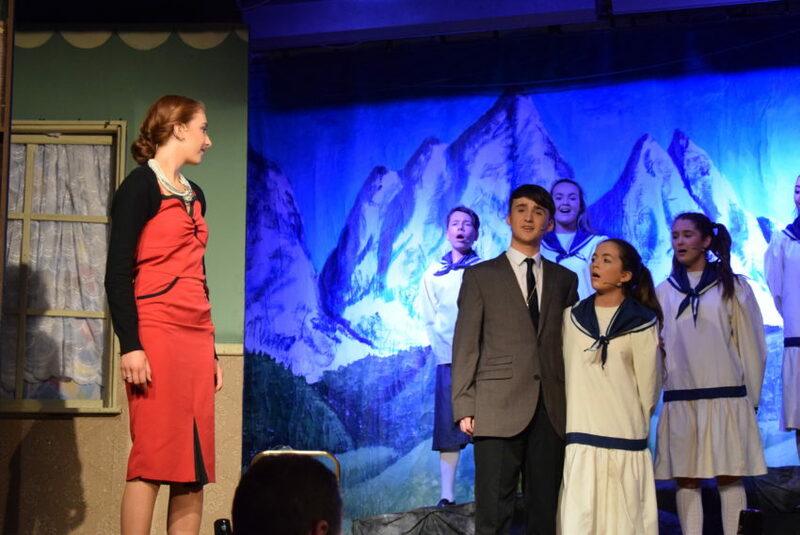 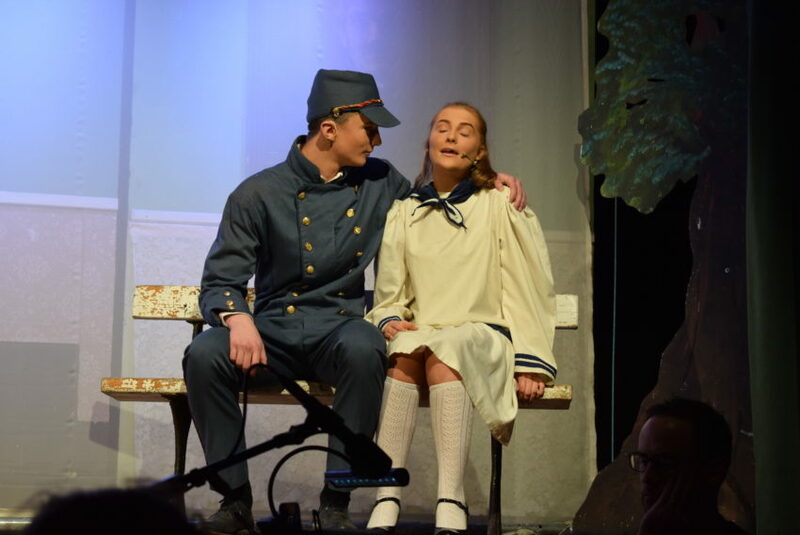 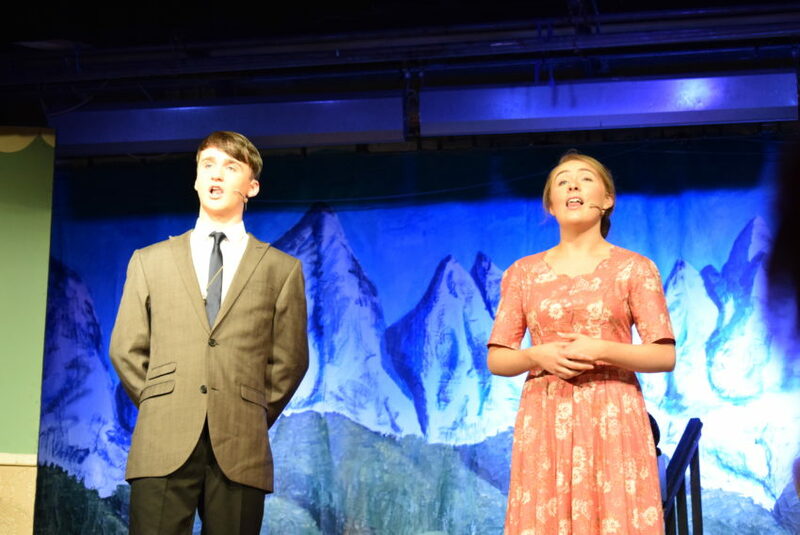 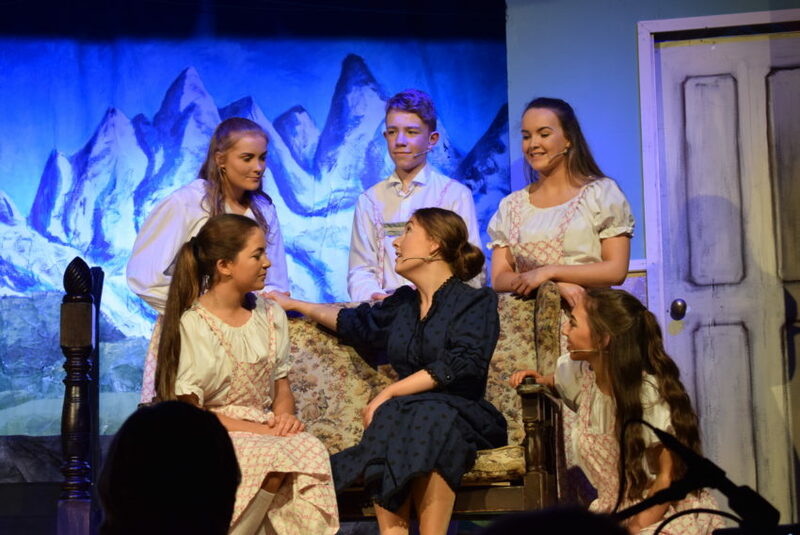 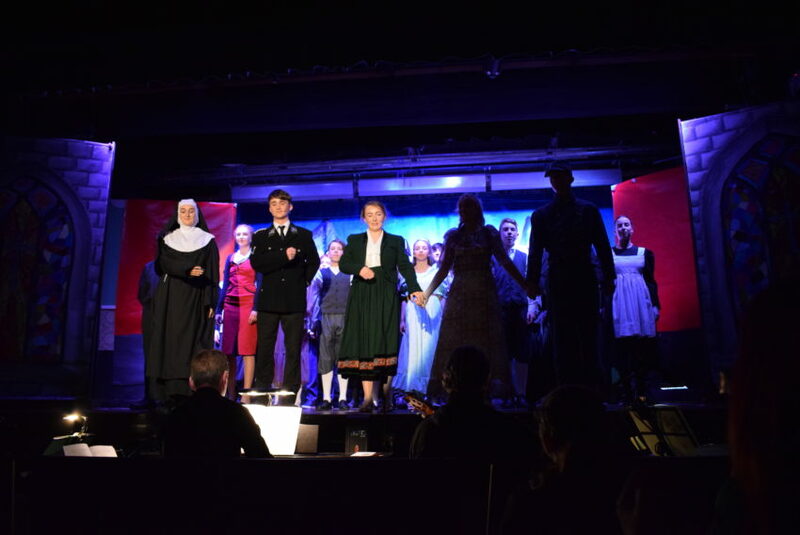 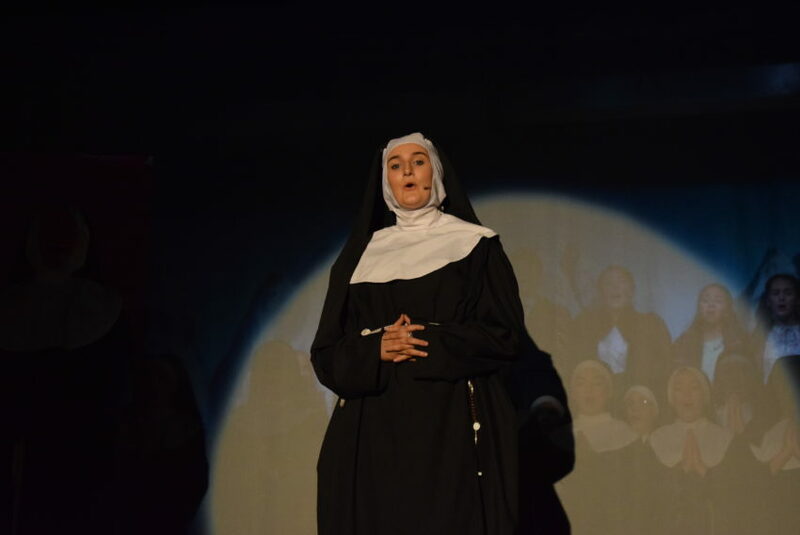 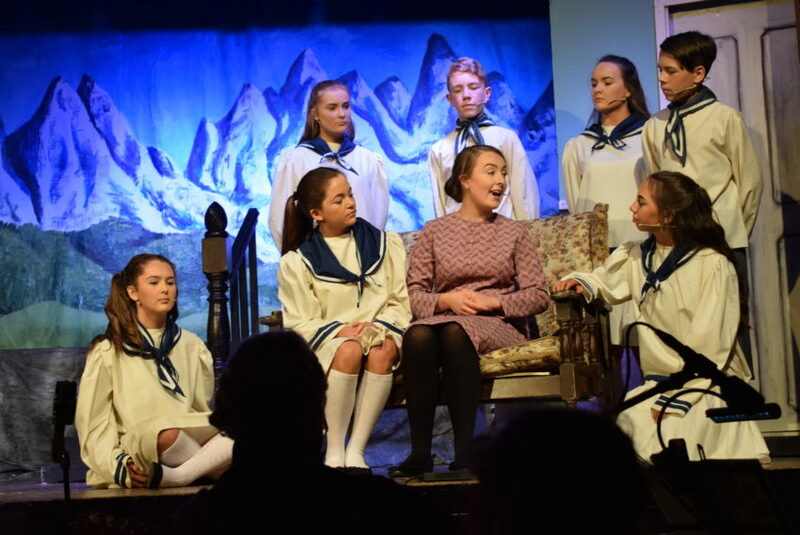 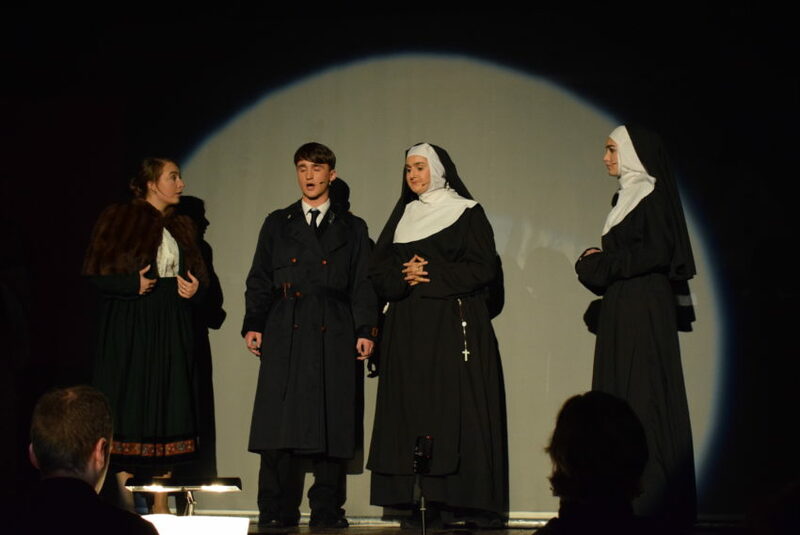 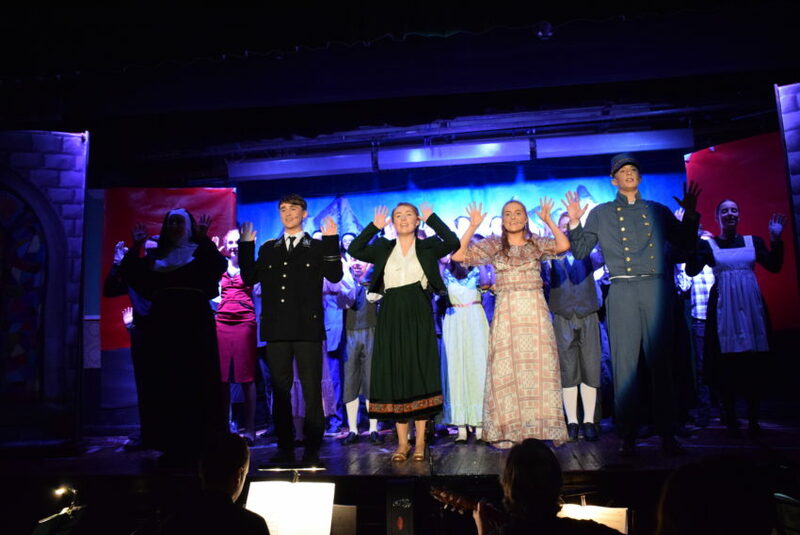 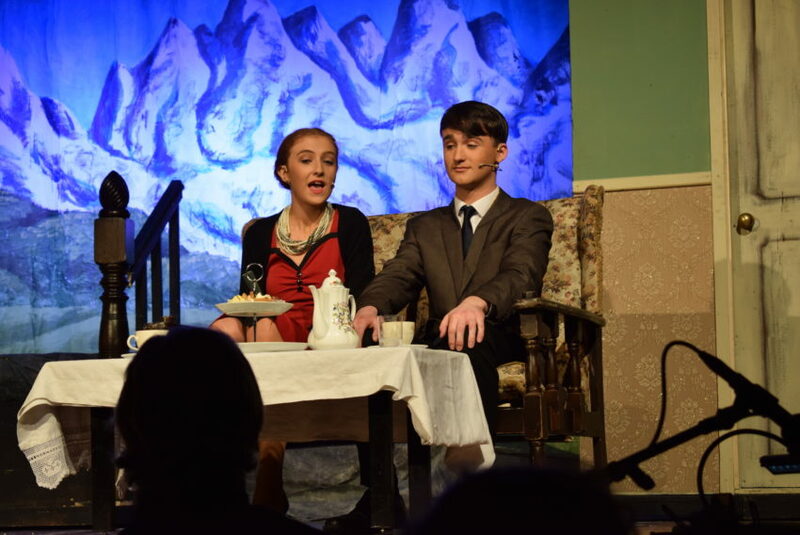 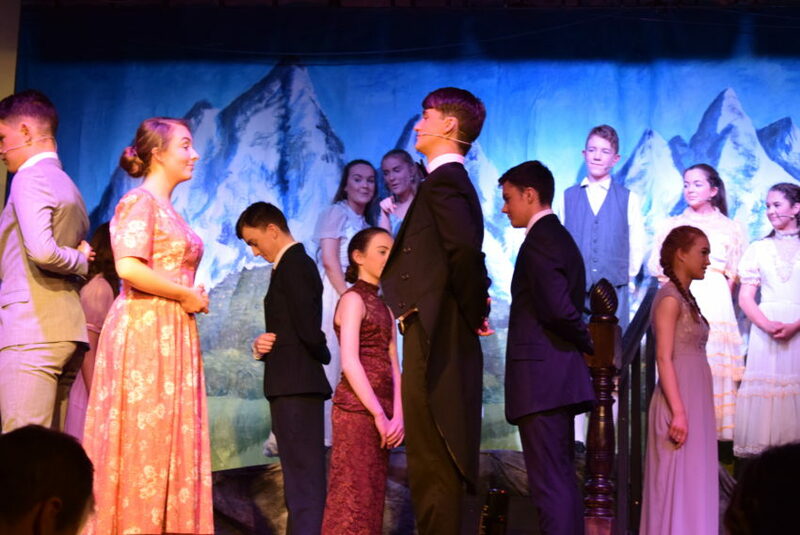 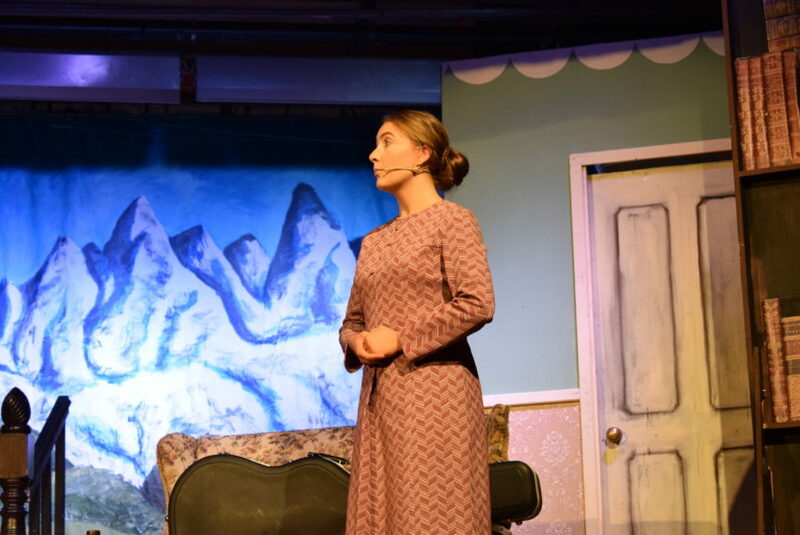 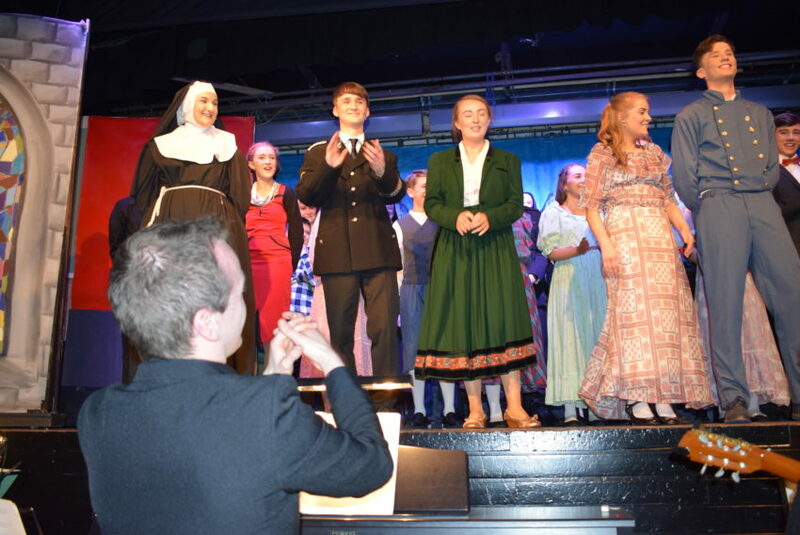 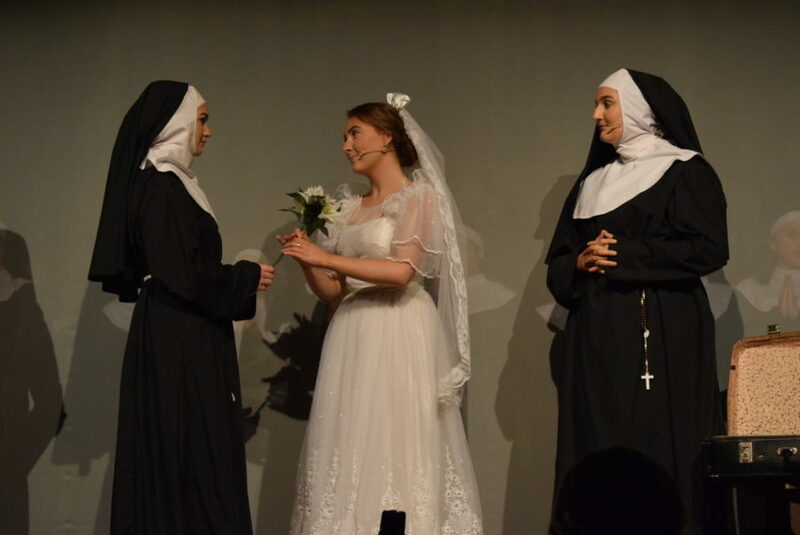 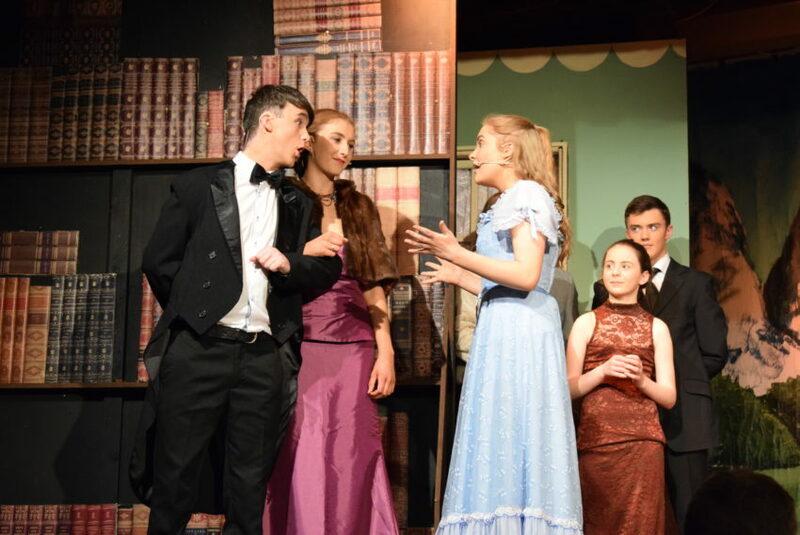 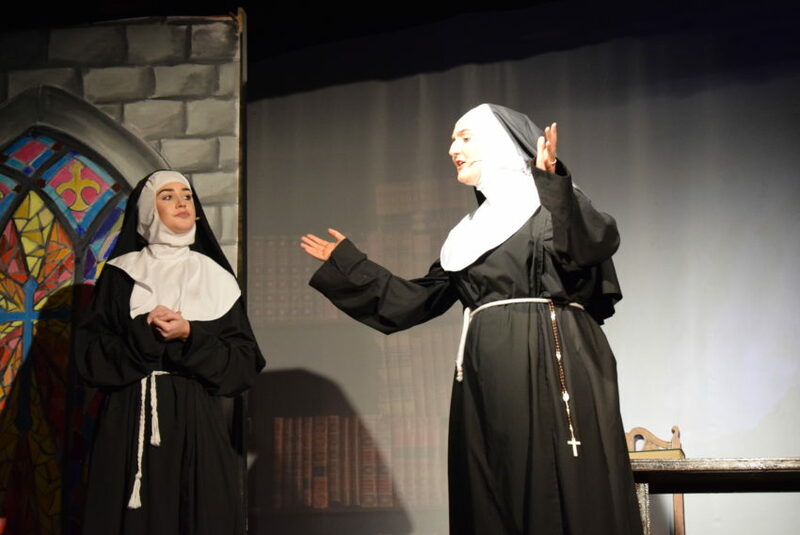 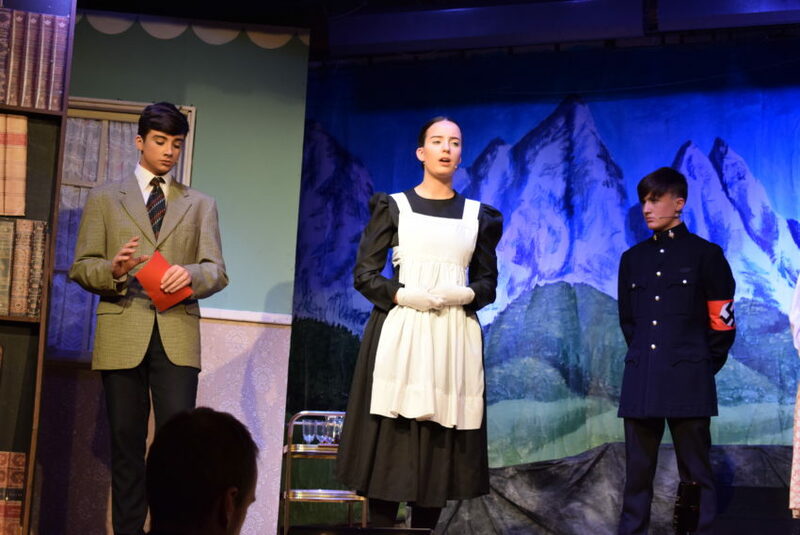 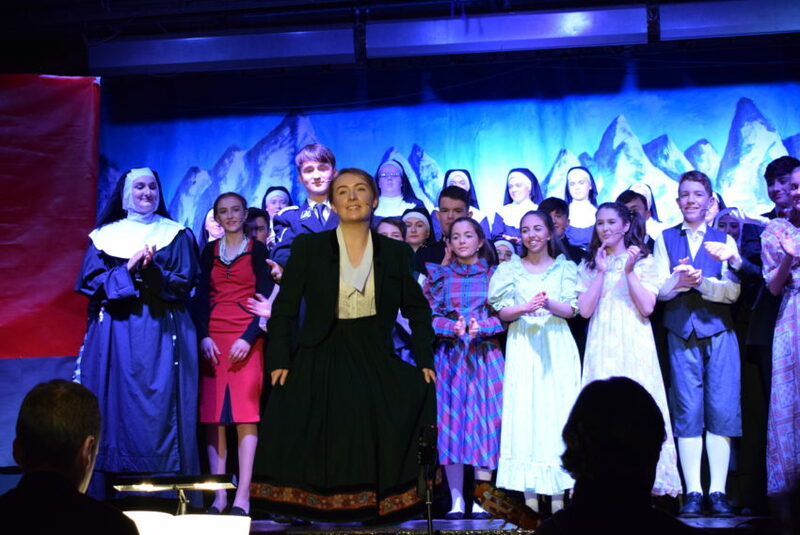 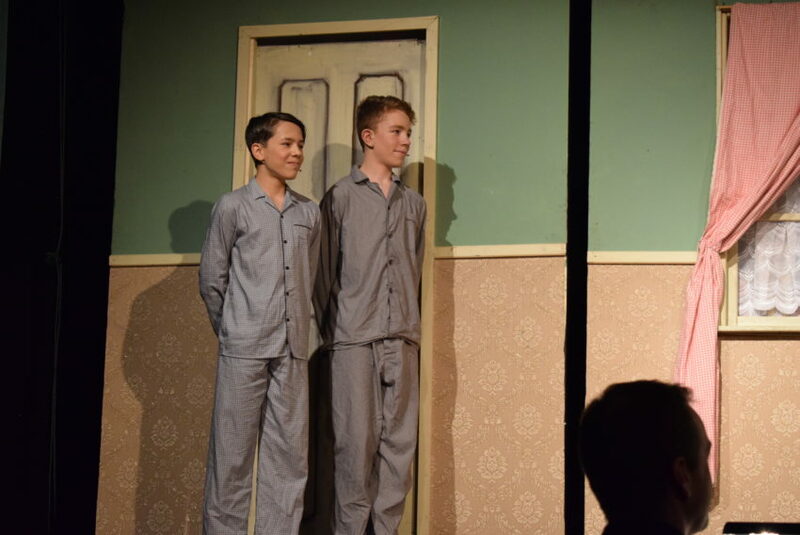 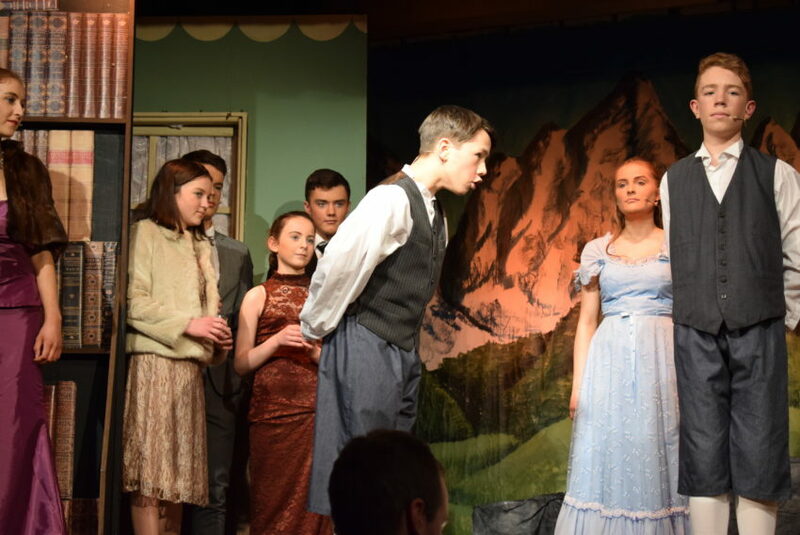 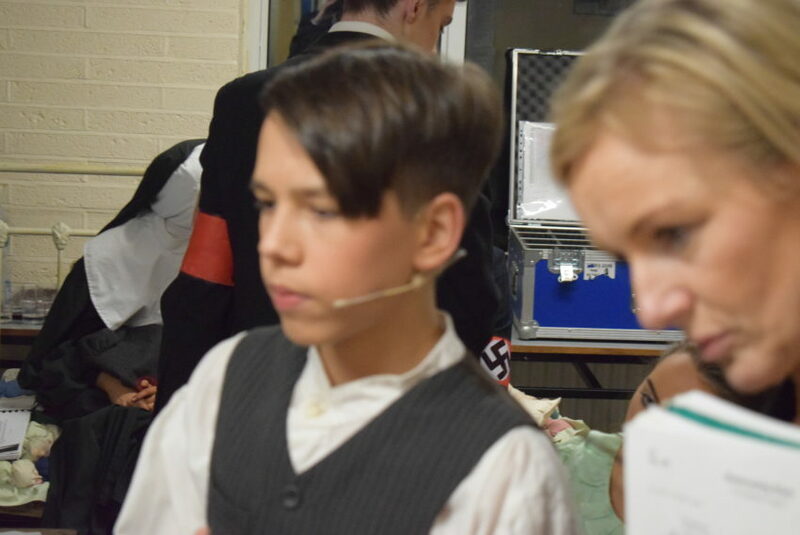 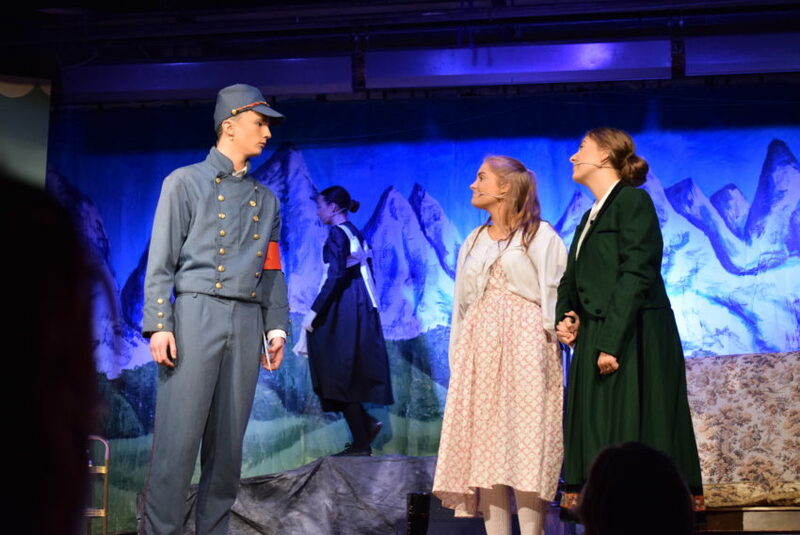 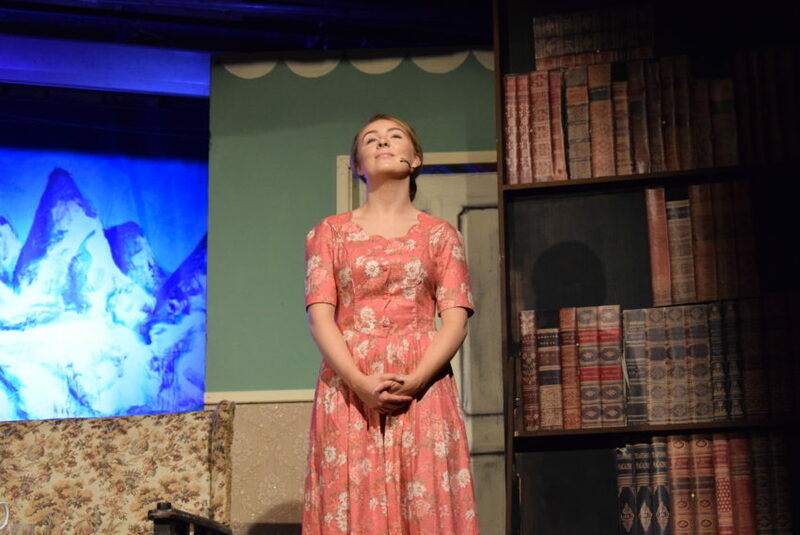 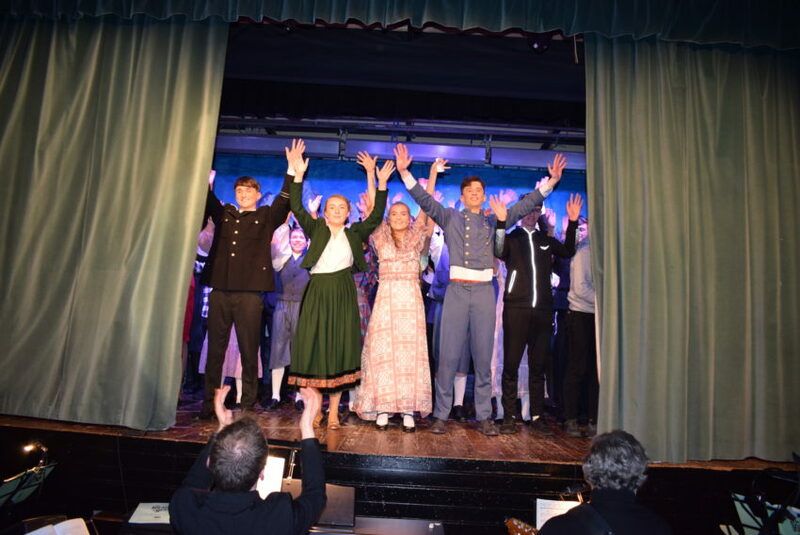 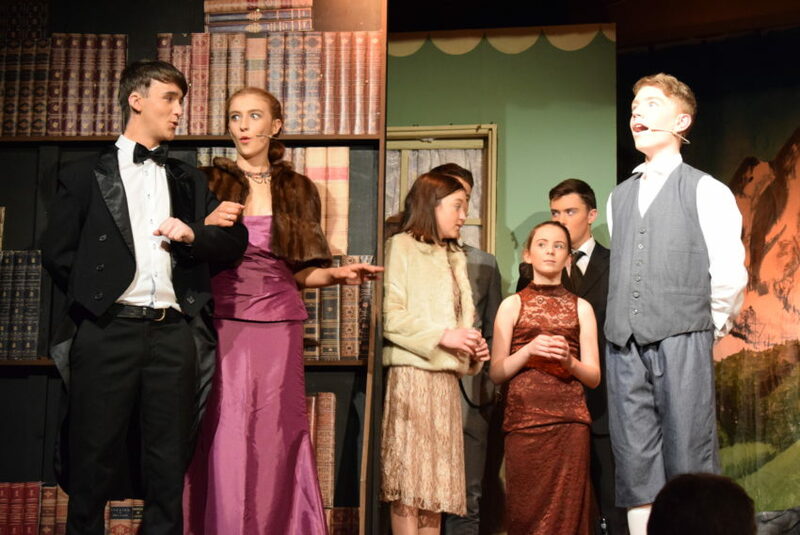 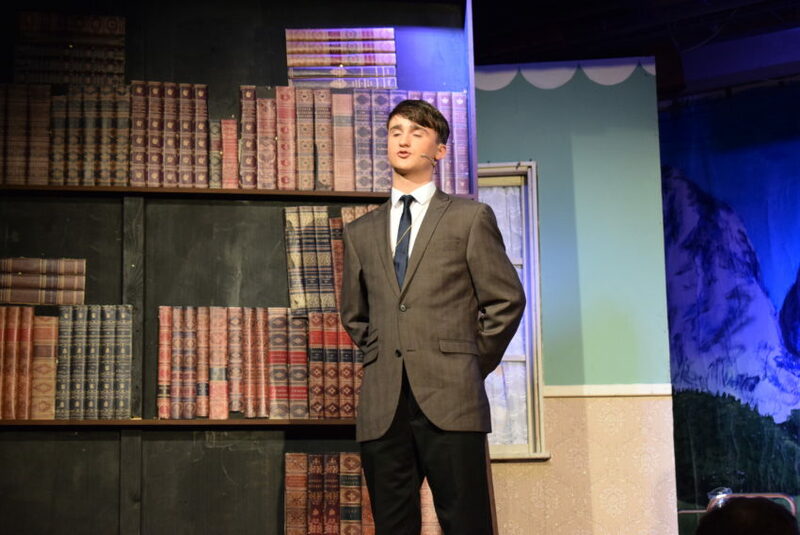 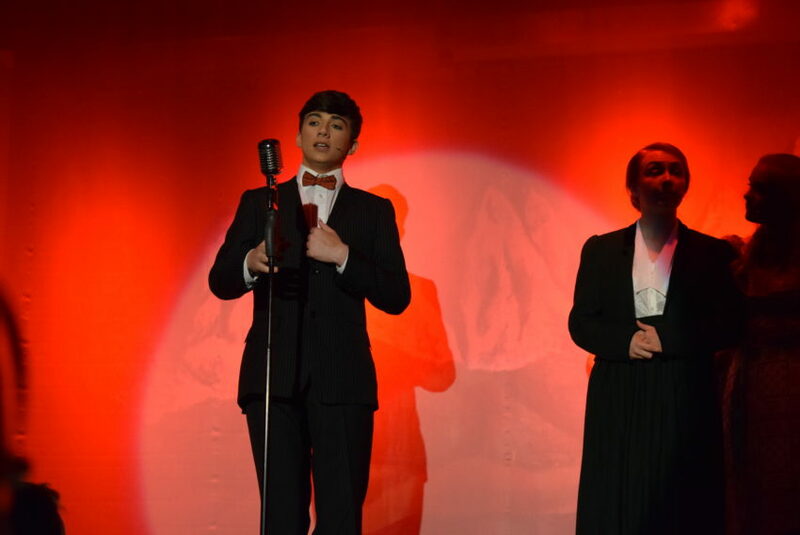 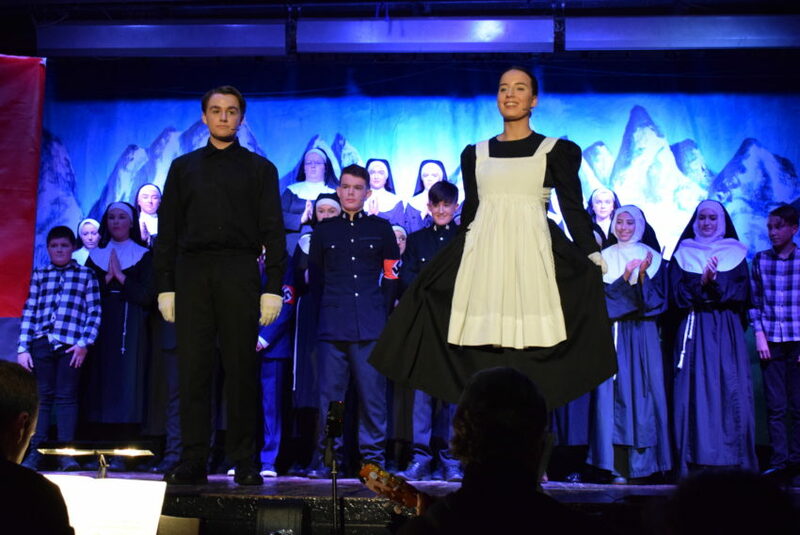 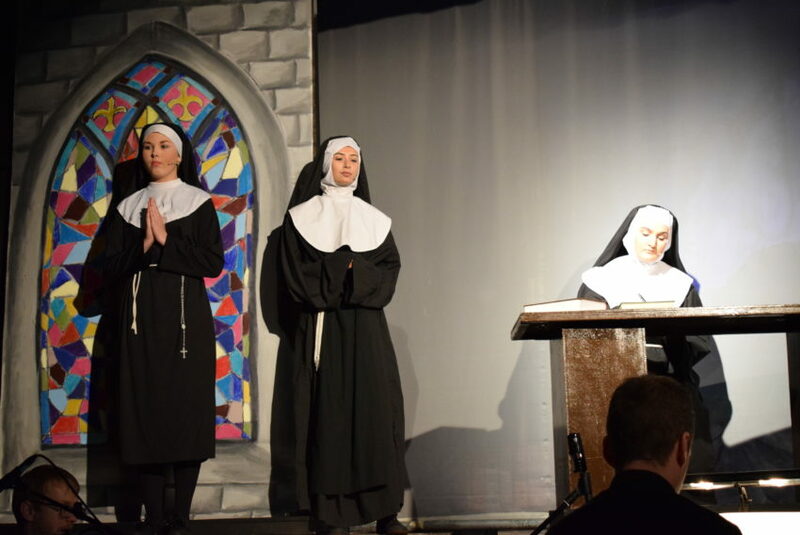 Well done to all involved in our fantastic production… The Sound of Music. 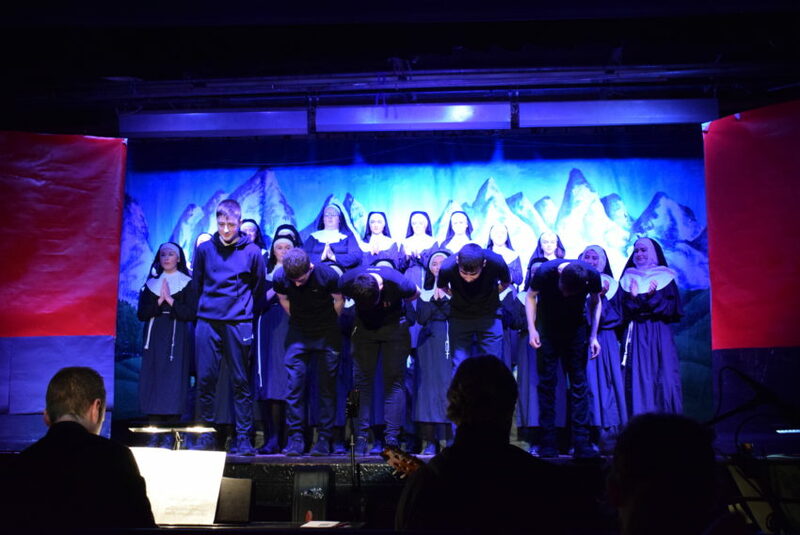 After weeks of practice, it’s had to believe that our 4 shows are over. 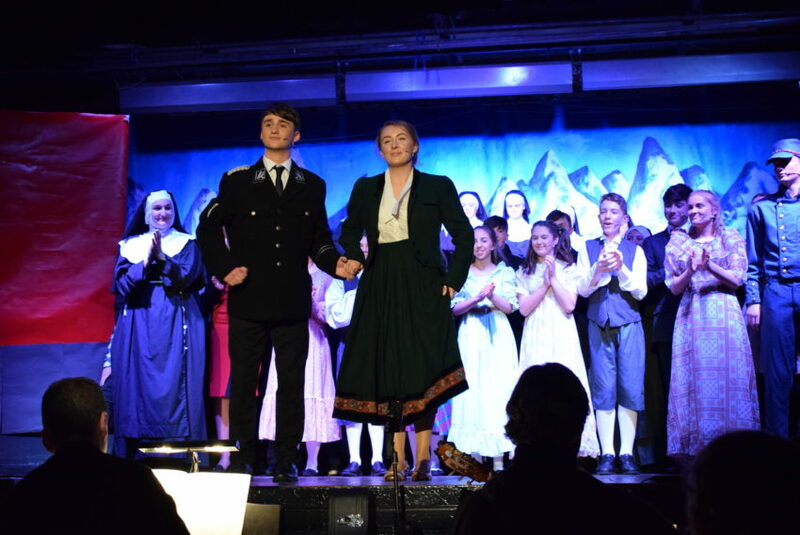 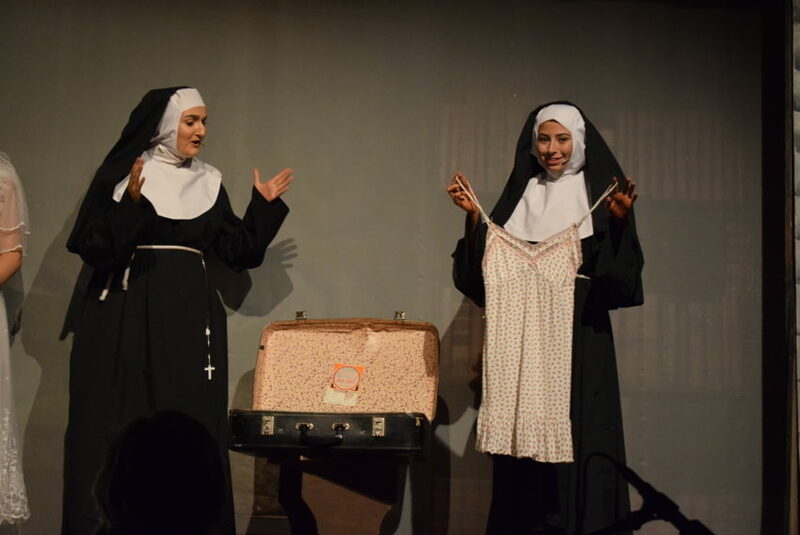 We want to congratulate our fantastic students on this wonderful production. 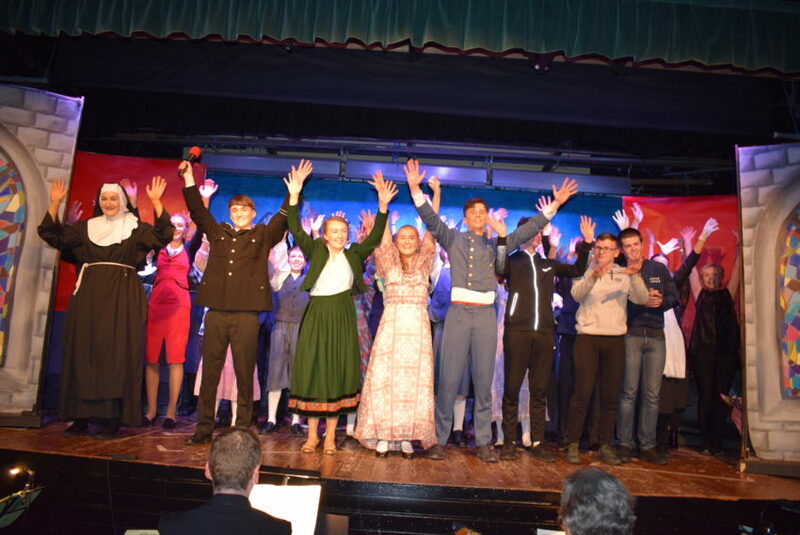 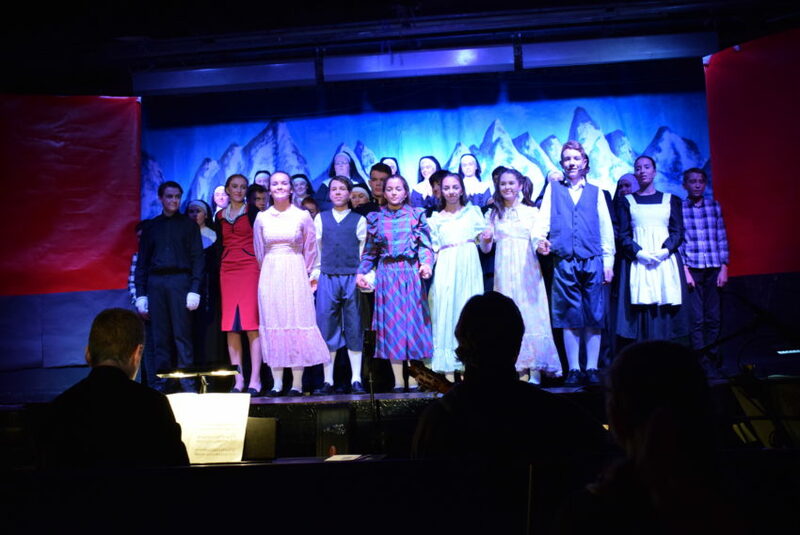 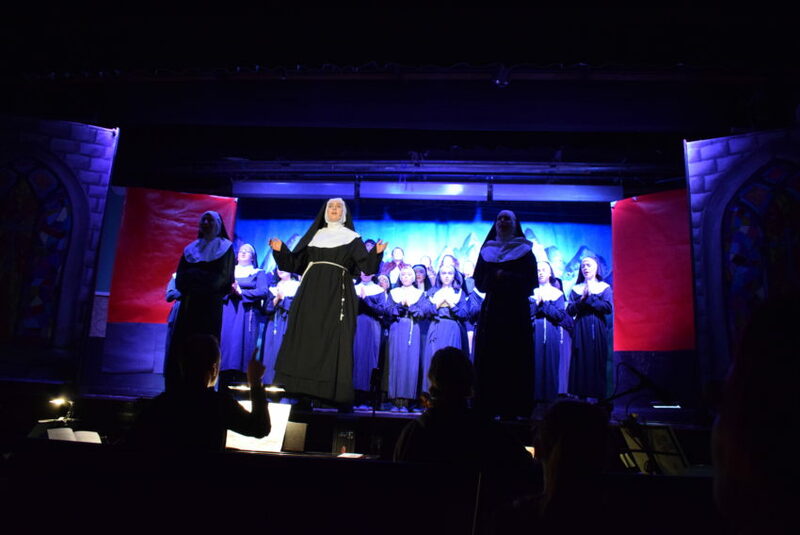 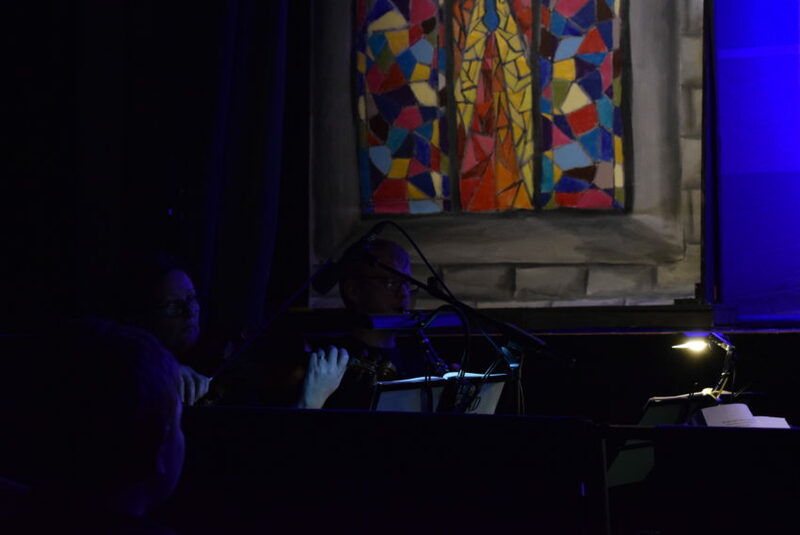 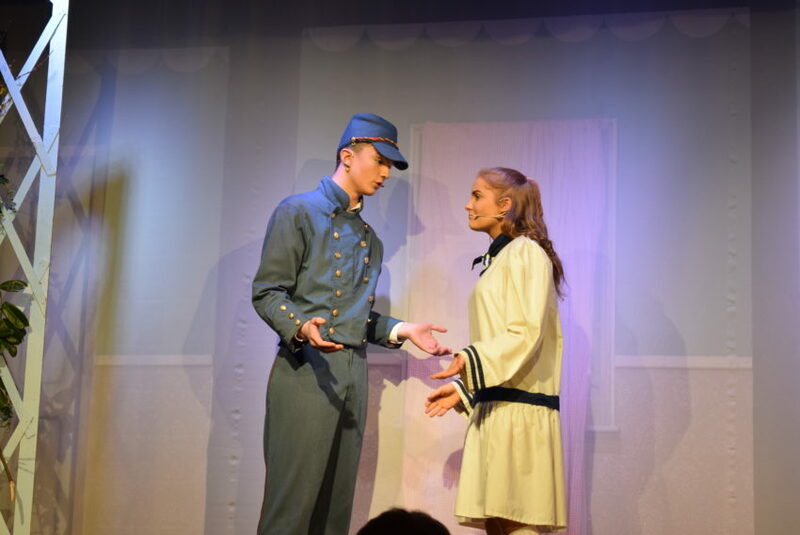 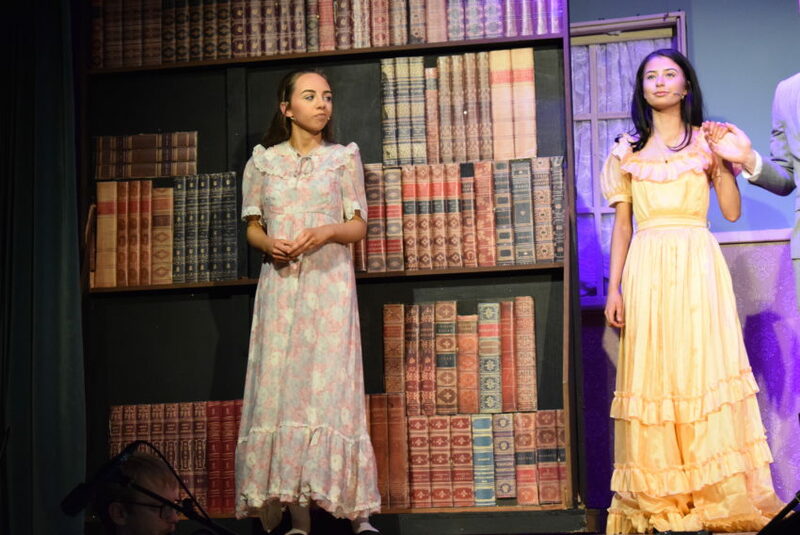 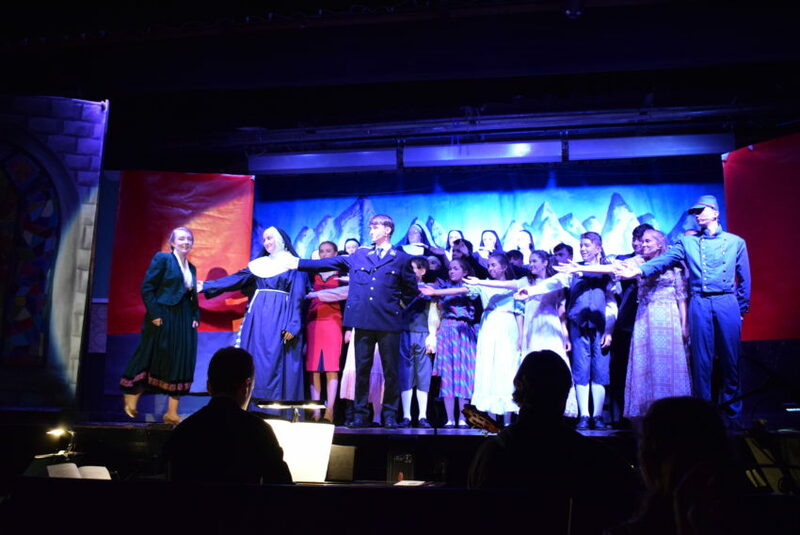 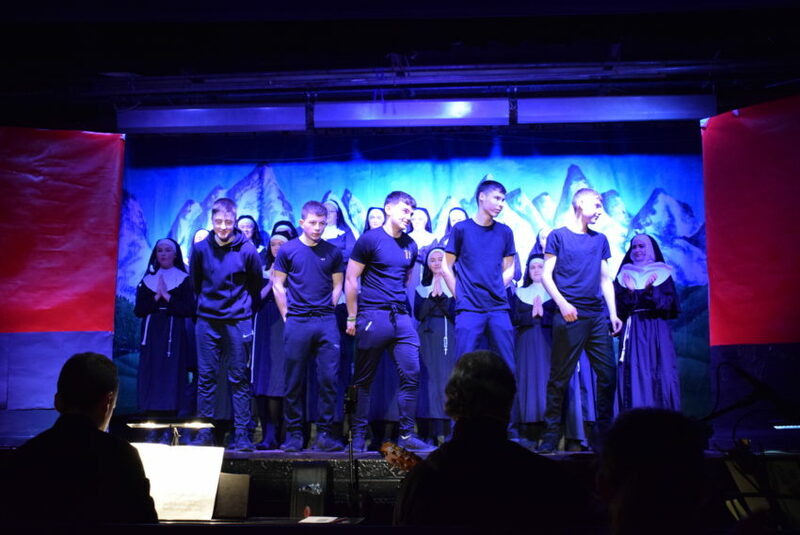 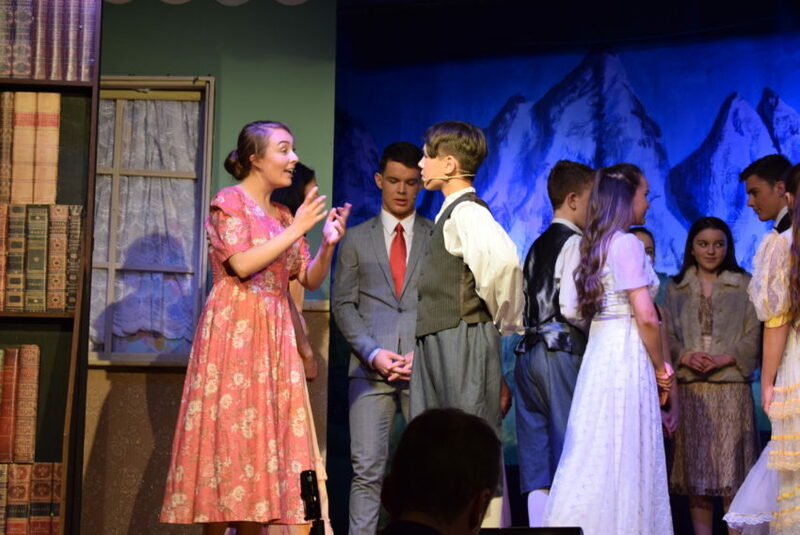 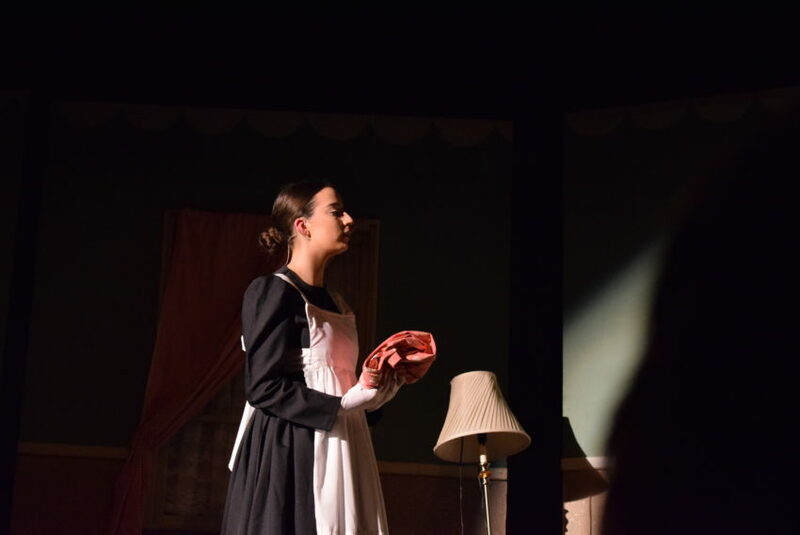 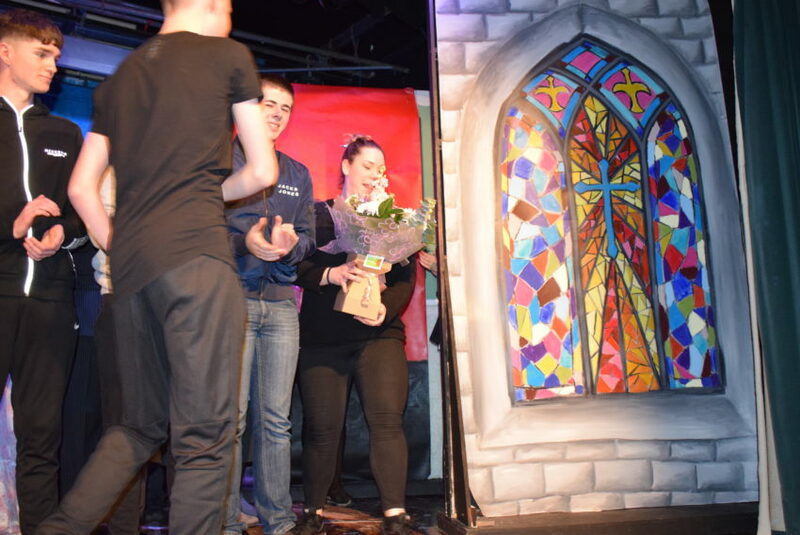 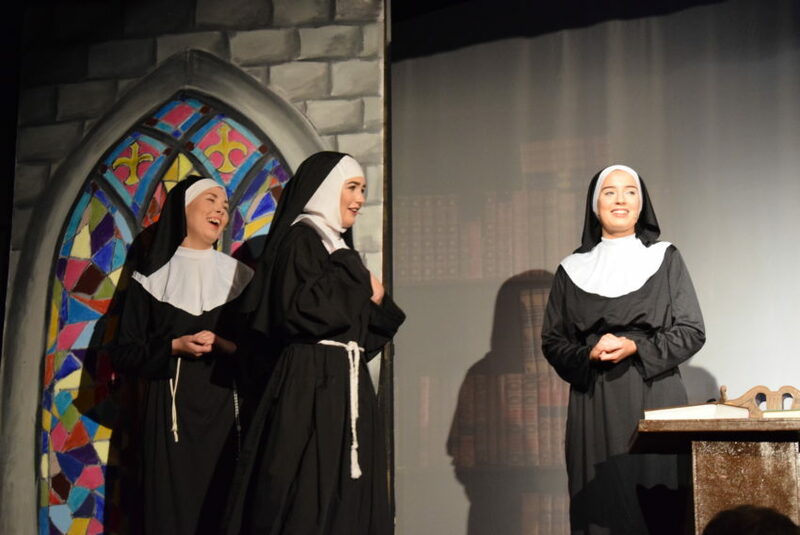 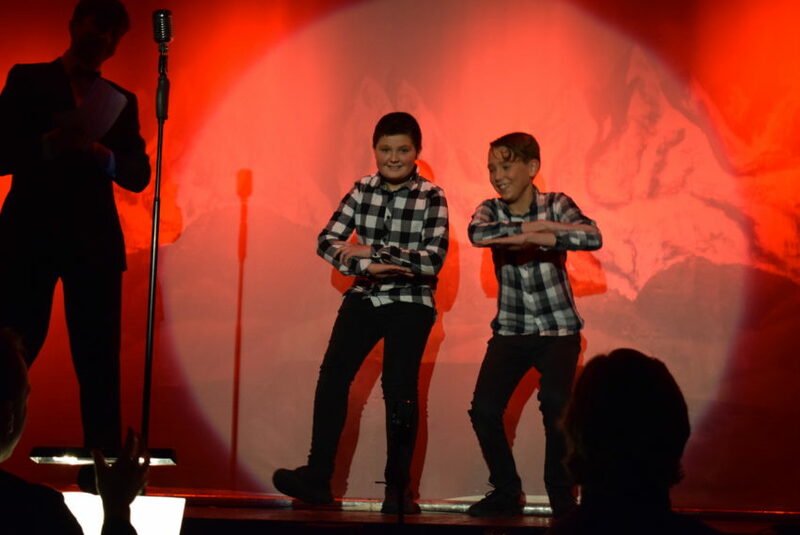 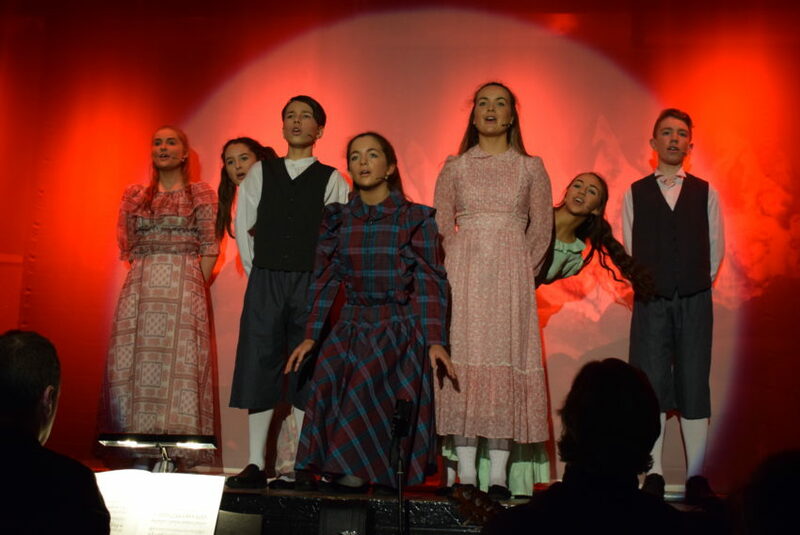 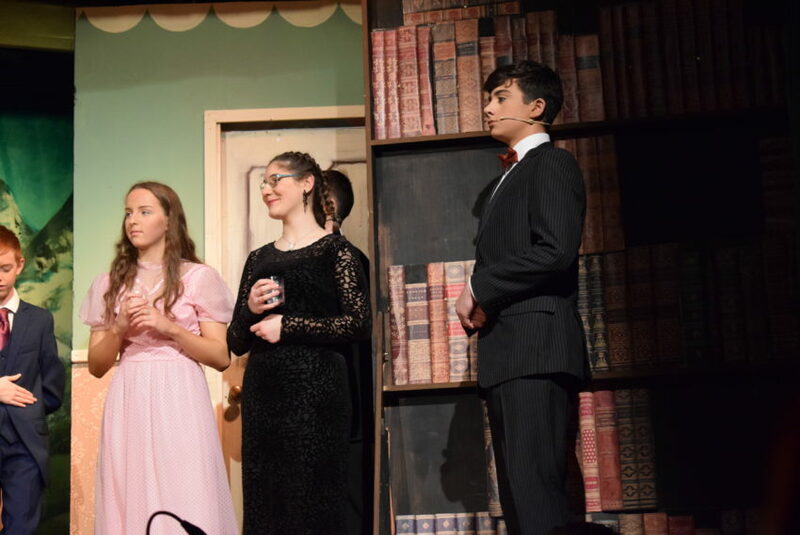 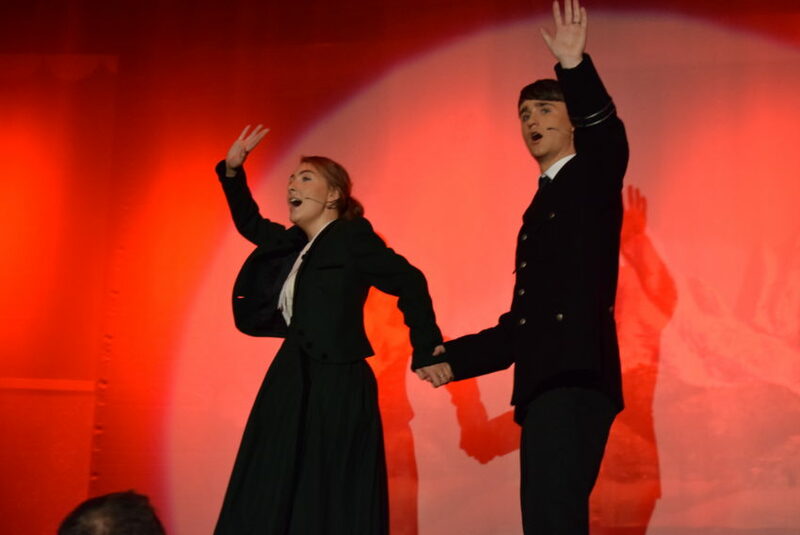 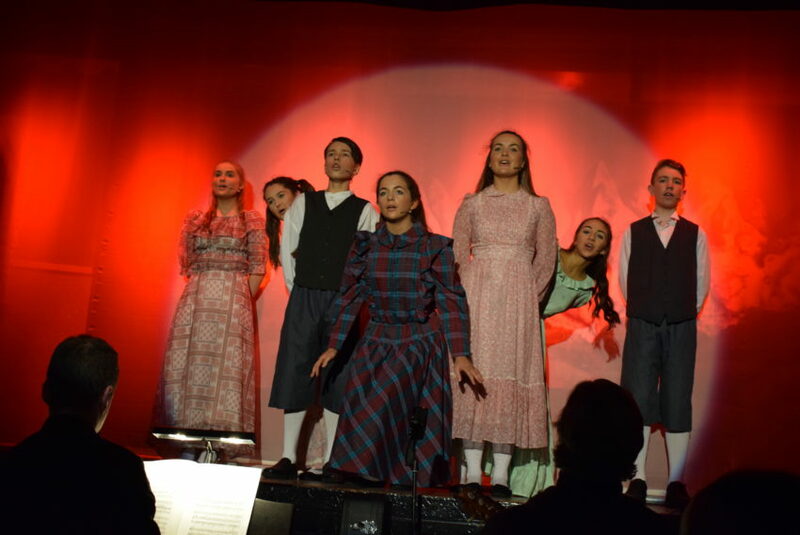 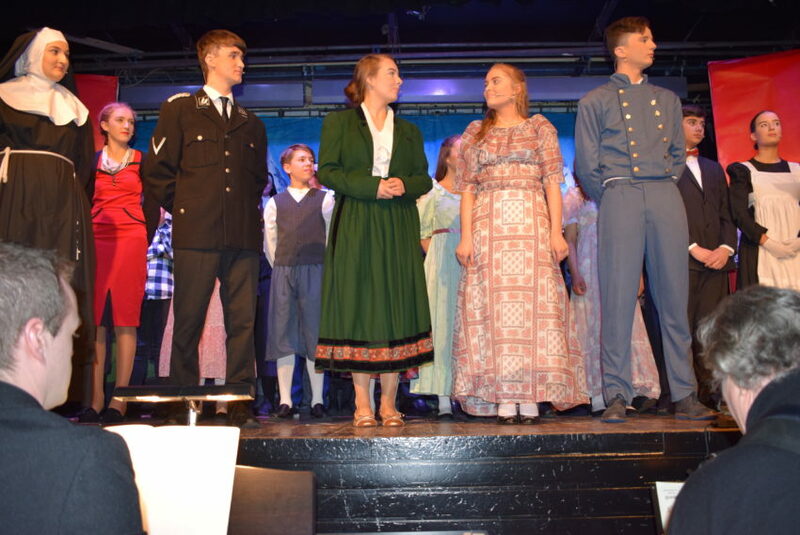 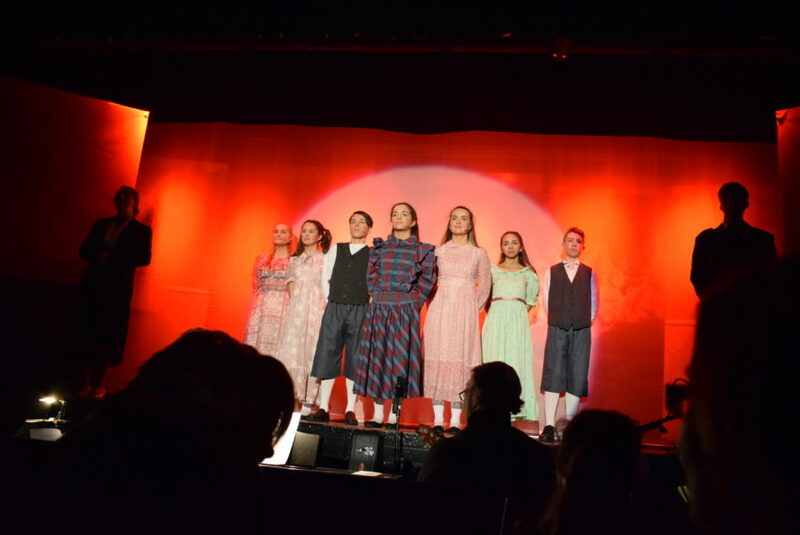 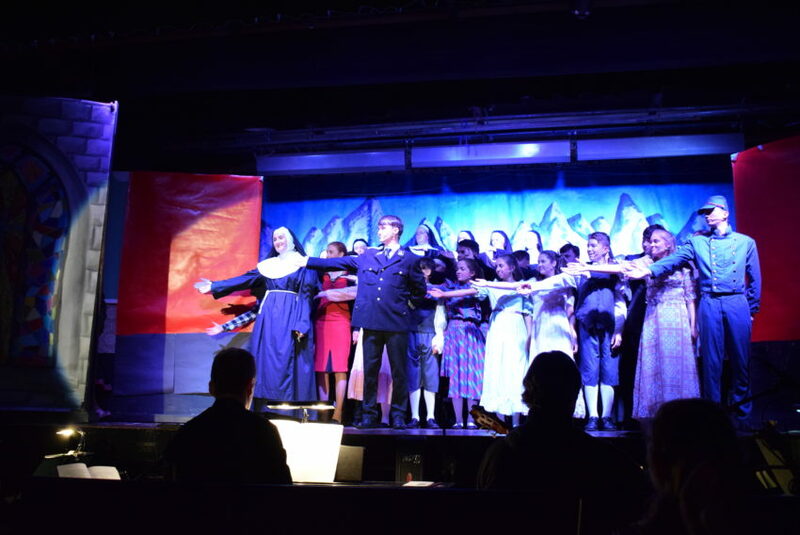 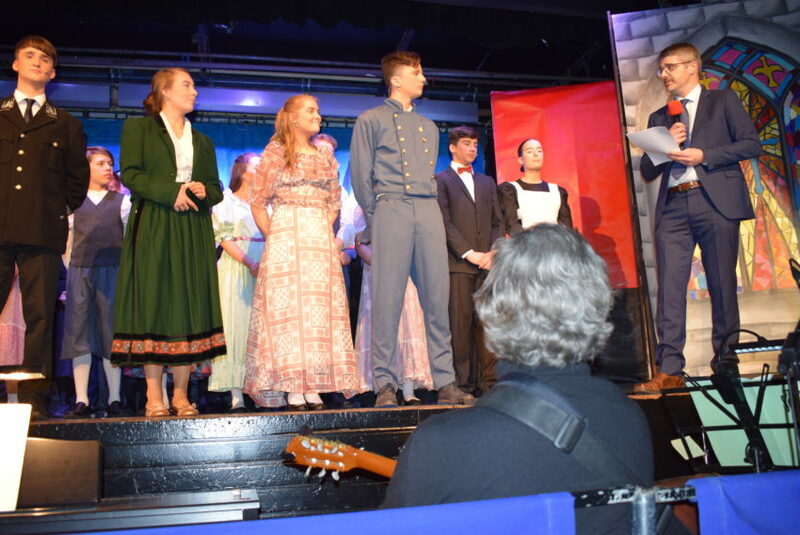 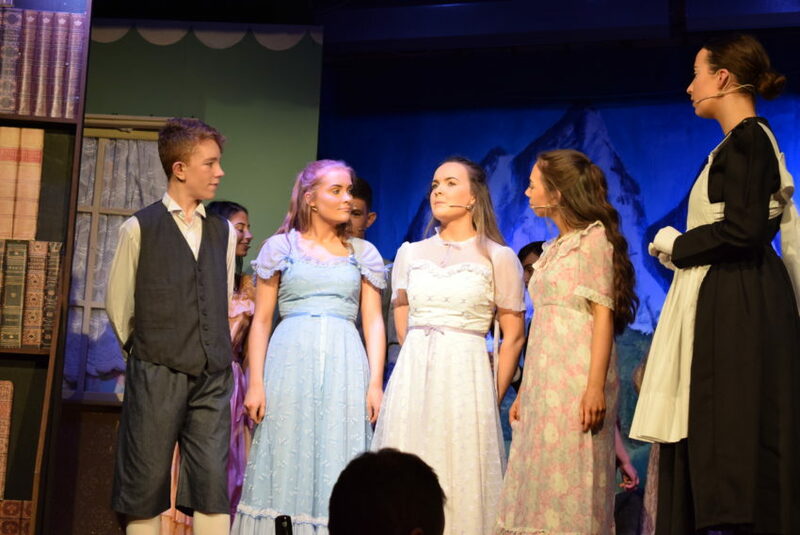 All of their time, hard work and dedication over the past few weeks have certainly paid off and made this musical the huge success that it was. 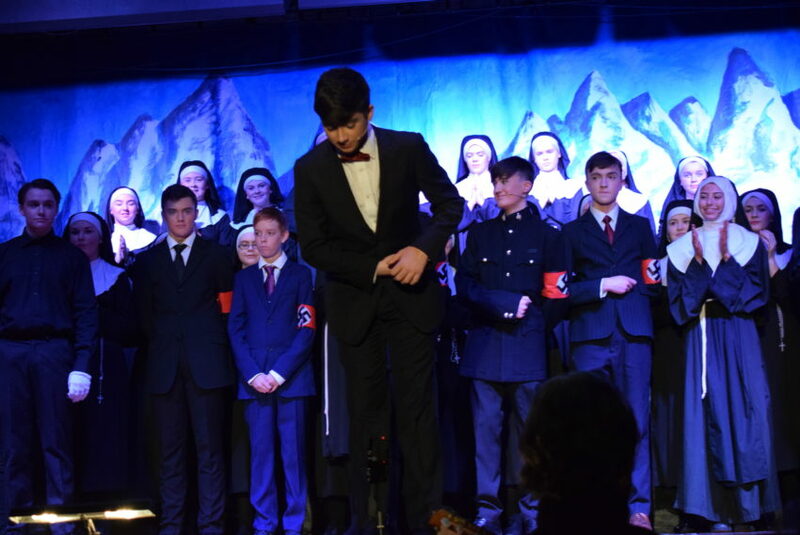 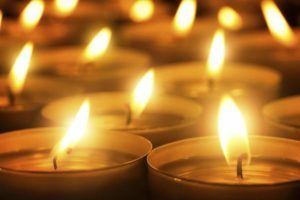 I have no doubt you will look back on these past few weeks as some of your best memories from secondary school in years to come. 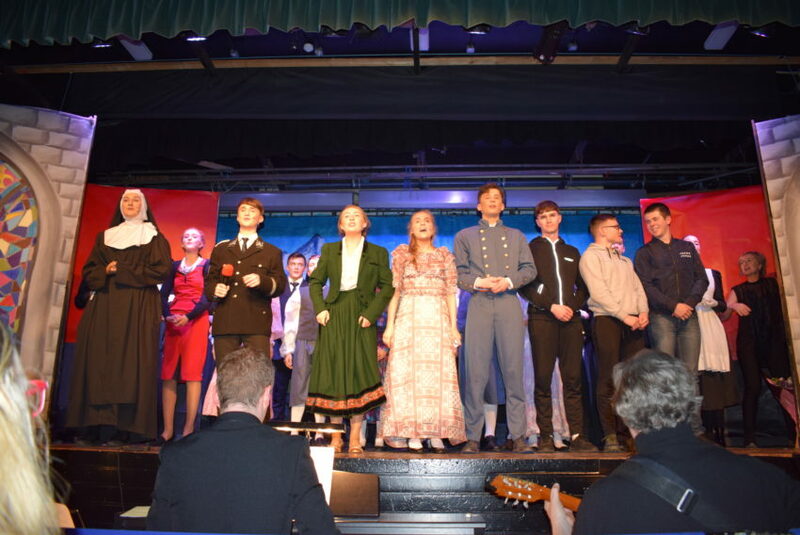 Well done to you all, you should all be very proud of yourselves! 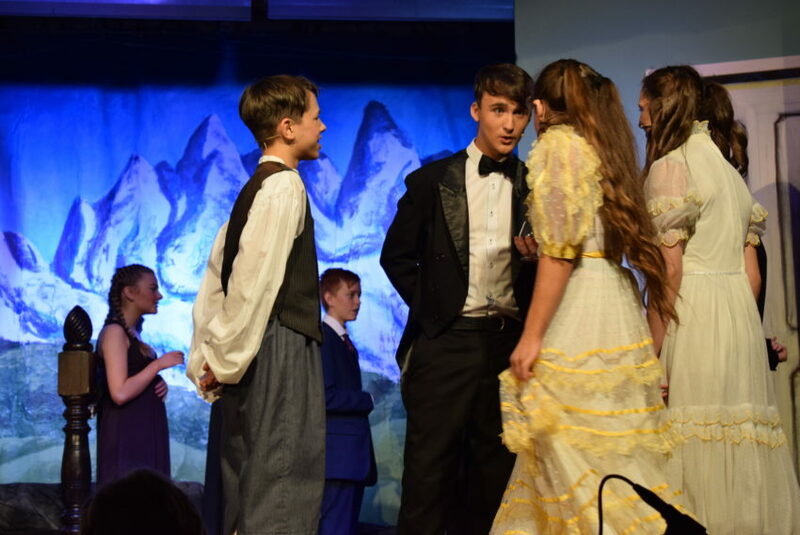 Our 2019 Prospectus is now available online and can be viewed here. 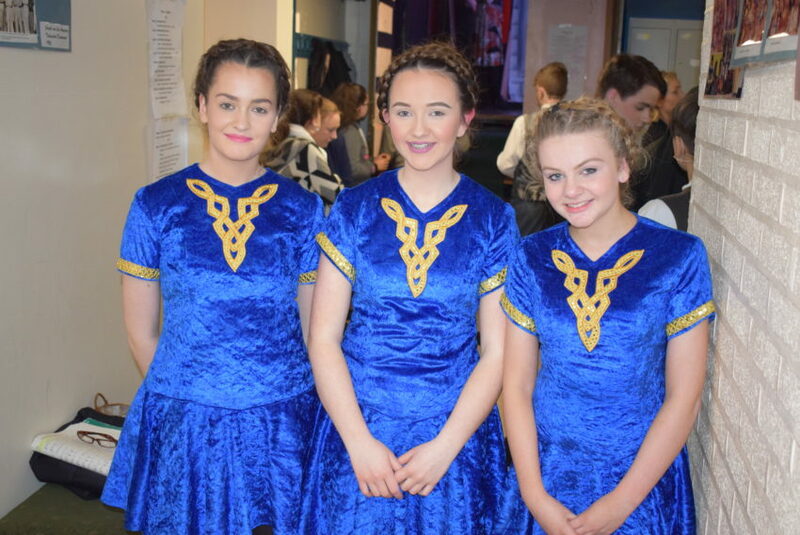 Well done to all the students and staff involved in the organisation of Friday’s Fun activities. 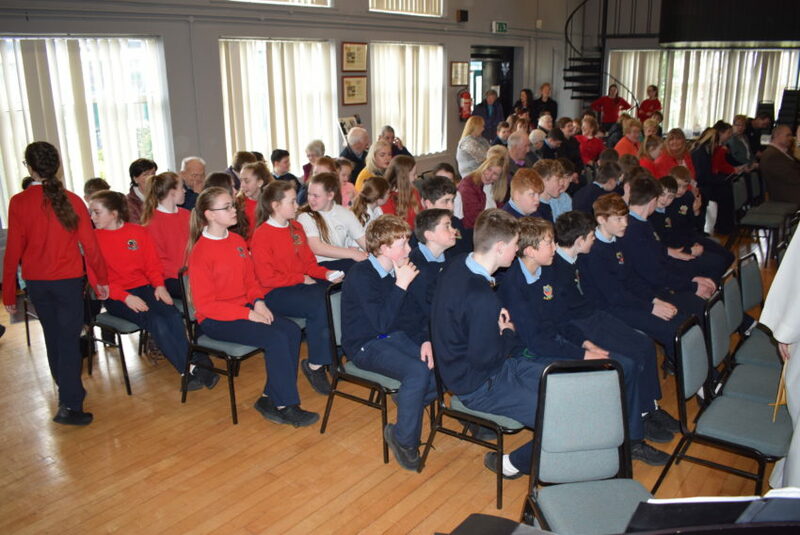 An extremely enjoyable morning was had by all in attendance. 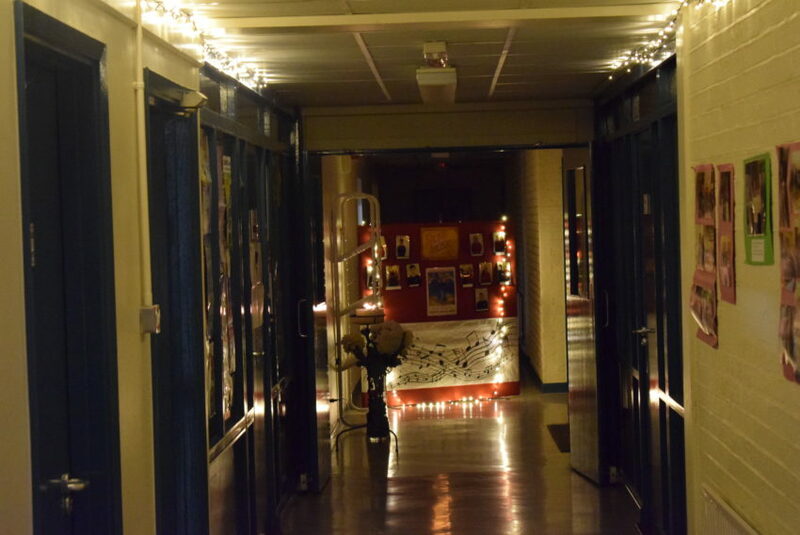 Attached are a few photos taken during the day. 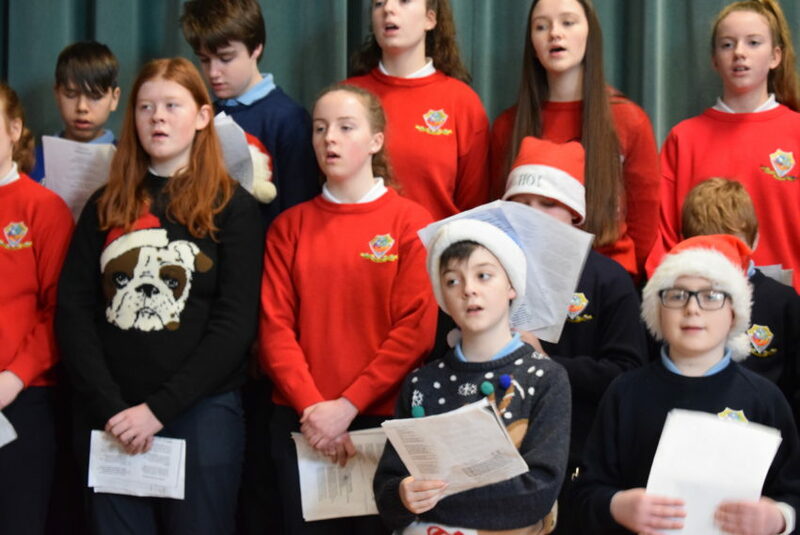 I would like to take this opportunity to wish all Dunmore Community School’s students, parents/guardians and staff a very Happy Christmas and a Healthy and Peaceful year ahead and thank you for your support during 2018. 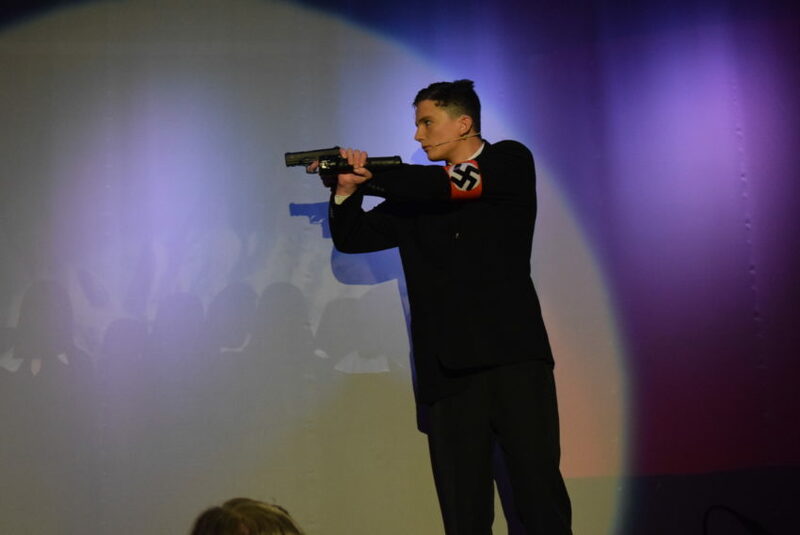 DQuinn.